Welcome to the Shoofly Archives! A Shoofly deck in Bay St. Louis around 1900. ​See the sidebar menus to browse for articles by date or subject. You may also use the search bar below - it accesses archived articles. 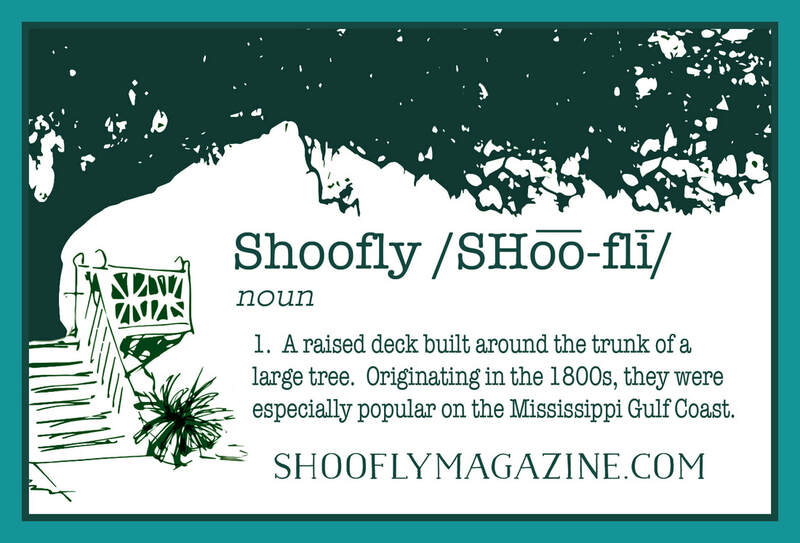 The Bay St. Louis Shoofly is made possible by reader donations and our generous and visionary sponsors. Supporting them supports us! Note: Comments on all archived articles are closed, but we love to hear from readers! Send comments to publisher@bslshoofly.com. 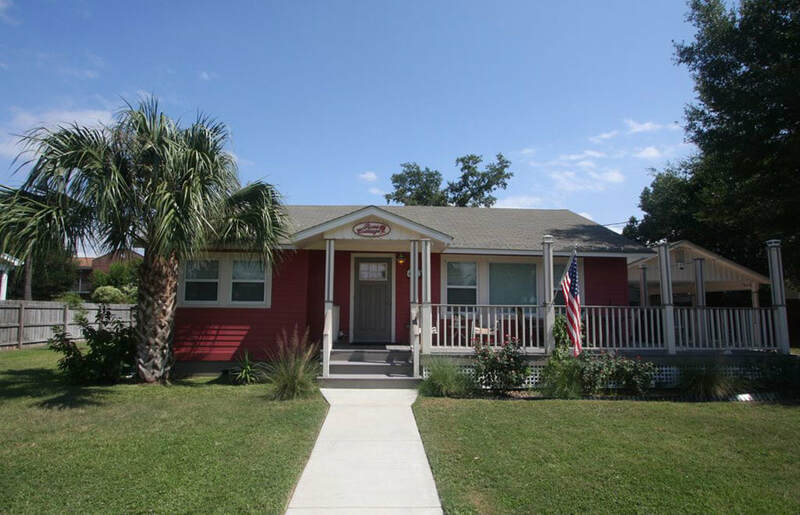 One of the most distinctive houses in Bay St. Louis has been renovated by and serves as home to a lifelong artist. 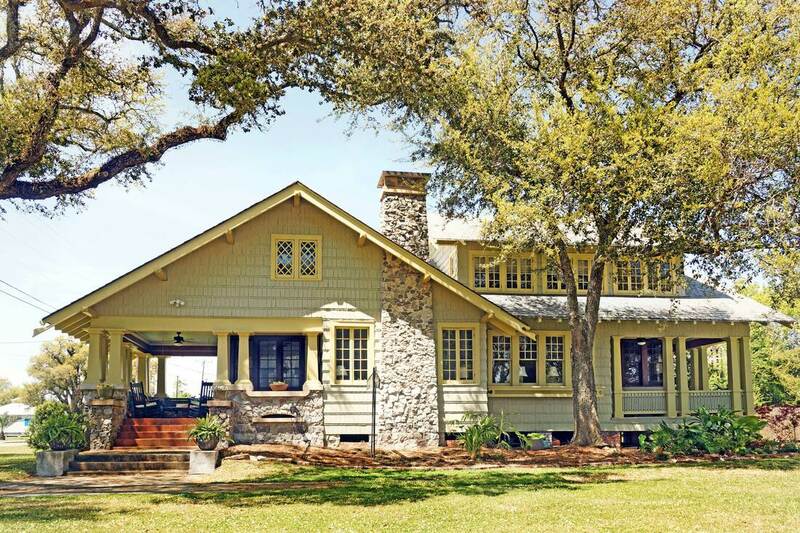 Who better to appreciate an extraordinary Craftsman style home in Bay St. Louis than an accomplished artist who twice served as director of the Craftsmen Guild of Mississippi? But if the match-up between Kit Barksdale and the house at 119 Washington Street is a perfect pairing, it was also a sudden one. The artist made the decision to buy the house in only a few hours. ​Three years ago, Kit was a part-time Bay resident, dividing her time between a small 1880s cottage on Main Street and her primary home in Jackson. Kit believes this side view might be the real "front" view of the house. ​Kit and sister Marilyn Mestayer often walked miles together through the Bay’s historic district – the conversation and their scenic routes made the exercise fun. Their path sometimes led down Washington Street where the two always admired the wood and stone cottage near the beach. The design itself is a standout on the coast. While Craftsman homes (mostly built from the 1890s through the 1930s) aren’t that unusual – few were constructed using stone, a material that had to be imported from hillier regions. 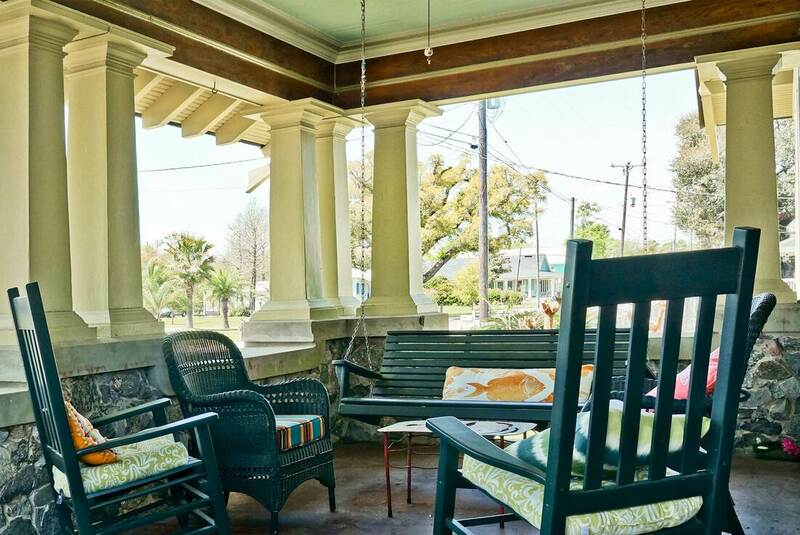 The stout porch columns over the stone foundation give the building a sense of permanence. Indeed, the house, built in 1909, was one of only two on the block to survive Hurricane Katrina. Yet, the home’s many windows provide a lovely counter-balance, welcoming both light and air. One day in 2016, Marilyn called Kit who was visiting in the Bay and excitedly shared the news that 119 Washington was going on the market. Both knew it would sell within hours because of its unusual design. Their prediction was correct. By the end of that day, Kit had a contract to buy it, despite the fact that it needed major renovation. There were the obvious issues. For instance, kitchen ceiling had collapsed, although it appeared that the sinker-cypress cabinets had survived. An inspection revealed more problems – including the fact that none of the sinks were hooked up to the city’s sewage system. Although there were no active termites, a lot of older termite damage would need to be addressed. Most other recognized architectural styles define the era in which they were built – Victorian, Mid-Century, and so on. The Craftsman name pays homage to the fine workmanship incorporated into the buildings. 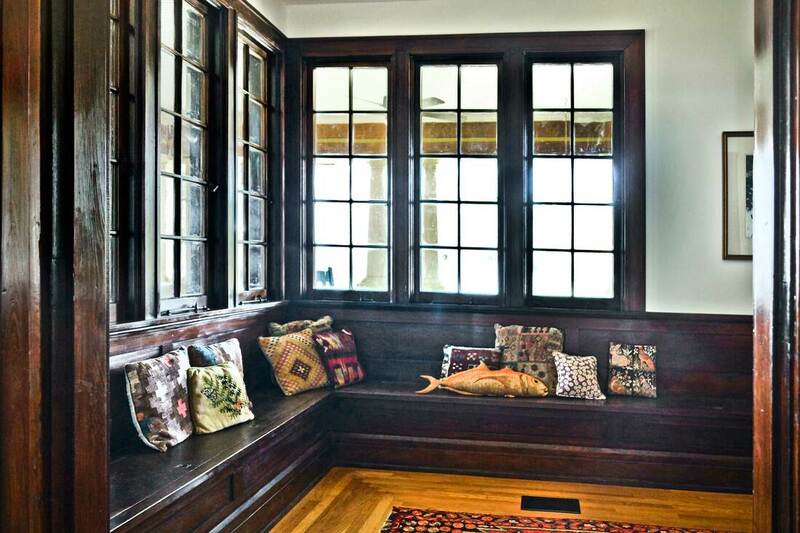 The Washington Street cottage is a particularly fine showcase. As one enters the house, the massive front door signals the delightful quality of craftsmanship to expect inside. The day I visited, Kit shows me that it’s actually a cunningly made Dutch door - a lever on the side allows the glass-paned upper door to separate from the lower solid part. 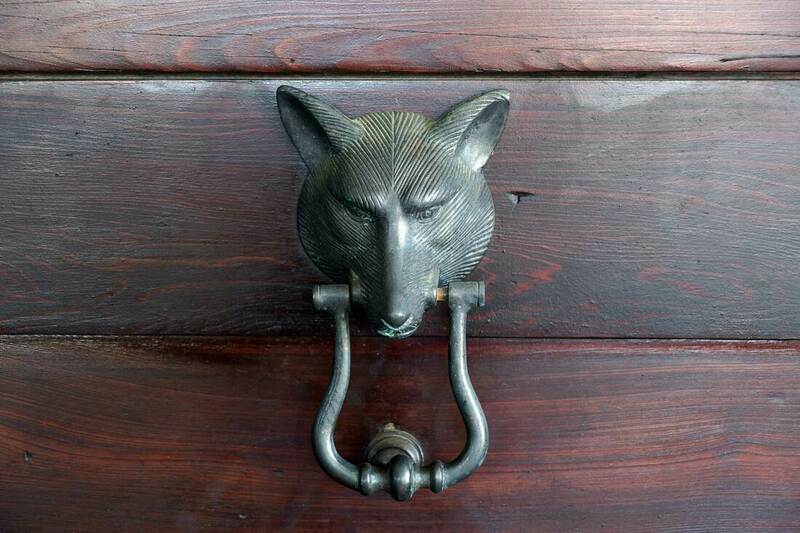 ​The door hardware – like that throughout the house - is dark metal that plays subtly off the reddish wood. It’s still functioning properly after a century of service. 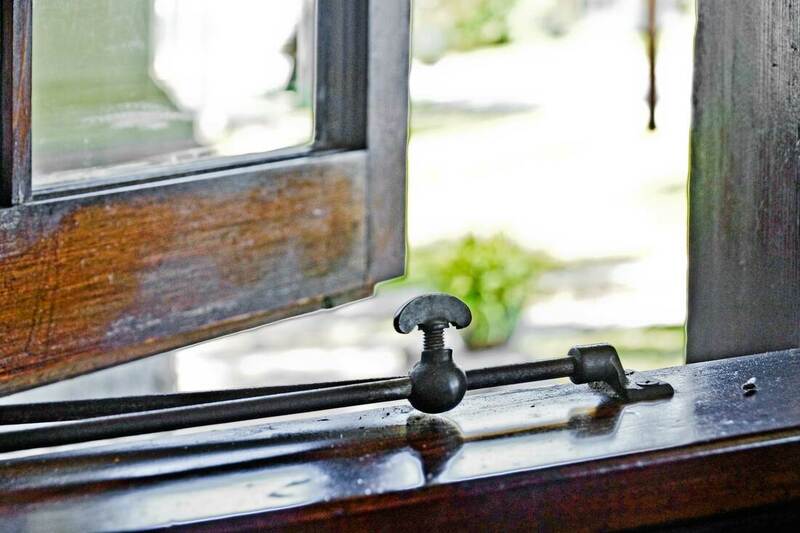 ​​Inside, most of the original woodwork trim – and there’s lots of it – has been left natural. Except in one room. Kit explains that although the dark woodwork trim, windows, cabinetry and doors in the house grace the rooms with an understated elegance, it also darkens the interior spaces – despite the many windows. The dining room at the heart of the house, visible even as one enters the front door, contained ceiling and wall trim in addition, making it something of a “black hole” at the heart of the house. Kit had considered painting all the wood in the house to lighten the ponderous feeling, but first consulted with local interior designer, Al Lawson, of Lawson Studio. Al pointed out that painting only the millwork in the dining room would achieve the effect she was looking for. Kit followed his advice. ​During the initial six-month restoration process, an under-the-staircase lavatory was the first room to be completed. Kit removed the sink to squeeze in a stacked washer/dryer combo (“If they ever break, the sink will have to come out again”). 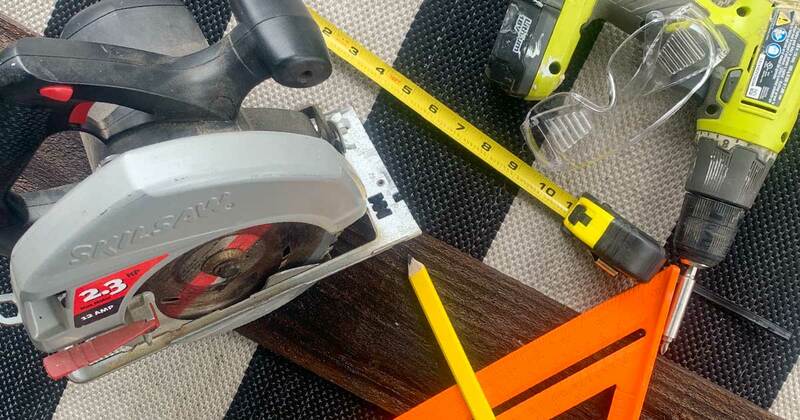 It became immediately apparent that maintaining a comfortable temperature in the home was going to be challenging - like “heating and cooling a screened porch.” Kit tackled getting the house properly insulated as one of her first projects. Extensive repairs had to be made on the exterior before painting – which required the use of tall bucket trucks to replace some of the eaves. She tackled the restoration of interior woodwork herself, without striving for absolute perfection in the upper story. 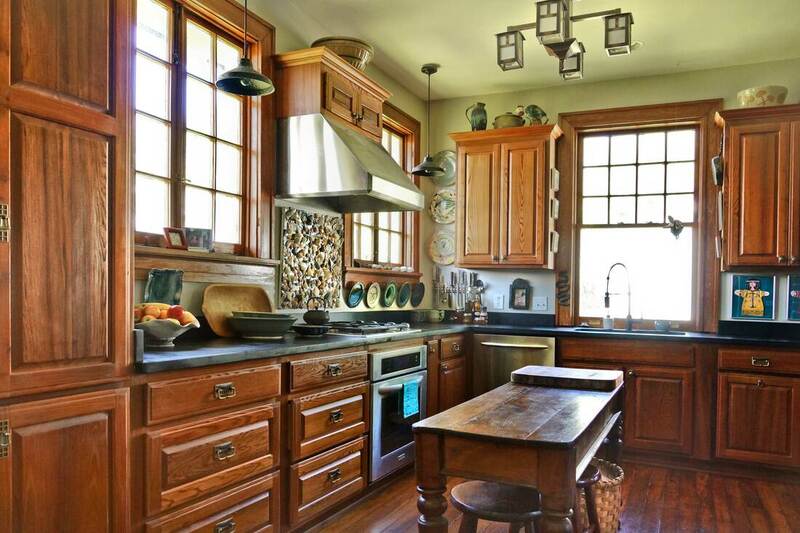 The sinker-Cypress cabinets in the kitchen survived a collapsed ceiling, although Kit replaced the hardware. Kit's background in fabric design allows her to make daring choices that make a room pop with unexpected energy. ​Kit had planned to move into the house while the work was being completed. But one day while she was painting upstairs, water started pouring through the ceiling. It turned out that the old HVAC system couldn’t handle the load. She counted herself fortunate that she’d been on site or she would have been dealing with another collapsed ceiling. Two new HVAC systems had to be installed, along with additional insulation. In addition to the dining room make-over, the entire 2300 square foot interior was repainted as well. Kit has answered that call. 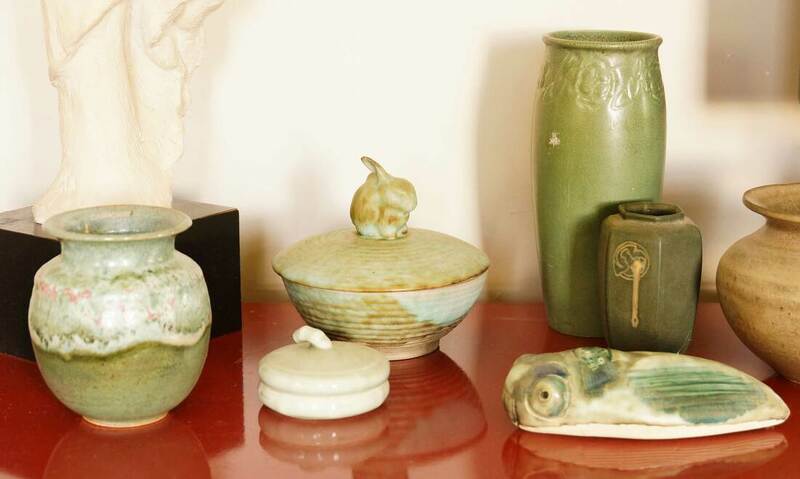 She began her art collection when she was twenty and hadn’t stopped for the last fifty years. While the collection ranges from traditional Choctaw basketry to contemporary paintings, she says the pieces have one trait in common. 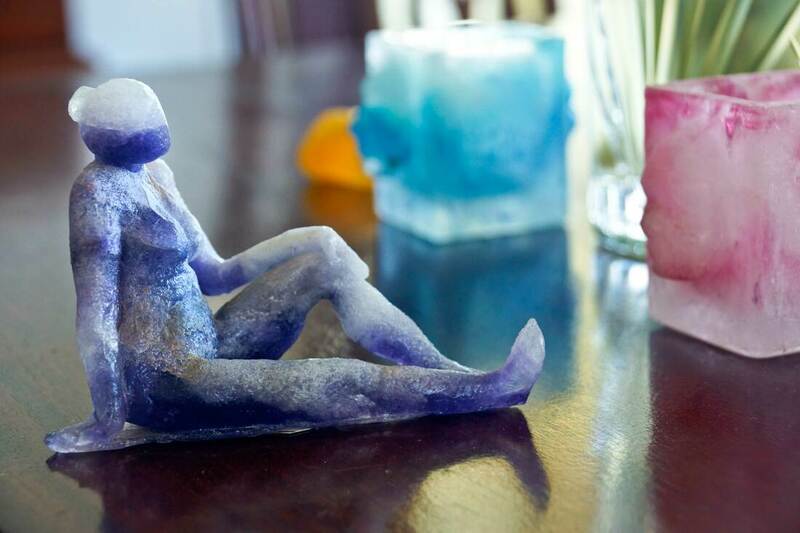 Much of her own work is on display as well – glass sculpture, photography, painting and pottery. Even mosaics. The showstopper in the kitchen is a stove backsplash Kit created from shells and dish shards she collected on the beach after Katrina. ​As a young girl growing up in Jackson, Kit wanted to be an artist from the time she was 13 (“Maybe I just liked making messes,” she jokes). She took art lessons from a “magical” teacher named Elsie Mangum, who introduced her eager student to painting and drawing. 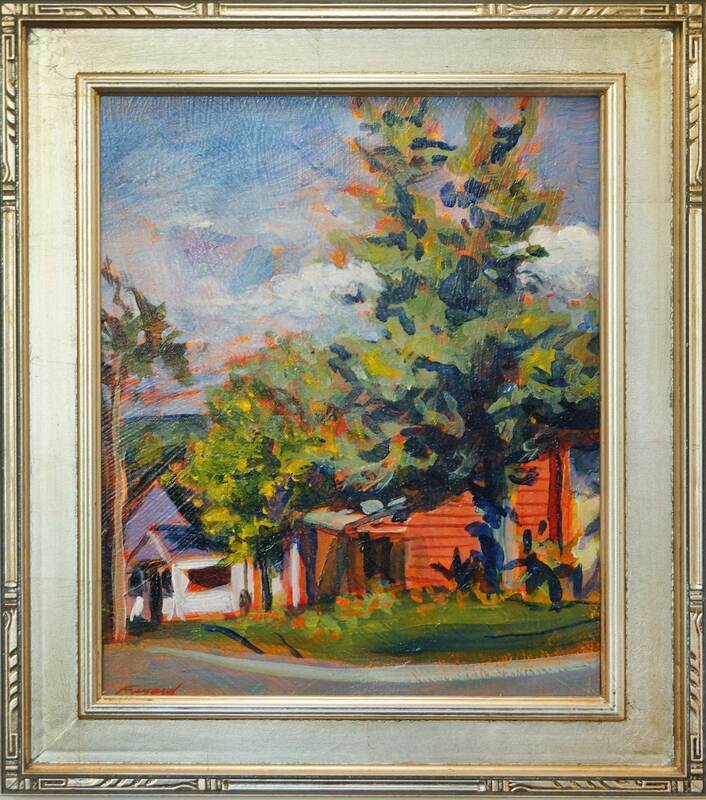 Later, while attending Milsaps, Kit worked as an assistant to the renown Mississippi artist, Carl Wolfe. She immersed herself in art, focusing on watercolors, fabric design and pottery. During summers, she studied at Memphis Art Academy. Kit also attended Mississippi University for Women before graduating from Ole Miss as an art educator with minors in history and English. Later in life, starting in the early 200os, she began studying art glass, twice attending The Studio of the fabled Corning Museum of Glass in New York state, where she studied with internationally recognized Donna Milliron. 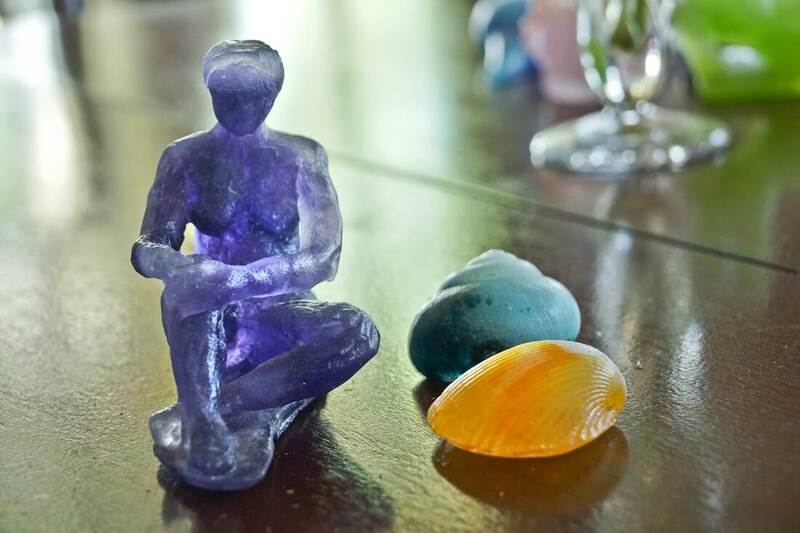 ​While there, Kit became part of a new “Garage Movement,” which advocated use of techniques and equipment that would allow glass artists to make a working studio in a garage. While Kit kept her artistic flame alive, her first career-track jobs involved promotion and marketing for state parks. That led her to eventually becoming director of the state craftsmen guild, where she helped raise seven and a half million dollars for a permanent crafts center in the state. Serious illness led her to resign the position. 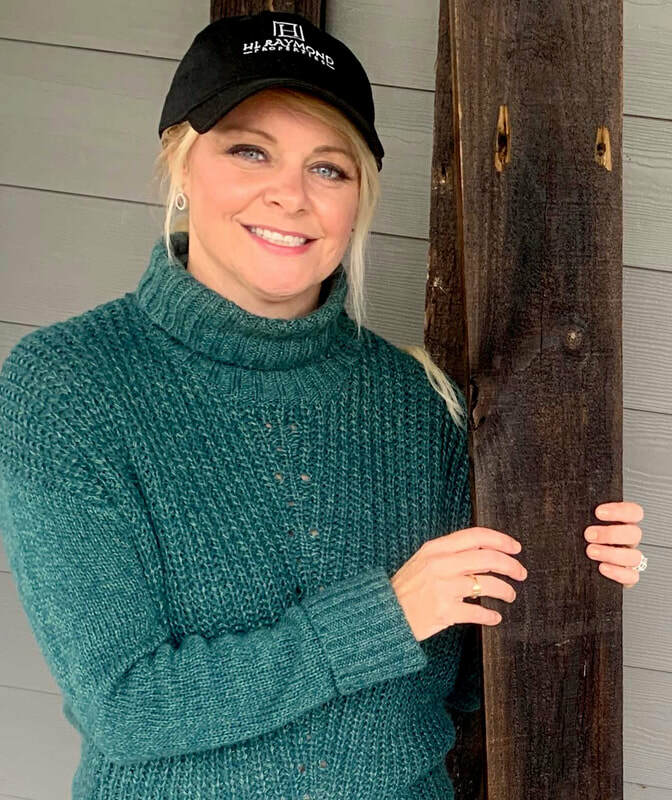 When her health allowed, she returned to the post and oversaw the construction and completion of what’s become a state showpiece in Ridgeland. She also worked for the state’s Wildlife and Fisheries agency, where she was one of four people to write a program that helped people with developmental challenges to have outdoor experiences. The team was recognized with a prestigious Governor’s Award. She calls that “the most fun job I’ve ever had in my life.” Kit has also served as state director for the Mustard Seed Foundation and later, as president and CEO for the Mississippi Make-A-Wish Foundation. Now the main restoration of the Craftsman cottage is complete, Kit’s finally enjoying a more relaxed coast life – spending time with her grandchildren and playing bridge. She’d like to return to her glass work and painting – on canvases this time instead of walls. But she sees the house as a continuing artistic project. Does a baby necessarily mean curtailing your travel schedule? No - or at least, not yet. My husband and I believe that you shouldn’t stop living after having a wee one; just fit the baby into the life you already have. 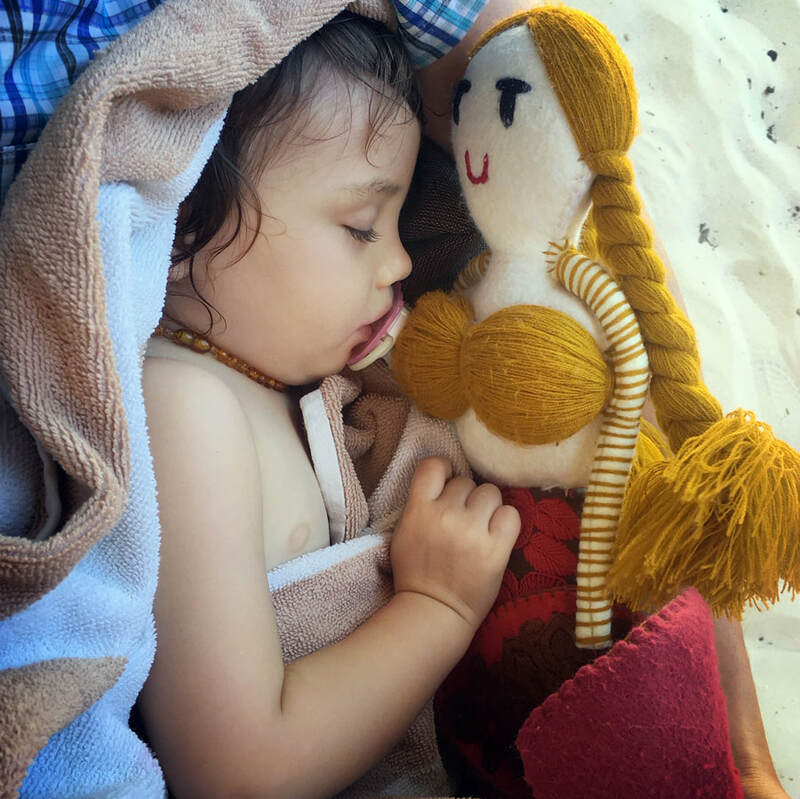 But after I took Pearl to Frida Fest (and drew a uni-brow on her) at two-weeks-old, someone told me that you really shouldn’t leave the house with a baby until they are around six weeks old. ​That seems like an awfully long time to be cooped up to me. Before Pearl was born, I was planning her first trips. My husband has a passport picture where his mother is holding his head up because he was less than a month old. We waited a little longer for Pearl’s passport – try getting a photo of any six-month-old baby while they’re not making an expression. Click here and scroll down to read archived Mother of Pearl columns. World travelers Pearl and Grace. ​Our first major plane trip was an adventure to Hawaii a few months before that. My husband has family there, so we wanted to show off our new bundle. In the airport, you get all sorts of special treatment when traveling with a small baby. We were granted the TSA Pre-Check for every flight, which meant keeping our shoes on and not having to unpack our electronics, which was heavenly. No questions asked about liquids because: baby. It also turns out a pram-style stroller also doubles as an excellent luggage caddy. Even peacefully sleeping babies like Pearl strike fear in the hearts of air travelers. ​Also, no passengers really want to sit next to you for fear of the meltdowns, so you almost always have extra seats around to stretch out. 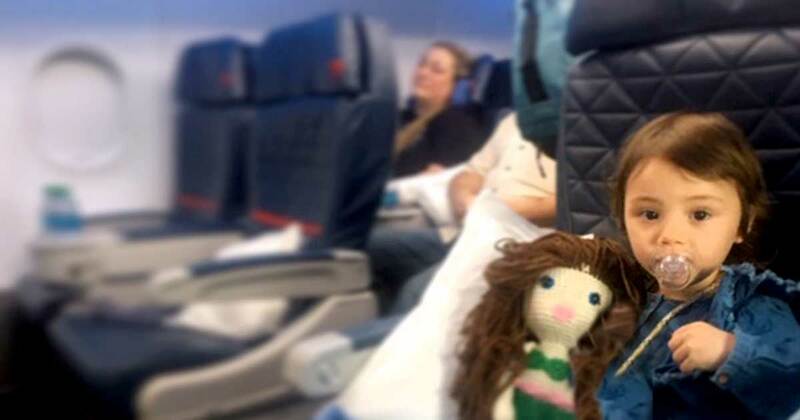 On some flights, you can even request a bassinet. The old wives’ tales are true about babies flying. Make sure the wee one is nursing or taking a bottle as the flights are ascending and descending to relieve the pressure on their little ears. Also, iPads and phones (with headphones for the kid) are key, and don’t worry about all the judging looks. Everyone will thank you later. 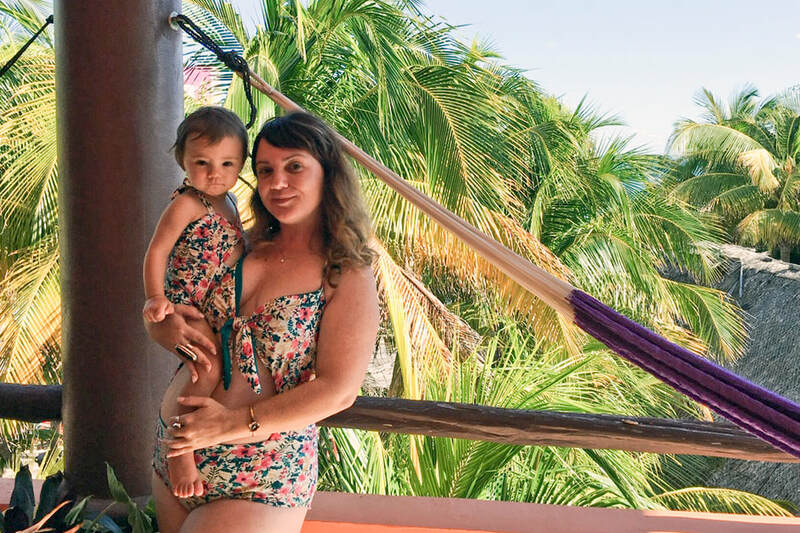 Once in Hawaii, we didn’t let having a baby in tow stop us from doing what we wanted to do. We went out for meals and shopped, of course, but we also went snorkeling on a tour boat and hiked up volcanoes. 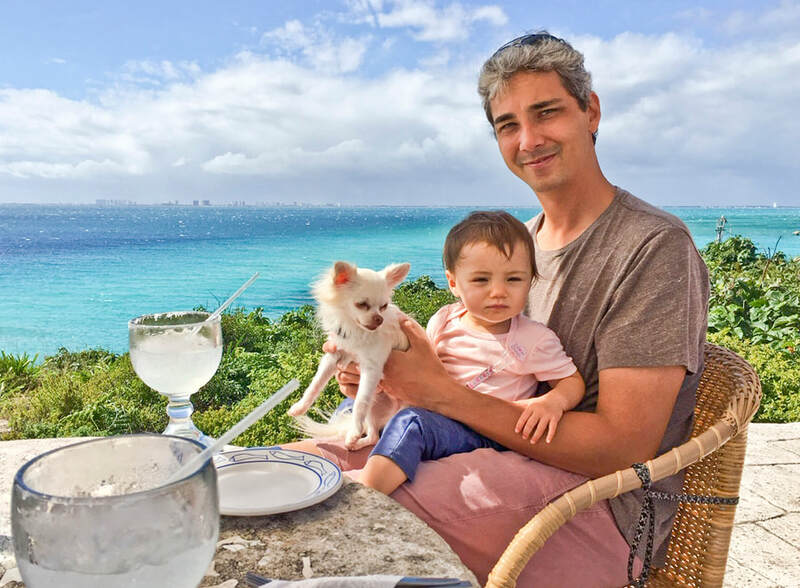 When Pearl was one and a half, we took her and our pooch Presley to Mexico. Have you ever tried bringing a Chihuahua INTO Mexico? Of course, not. Who would be so silly? We got loving looks all through the airport, until we got our bags. 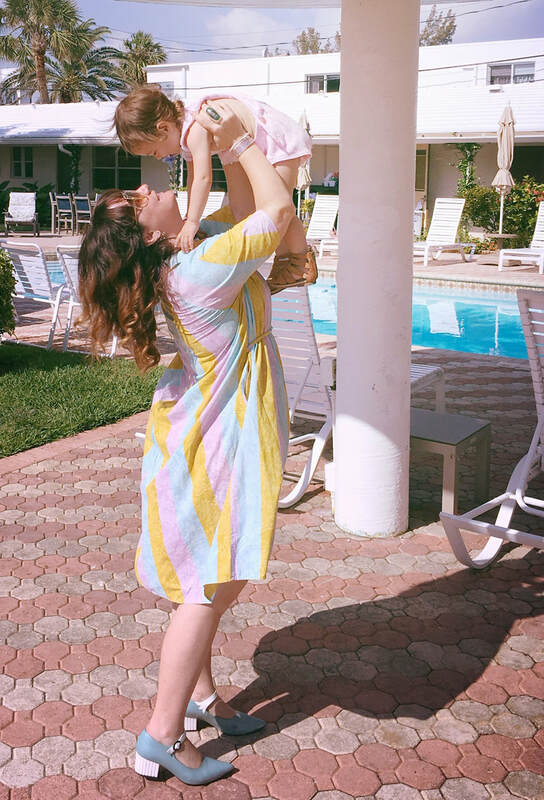 I could see the palm trees swaying in the distance and my mouth was watering for a margarita when a guard tapped my husband on the shoulder and motioned for us to follow. My husband, Christian, gave a slight smile as my eyes got big. We had a stack of paperwork from Presley’s vet in preparation for the trip, and now it was time to show these government officials we’re all up to snuff. Have you ever been detained in a small room in an airport with a small dog and a one-year-old? Of course not. All of the sudden I was itching all over. The guard came in and I recall holding Presley’s little paws so he would not be tempted to give a quick scratch behind his ears. Presley, Pearl and dad Christian in Mexico. ​​After a few questions, a stamp on a paper and a big sigh of relief, we were on our way to the hotel. Once there on the island, we saw the preferred method of transport was golf carts – just like home! Pearl and Presley knew the drill, and we strapped them in and took off to find the nearest frozen drink. We’ve found that no matter where we go, for the most part our little family follows along just beautifully. Her father, who has been to almost 80 countries, says this part of the world is his favorite. So maybe Pearl is simply learning early there really is no place like home. A Mexican seafood feast fit for a queen. These four wheels transported books to readers - and readers to untold adventures. My earliest memories of reading are inextricably intertwined with the smell of gas and oil. From the age of three or four to my teen years, the bi-monthly visit by the Somerset County Bookmobile to Davidsville, Pennsylvania, was the highlight of my week. ​During the summer months, when the local grade school and high school were closed, so too were their libraries. The bookmobile became the motorized link, clutch and three gears, to literature for readers in our town. Click here and scroll down for archived Bay Reads columns. 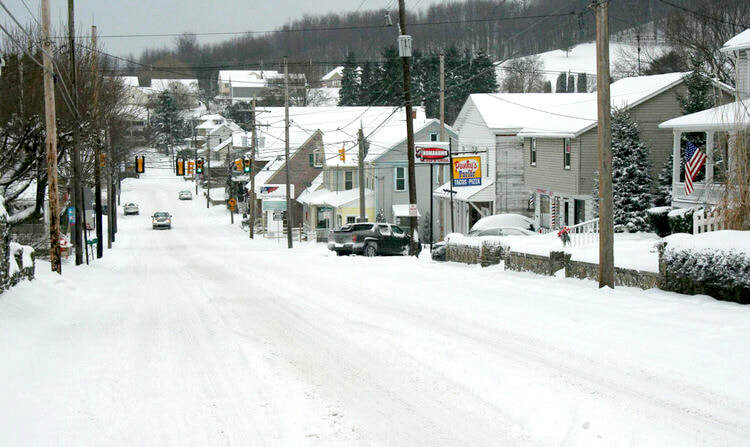 Davidsville remains a small community in western Pennsylvania. It was founded in the 1830s, German stock, dairy farmers, and a dry town, not by law, but because it was considered prudent to avoid spirits. The Lutheran church at the top of the hill at the eastern bend on Main Street recently celebrated its dodransbicentennial (175 years). My relatives from the early eighteenth century are buried in its cemetery. ​Main Street, logically, is the main thoroughfare. In the winter after a heavy snowfall, it had just the right slope to serve as our sled-riding racetrack. After it was plowed, scraped clean and salted, we moved to the cemetery to ride our sleds in the deeper and fluffier snow. Too young to know it then, but this was only the first in a lifetime of blasphemous acts on my part. A bookmobile is a vehicle, often a truck, and nowadays possibly a tractor trailer, designed for use as a library. Books are transported to readers, often in rural or underserved areas, encouraging reading, engagement with ideas, and literacy. 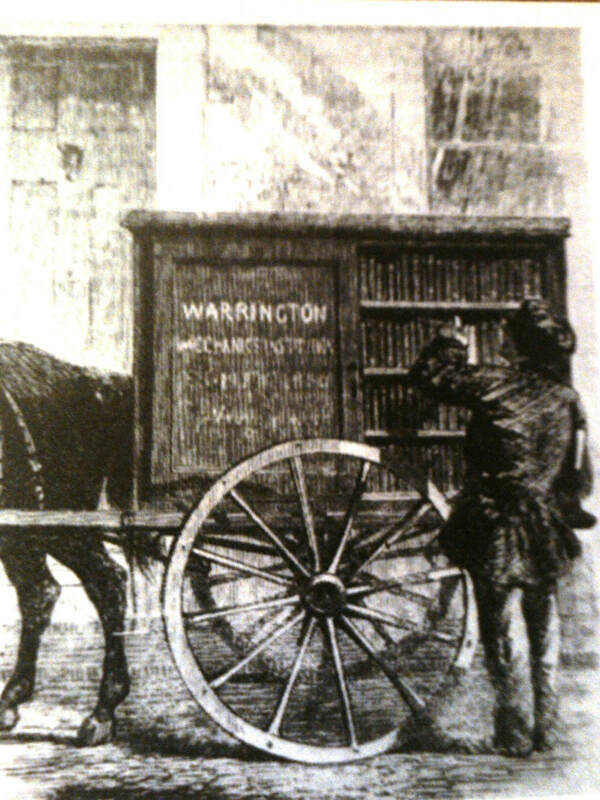 One of the earliest mobile libraries, a horse-drawn book cart. ​The first bookmobile, or horse-drawn book cart, dates to 1839. 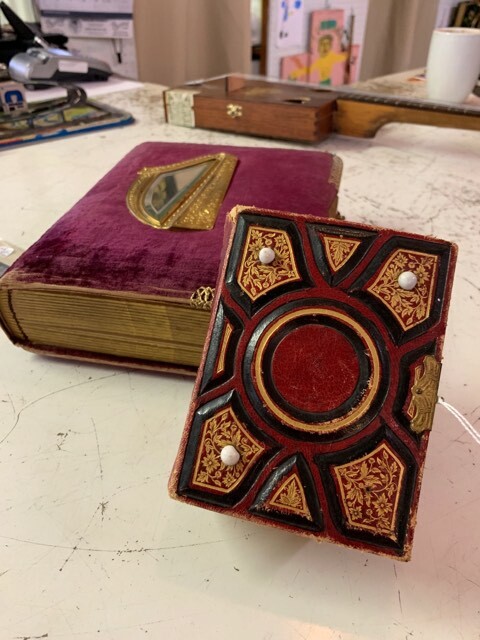 It was a frontier traveling library in the western United States, established by the publishing house of Harper & Brothers, known in the present day as HarperCollins, one of the world’s largest publishers. ​Like so many childhood memories recalled through a hagiographic lens, I assumed that the Somerset County Bookmobile was a thing of the distant past. Fortunately, I checked. The big red creaky behemoth, dually tires on the rear, has been replaced with a long bright heavy-duty truck, green, blue, and bright, with large lettering shouting BOOKMOBILE. Literature still rolls among the Appalachian Mountains of Southwestern Pennsylvania. Among the many pleasant memories of childhood, those connected to reading and books are most vivid. I easily recall the two steps up through the tall bi-fold doors into the bookmobile as big ones for a young lanky boy. Once inside, it was a paper cocoon of hardback books, shelved spines out, with the identifying Dewey Decimal number easily visible taped on the lower outside edge. There was order in this little bus, comfort, tidiness, with a small card catalog as a guide. All questions and conversations were whispered to the librarian/truck driver. She had a small desk attached to an interior half-wall behind the driver’s seat. I’ll call her Mrs. Blough, because that was likely her name if it wasn’t Mrs. Kautz. 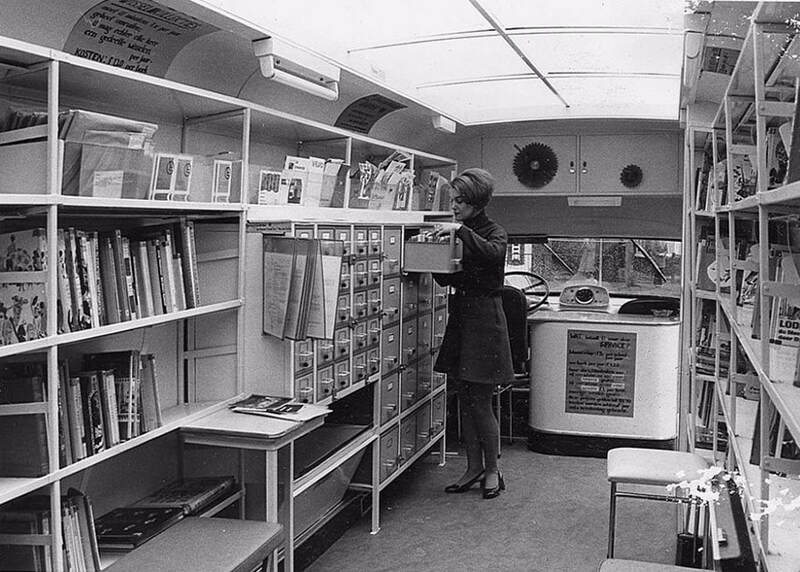 Interior of a 1960s-era Bookmobile. Over the summers I read through Charlotte’s Web by E.B. White, The Hardy Boy Mysteries, and the crime-solving of Encyclopedia Brown. 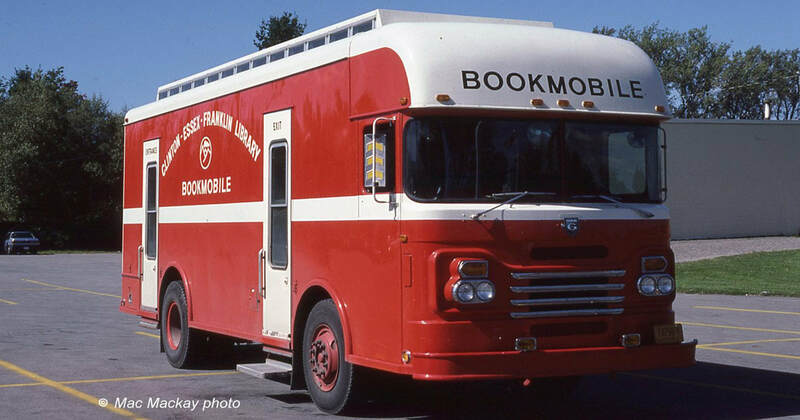 By my preteen years, I discovered Thomas Paine and The Age of Reason, John Steinbeck’s The Grapes of Wrath, and Mary Shelley’s Frankenstein; or, The Modern Prometheus from this faded red bookmobile. Bram Stoker’s Dracula could only be properly read late on a hot summer night. Stoker’s writing style oozes succulent prose deepening the darkness of midnight reading under a small bedside lamp while building suspense, horror, and trepidation for the appearance of the dark, flowing cape of the titular, fanged vampire. Four books a week was a tad light for me even at nine years old. I was able to read eight a week once I convinced Mrs. Blough that I was also checking out books for my mother. To legitimize the additional four books, I wrote them on a notecard before entering the bookmobile. I pulled out the list after obtaining the first four books I wanted and then pretended the books listed on the notecard were for my mother. Honestly, I never felt that I was fooling Mrs. Blough. My mother was unknowingly the best-read adult in Davidsville. Serendipitously, the bookmobile always parked in front of Main Street Bakery. A stack of books, chocolate milk, and a warm cinnamon-sprinkled donut and I was content. Would life ever be better than this? When the scheduled two hours had passed, Mrs. Blough would secure the rear and side doors, then climb behind the large steering wheel. Sitting stiffly upright, hair tightly pulled up into a peppery gray bun, she would depress the clutch and crank the engine. While grinding the engine into first gear, Mrs. Blough, librarian and truck driver, steered our bookmobile onto Main, popping the clutch as she headed north over curvy, hilly roads to the afternoon stop in Stoystown. Permanent gallery space at Century Hall an attractive, welcoming venue for local artists and art lovers alike. 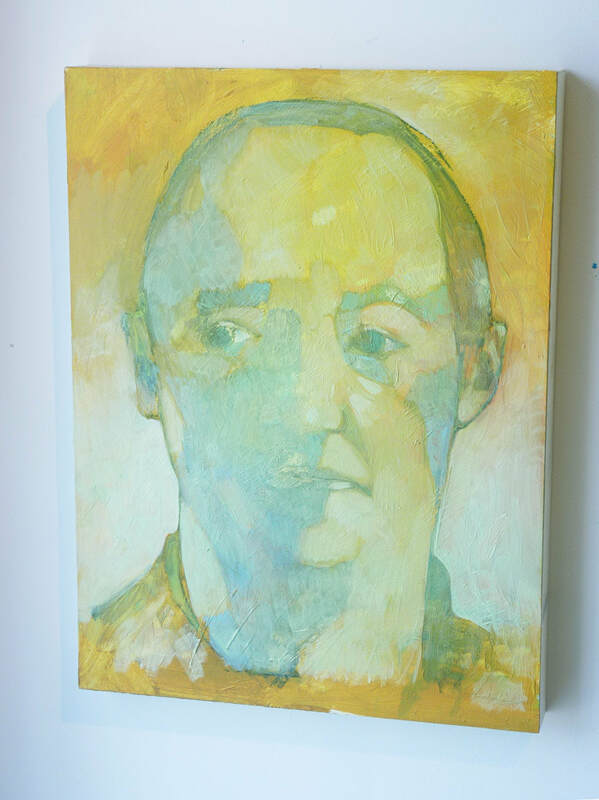 Liz Schafer is one of more than a dozen artists featured in Gallery Edge. 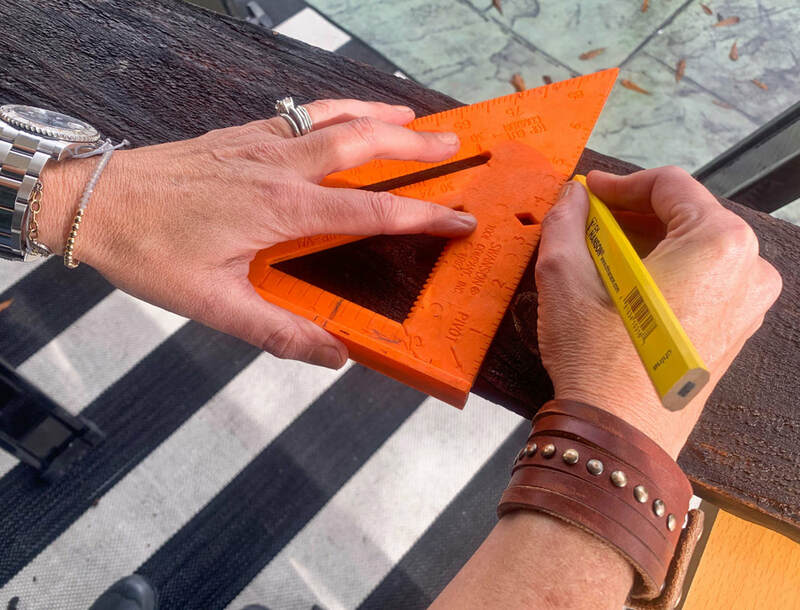 ​While the arts are a cornerstone of the Bay Saint Louis community, there are just a handful of spaces where contemporary artists can exhibit their creations. ​Now there is another permanent gallery, on the second floor within the Shops of Century Hall: Gallery Edge. 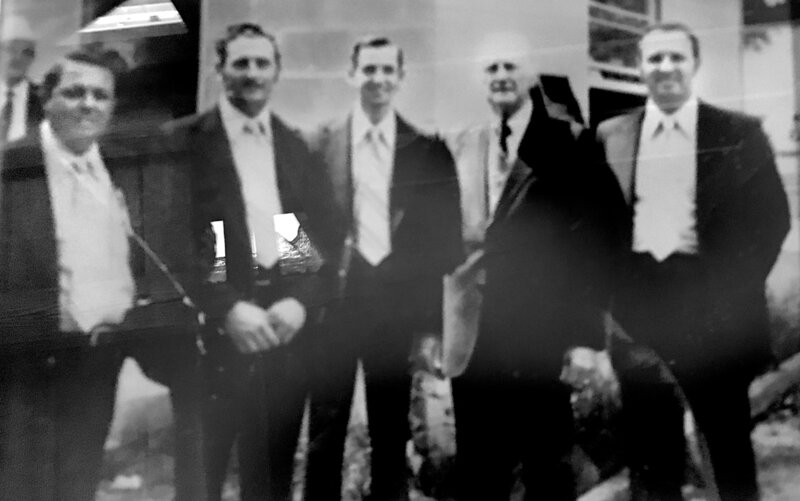 ​The building that houses the Shops of Century Hall has a colorful history. The structure was built in 1909 as the meeting house for the Woodmen of the World, a “Benevolent Secret Beneficiary Fraternity.” Over the course of more than a century, the “WOW Building,” as it was nicknamed, housed boxing matches, receptions, and even served as the headquarters for the Sea Coast Echo newspaper at one time. Click here and scroll down for archived Arts Alive stories. 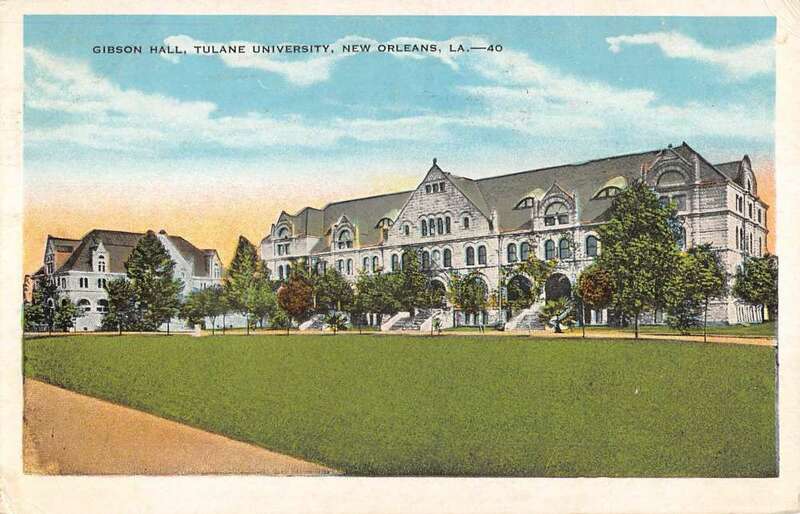 In 2005 the building suffered at the hands of Hurricane Katrina, and after a three-year renovation it was reincarnated as the Shops of Century Hall. The Century Hall building is a formidable yet inviting structure. A wide porch and balcony grace the façade, beckoning visitors to explore the eclectic shops inside. As you cross the threshold into the vestibule, the scale of the building is evident: sturdy, hand-hewn beams crisscross above and around you, and the comforting aroma of aged timbers beckons you to enter – and explore. Once inside, decisions must be made immediately: Do you follow a short flight of stairs that lead up, or the stairs that lead down to the lower level? Both levels feature tasteful antiques, original art and home décor items, but a glance upstairs reveals an austere white room: Gallery Edge at Century Hall. We ascend the stairs, anticipating what’s in store. Gallery Edge is inside Century Hall, 112 S. Second Street, one of the most fascinating historic buildings in Old Town. ​Gallery Edge started as a collective of ten artists. 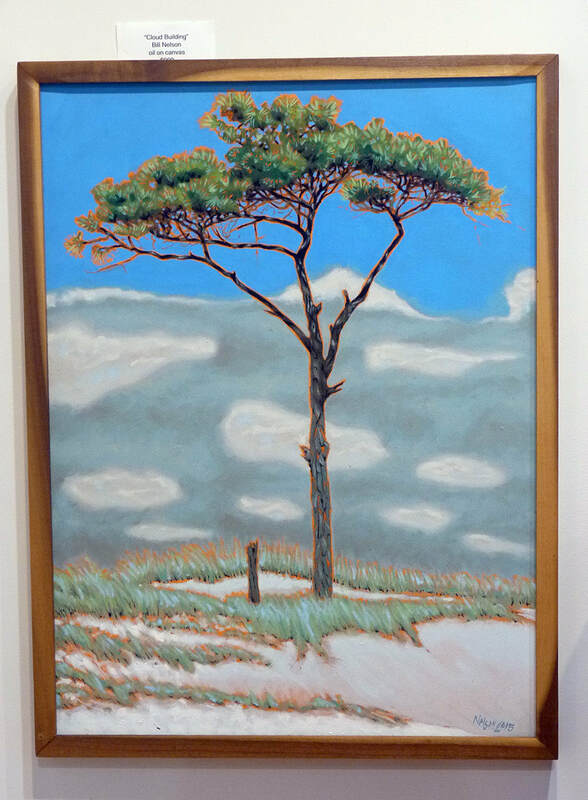 Spearheaded by Bay St. Louis artist Kerr Grabowski, the space was converted into a gallery. The collective disbanded a year later, but Susan Peterson, manager of the Shops of Century Hall, didn’t want the space to revert back to retail. Susan Peterson, manager of the Shops of Century Hall. Gallery Edge will be open late on the third Friday of each month for special exhibits highlighting the work of one featured artist. These showcases allow the artists to display a broader representation of their work rather than just a few key pieces. “It also gives the artists a chance to talk about their work and make that human connection,” added Peterson. 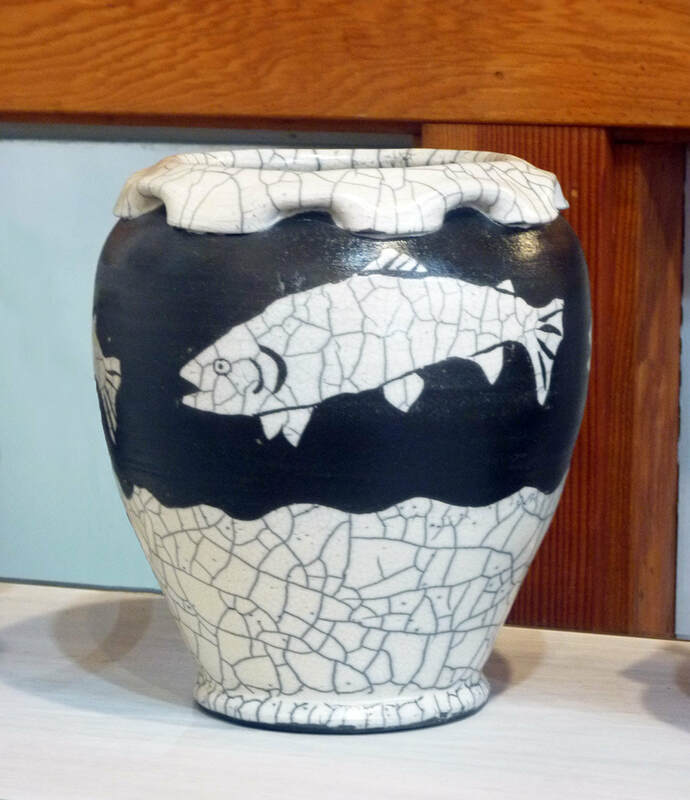 Stacey Johnson, ceramics artist from Biloxi, is well represented in Gallery Edge. Beautiful Roku pottery by Dale Simmons. Surreal landscape by Bill Nelson captures the glow of sunrise. Pensive portrait by JJ Foley peers out a window, as if lost in thought. Susan revealed another surprise at the Shops of Century Hall: a third level of retail shops is preparing to open soon. This bright, newly renovated space features walls adorned with elegant reclaimed Victorian-era tin (from the building’s original ceilings). It’s a fitting backdrop for the antiques, collectibles and décor items on display within. There is little question, however, that Gallery Edge is Peterson’s passion. Susan Peterson welcomes visitors to The Shops of Century Hall. During the Second Saturday Artwalk each month in Old Town Bay St. Louis, you'll find cool deals, fresh meals and lots of art and live music! This month we are featuring some of Bay St. Louis's best hotels, inns and B&Bs, rather than one or two local businesses. For a week at the beach or a romantic weekend getaway, check out this list of the "best of the best." ​About Second Saturday: Over the past 24 years, the monthly artwalk has become one of the most popular events in the region. Old Town stays lively all day, with many merchants and restaurants offering specials. 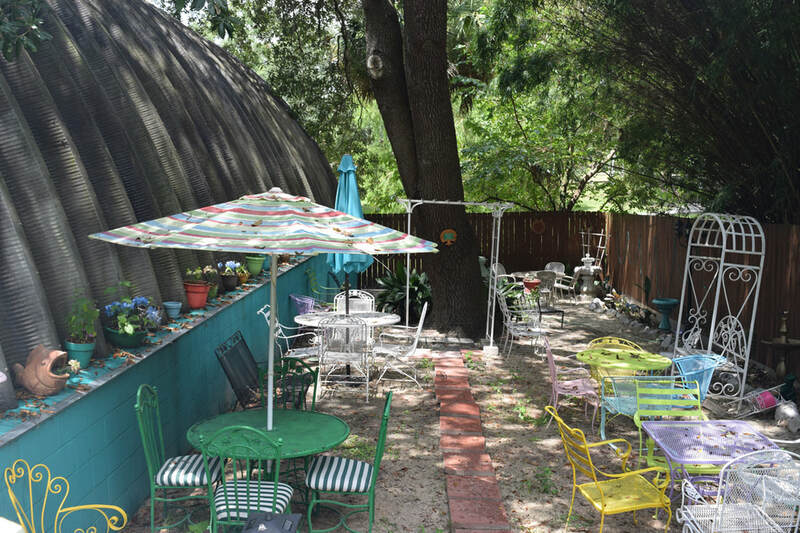 This adorable bed and breakfast, located on Beach Boulevard, is one of the best on the Gulf Coast. With a view of the Bay St. Louis Marina, the beach, and just minutes away from the great shops and restaurants in Old Town, you cannot beat its location and charm. 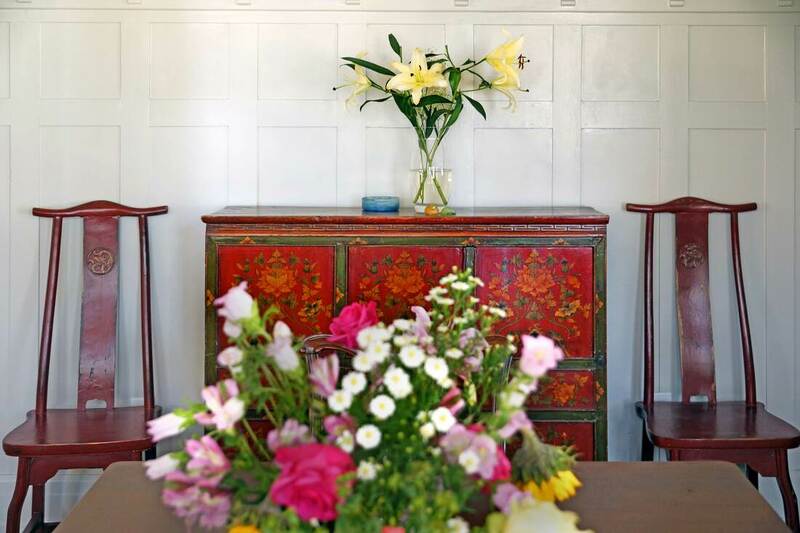 The inn is also beautifully decorated at all times by owner, Nikki Moon. Stay in this luxurious bed and breakfast and enjoy all that Bay St. Louis has to offer. Walk to the shops and discover something unique for your friends and family, and enjoy delicious food and drinks at one of the many local restaurants. 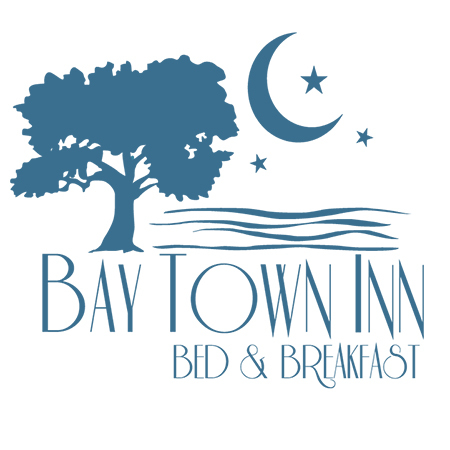 Bay Town Inn features ten guest suites of over 500 square feet which each include a kitchen and living area, full bath and bedroom with a king bed. Many of these king suites offer a beautiful view of the pool and courtyard as well. There is also the poolside accessible room which features two double beds, a large bathroom, and a kitchen area. 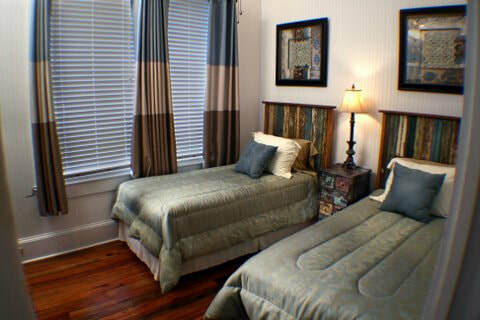 The second floor "Lighthouse Room" is over 700 square feet with a queen bed, sofa-sleeper, full bath and kitchen area. This spacious room also features its own private deck. In true bed and breakfast fashion, the Inn serves full breakfast room delivery on Saturday and Sunday, and a lighter breakfast during the week. Enjoy a homey atmosphere and relax in a luxurious waffle-weave robe which you will find in each room, as well as fresh flowers during your stay. Every room also features complimentary Wi-Fi, a small refrigerator and freezer, a microwave, coffee maker, and an iron and ironing board. Each bathroom offers a full size tub and shower, and shampoo, soap, lotion, and a hair dryer. You will find practically everything that you may need. There is a minimum 15 year-old age requirement for guests and visitors, and a limited number of dog-friendly rooms, so make sure to check availability. Countless testimonials speak for the charm and luxury that you will experience when you book your stay at the Bay Town Inn. You can visit the website at baytowninn.com for more information and booking. Nikki Moon will make it her pleasure to make your stay comfortable and enjoyable. 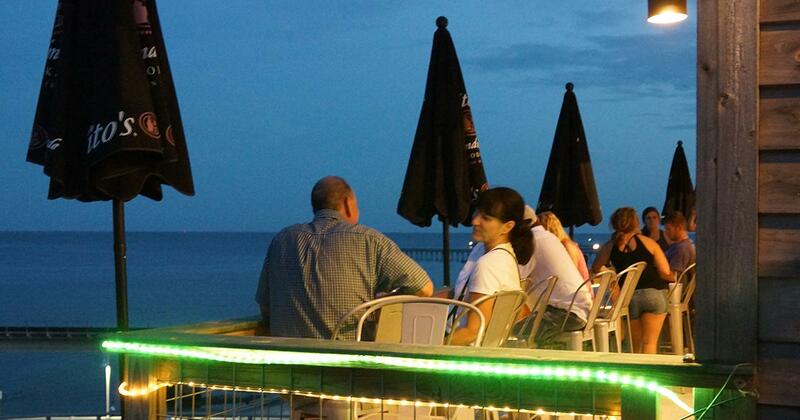 You are sure to experience the best of the best here and fully enjoy Old Town Bay St. Louis! 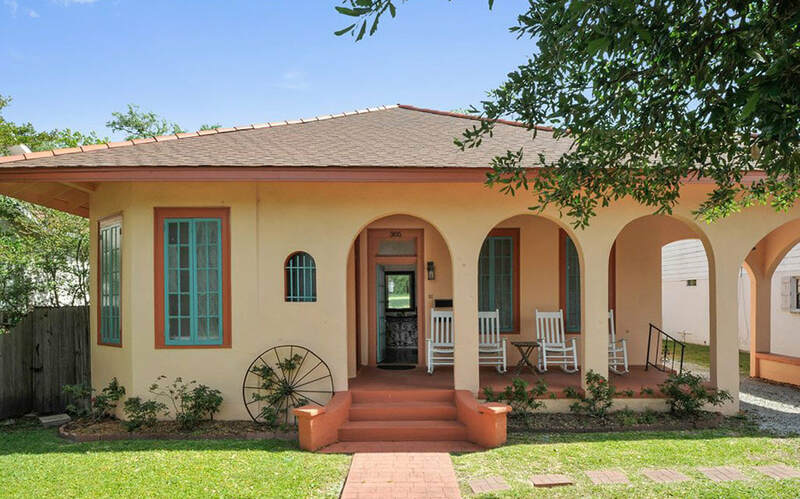 ​The Bay Cottages, owned by Ronnie and Sandy Robert, are the perfect place for you to stay if you would like to experience Old Town Bay St. Louis like a local! Besides its fantastic location, these apartments are ideal for families to rent for large gatherings such as weddings. “It’s the perfect place for extended families because they can rent both sides” Sandy Robert explains. The couple began renting out the cottages several years after Hurricane Katrina, and since then, have had many wonderful guests. A lot of these guests have since decided to purchase homes in Bay St. Louis themselves! This was Sandy’s ultimate goal, so she is more than pleased with the success of the charming cottages. 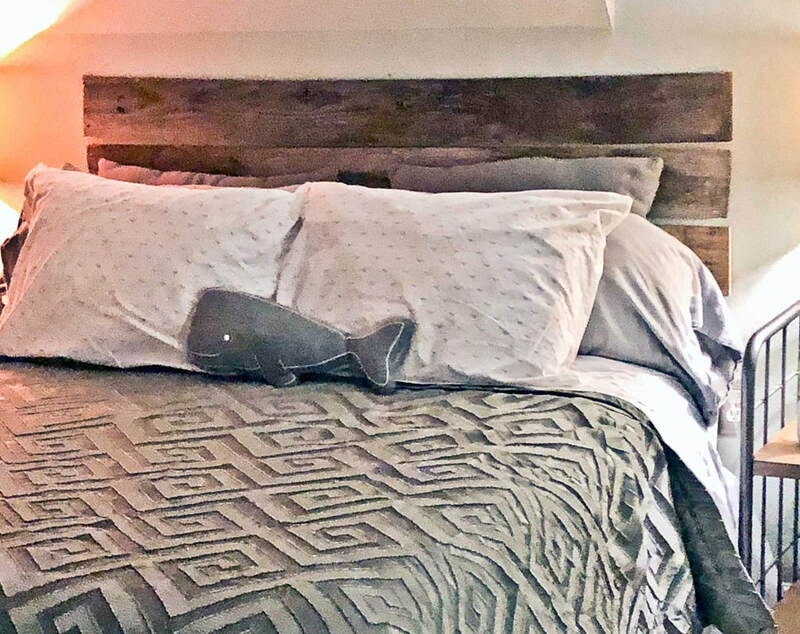 Enjoy “beautiful hardwood floors, beaded board walls and ceilings,” and comfortable furniture, and make yourself at home in one of the apartments. 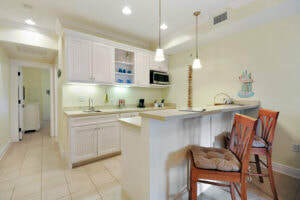 Each apartment features one full bath with a tub and shower and one half bath, a fully equipped kitchen, including cooking utensils and dinnerware, a washer and dryer, cable, flat screen television and DVD player, and Wi-Fi. ​In the Latitude Adjustment accommodation you will find one bedroom with a queen bed, one bedroom with two twin beds, and two twin size sofas in the living room. In the “Southern Comfort,” sleeping arrangements include one bedroom with a queen bed, one bedroom with two twin beds, and one queen sleeper sofa in the living room. There is also a shared front porch and back deck for you to enjoy the outdoors. This location is perfect, as you can view all of the action right from the front porch or walk into town to experience the one-of-a-kind shops and restaurants all within blocks of the cottage! 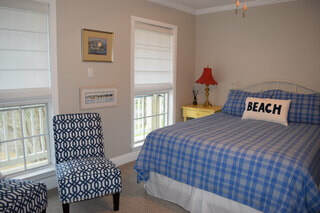 The cottage is also two blocks from the waterfront and less than a half mile from the public beach and fishing pier. 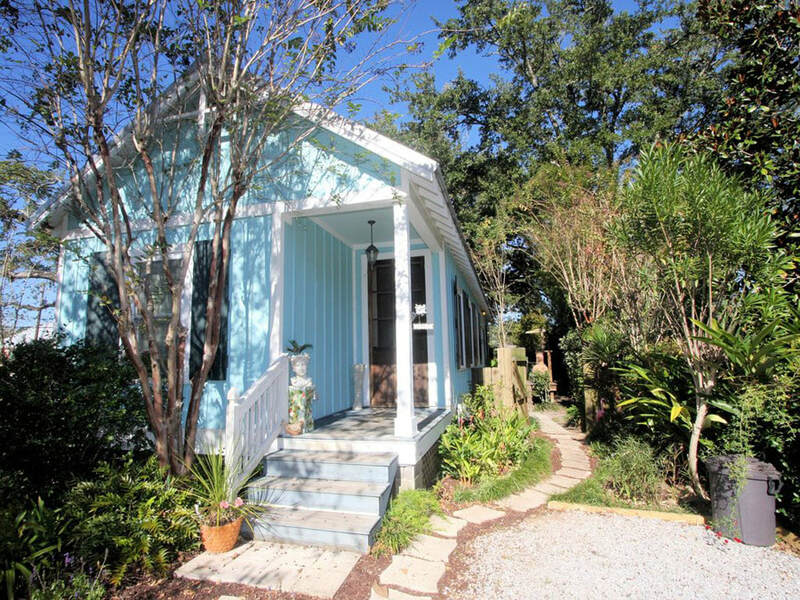 Bay Cottages will allow you to experience Old Town Bay St. Louis in the best way possible. The combined comfort and location make for the perfect vacation rental. You can visit the website at baycottagesllc.com for more information. Book your stay today! 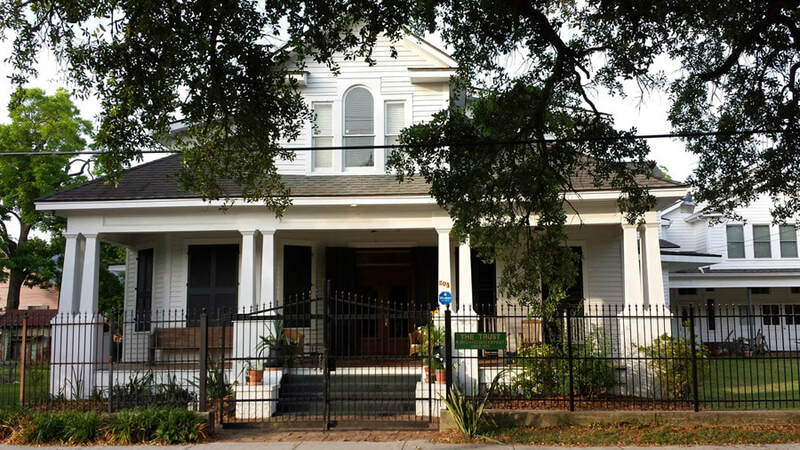 Carroll House Bed & Breakfast is owned by Jane Alford-Kulpeska and can be found on Carroll Avenue in Old Town Bay St. Louis. 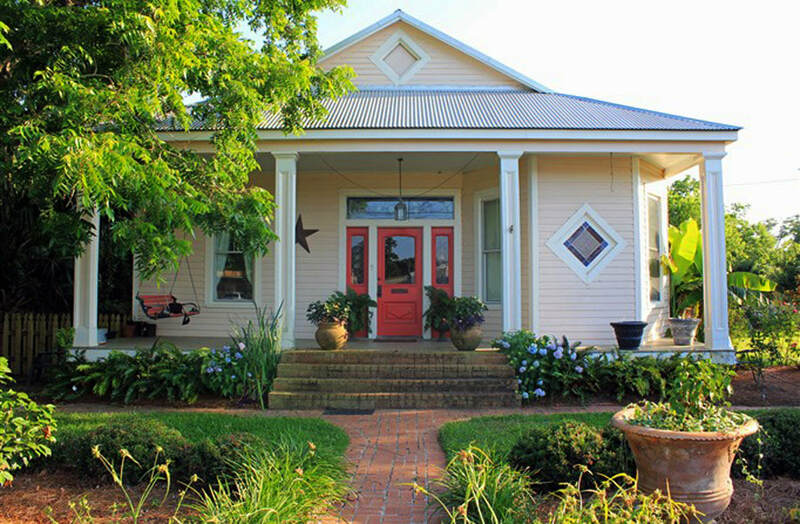 Find “warm southern hospitality” at this lovely Victorian style home built in 1890. Jane grew up in Baton Rouge, Louisiana, and fell in love with B&Bs after living in Europe for a few years. 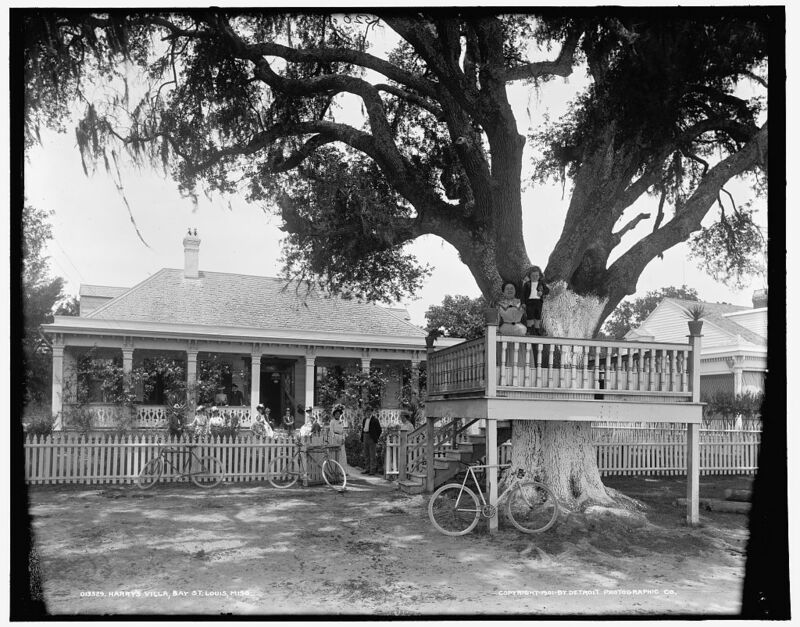 She lived in Bay St. Louis for 20 years and worked in healthcare for 25 years before opening the Carroll House B&B. She also owns Bay-Tique, a boutique located on Main Street. 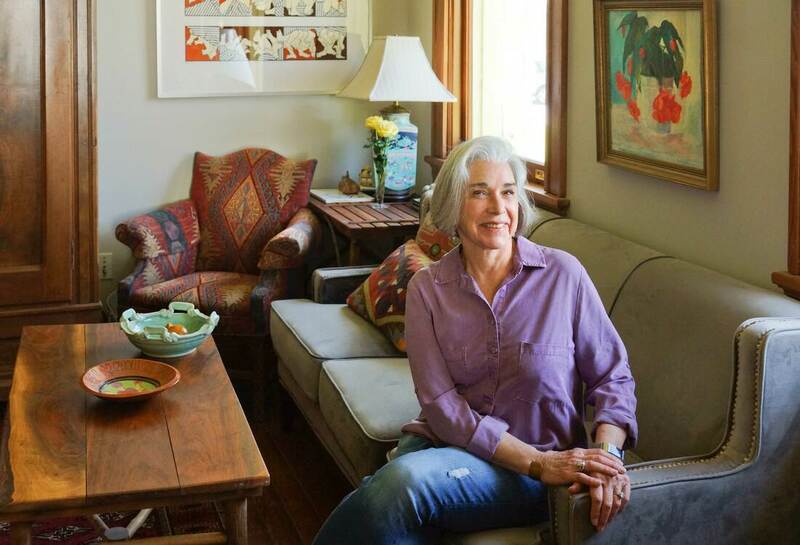 “It was a life dream of mine to own and operate a bed & breakfast,” Jane says. 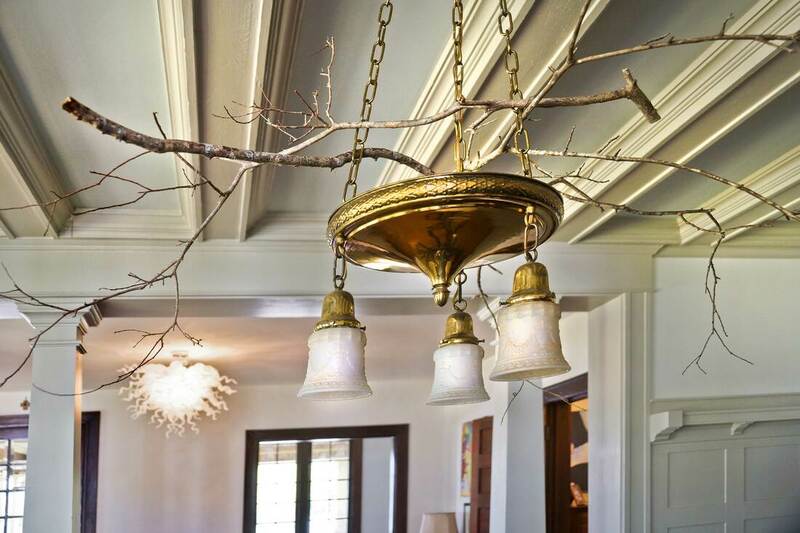 She bought the home in 2006, renovated it, and brought it back to its original splendor. She then lived there until 2011. After moving into the cottage next door, she was ready to open the B&B for business. The home is on the National Register of Historic Places and features three bedrooms, each with a private en suite and a large claw foot tub. 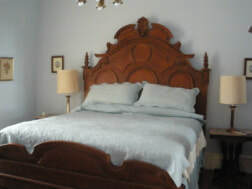 Each room is furnished with lovely antiques, luxury linens, free Wi-Fi and DirecTV. 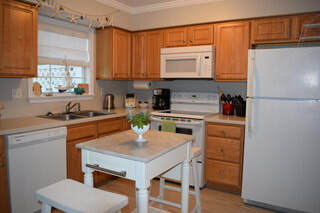 There is also a separate beach cottage on the grounds, which features one bedroom and a full kitchen. The home features large front and back porches as well, great for gatherings or relaxing and reading a good book. "I have walked up on the back porch many times to find a guest napping on the porch sofa,” Jane recalls. Carroll House is conveniently located within walking distance of all of the shops, galleries, and restaurants of Old Town, and just two blocks from the waterfront. Jane enjoys entertaining and making her guests feel welcome, and the biggest compliment that she receives is just that. 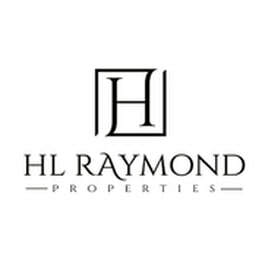 “We have found over the years that many of our guests fall in love with Bay St. Louis and end up moving here or purchasing a vacation home here.” This is something that she takes great pride in. 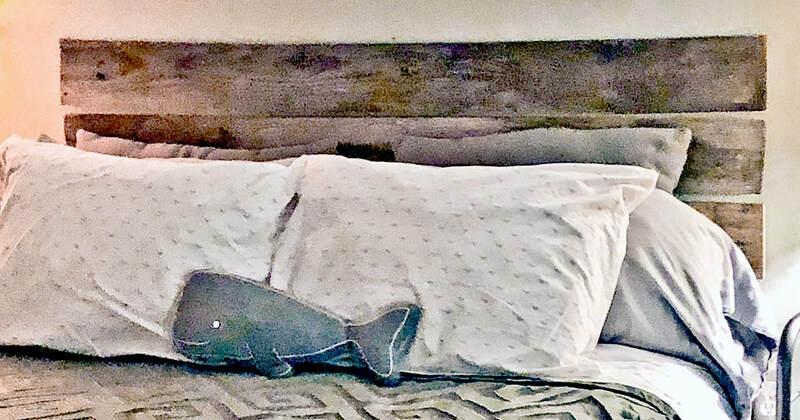 “We take our role as ambassadors to Bay St. Louis very seriously and strive to treat each guest with the warm, Southern hospitality that embodies our little beach front community.” One stay at the Carroll House will prove this fact for you. Visit their website at www.carrollhousebnb.com for more information. One of Manieri Real Estate's charming vacation rentals. 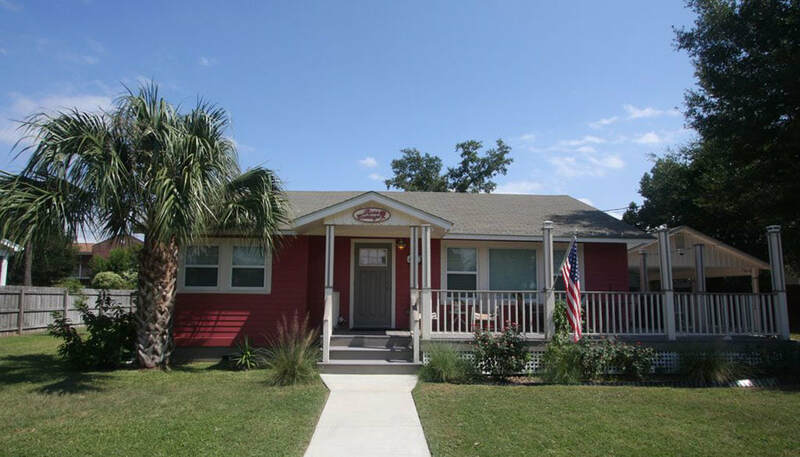 “Manieri Real Estate manages a number of vacation rentals in Bay St. Louis. These properties are listed on VRBO.com,” explains Joey Manieri, manager. These VRBO listings include: VRBO #1506453, VRBO #36901, VRBO #49042, VRBO #960130, VRBO #1543165, VRBO #735458, VRBO #497992, VRBO #1455843, VRBO #313124, VRBO #400259, VRBO #987619, VRBO #1034190, VRBO #909248, and VRBO #639097, with three or four more vacation rentals to be expected to join soon. Each one of these properties ranges from two to five bedrooms. Guests from all over the United States come to stay in Bay St. Louis at one of Manieri Real Estate’s properties. Even a few from other countries choose to visit as well. Winter guests include snowbirds. “Manieri Real Estate LLC offers quality service and comfortable living at a competitive price. It is our goal to provide our customers an enjoyable visit to Bay St. Louis” Manieri says. Gulfview Properties currently manages and owns five vacation homes, which includes The Bungalow Bed & Breakfast and The Abode Guest House. 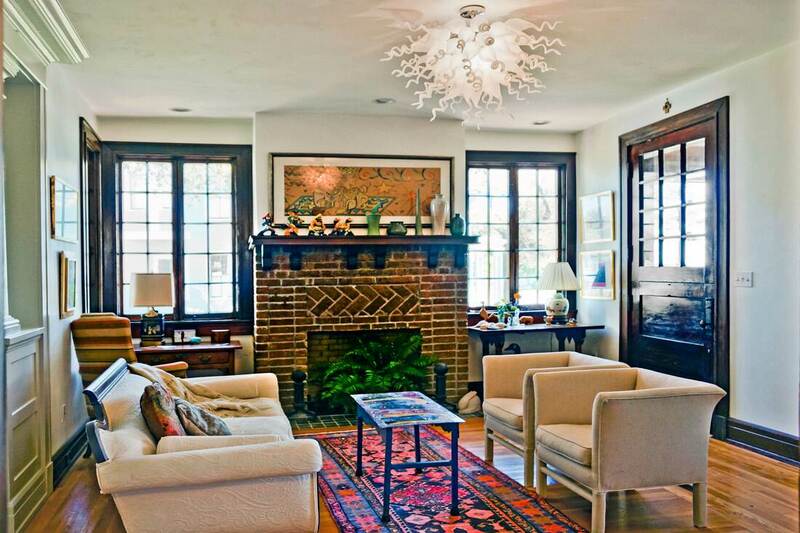 “Our specialty is older classic homes in the historic district,” Kevin explains. 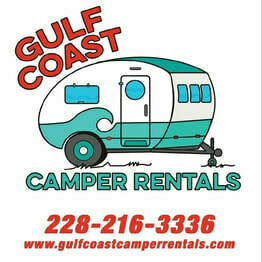 In addition to these properties, they manage vacation rentals for other owners, also in the Bay St. Louis area. All of the properties are listed on the website, gulfviewproperties.net , VRBO, and Airbnb. 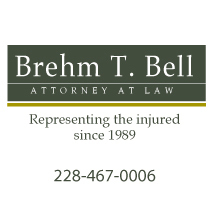 For more information, they can be reached by phone at (228) 344-3004. The Heart of Old Town, owned by Ed and Sylvia Young, is a charming place to stay. 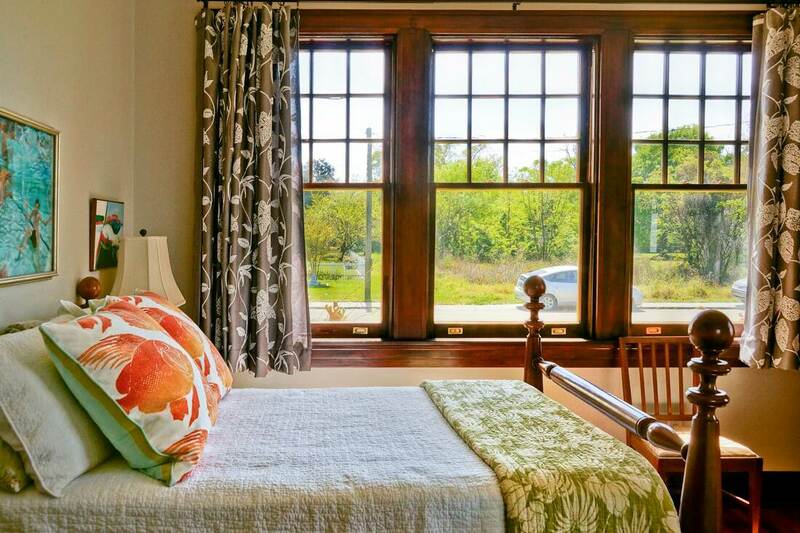 Get the full Bay St. Louis experience in this vibrant apartment, truly in the “heart” of Old Town. 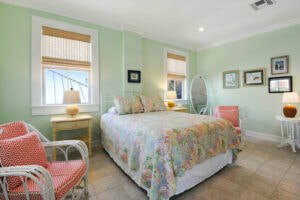 This two bedroom, two bathroom vacation rental apartment is located next door to Antique Maison, the Young’s antique shop. 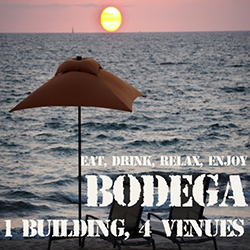 It is also within walking distance of the other shops, restaurants, galleries, entertainment, and the beach. One bedroom contains a queen bed, while the other has two full size beds. There is also a trundle bed in the living room, a rollaway twin bed, and a crib. 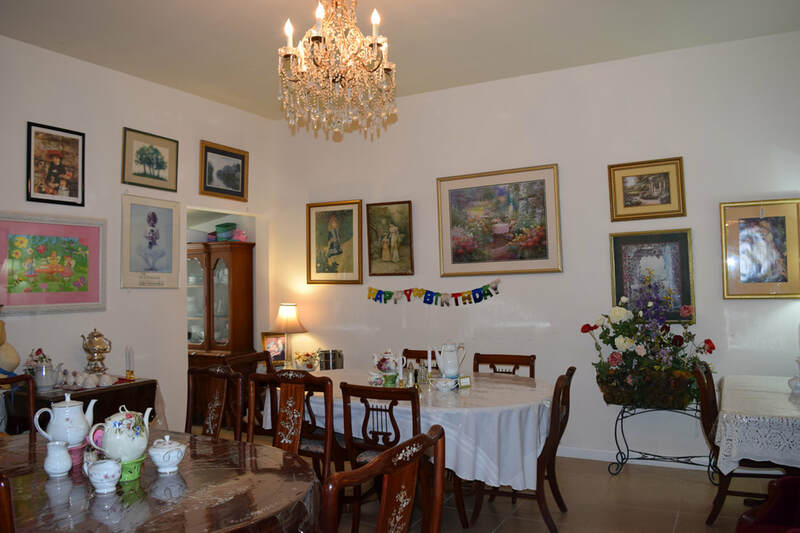 The apartment comfortably fits six, so it is perfect for a family or a larger gathering. There is an outdoor patio with a 6-person table, a gas grill, and a 3-person rocking bench, so that you can enjoy warm summer evenings and the company you are with. Grill some food, pour some wine, and unwind after a long day. Inside, you will be welcomed into a 1,300 square foot interior decorated with lovely decor and colorful walls. 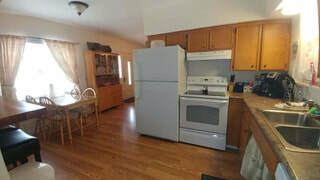 There is an HD TV in the living room and a fully equipped kitchen for meal time. 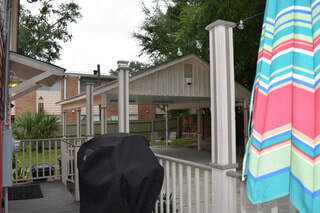 The apartment features air conditioning, Wi-Fi, 2 flat screen HD TV’s with DirecTV, Showtime, and Starz, a DVD player, washer and dryer, toiletries, a high chair, four driveway parking spaces, boat and trailer parking, and much more. You can check out this vacation rental on both Airbnb and HomeAway. Book your stay in the true heart of Old Town today! Life’s A Beach Cottage got its name from a simple phrase that owner/operator, Nona Morlan and her friend used at the time she was debating opening a vacation rental. Ever since then, it has been a lifestyle. Nona and her husband, James Morlan, moved to Bay St. Louis in 1982. Since she has been here, she says that she “was made to feel at home by the locals” and has “developed long friendships” with them. The couple lived in the cottage for 15 years before opening their doors as a vacation rental. “It is close enough to the downtown area that walking to the restaurants and shops is an easy trek. It’s far enough away that the loud noises some locals complain about isn’t an issue” Nona points out. There is also a view of the Bay Bridge from the front porch swing. Nona’s favorite part about owning and operating the cottage is meeting new people and having return guests. Visit www.lifesabeachcottage.com for more information, or check it out on Facebook. 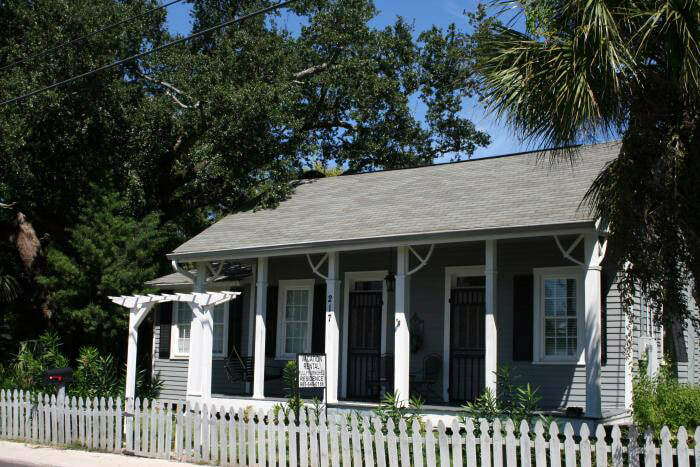 The Rose Cottage, owned by Ann Hager, is conveniently located on deMontluzin Street, just a short distance away from the shops and restaurants of Old Town, and of course, the beach. It is known for its rose-colored exterior, which sets it apart from all of the other homes in the area. The surrounding roses of the same color exude joy and serenity, and this is just what you will find when you book your stay at the Rose Cottage. 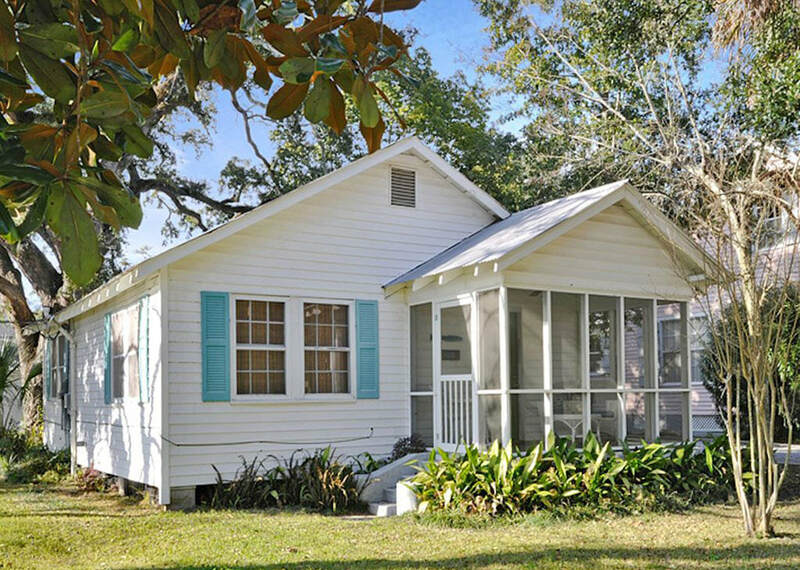 This fully renovated, modern cottage from the 1950s offers all of the comforts of home. Your stay will be made comfortable with the central air, ceiling fans, cable television, Wi-Fi, and washer and dryer. 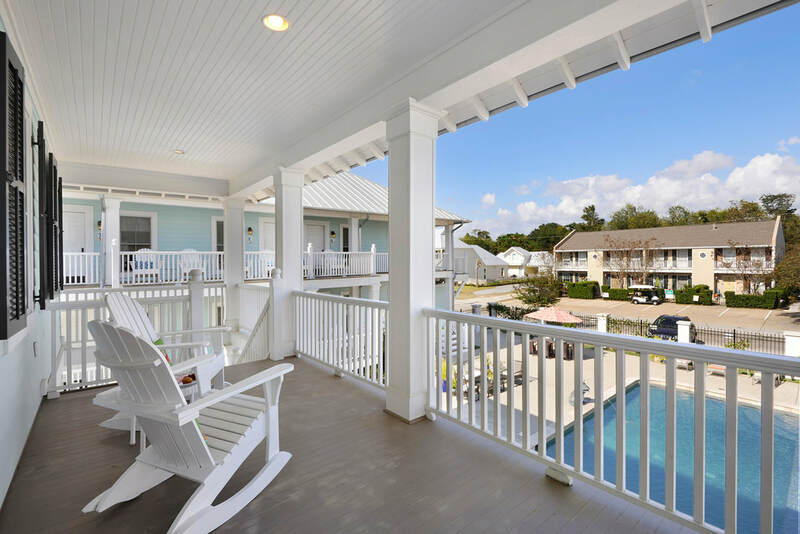 ​There is also a wrap-around deck and furnished front porch to enjoy your evenings on. Sit back, relax, and watch the world go by in this quiet, residential neighborhood. 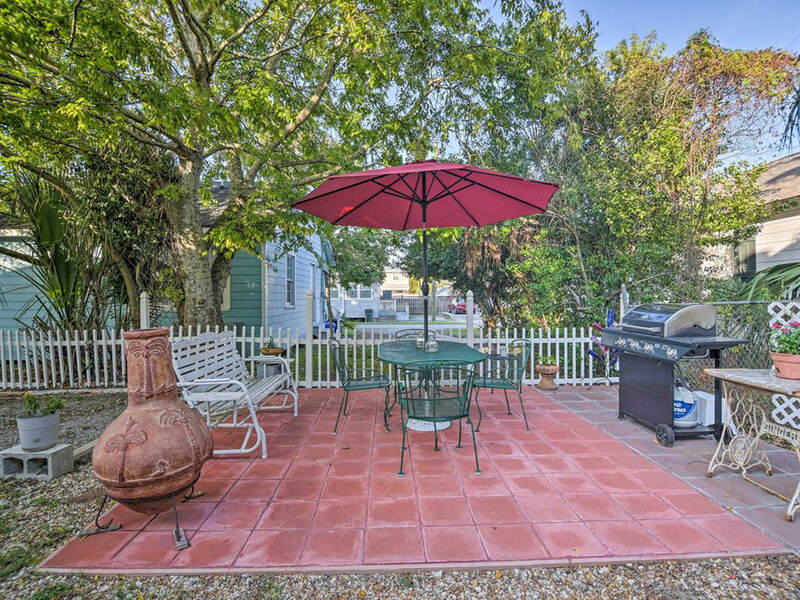 The home also features a BBQ pit, and a shaded picnic table for a peak southern living experience. 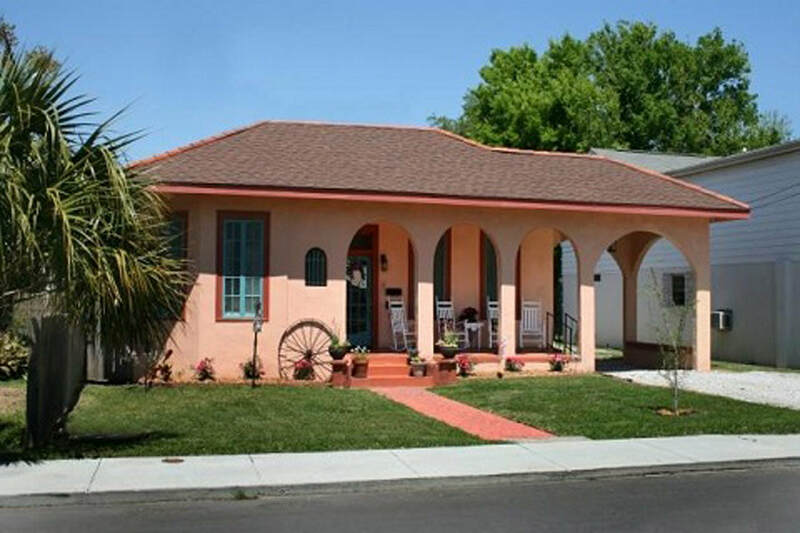 A charming picket fence surrounds the uniquely pink home, and one of the best features of this vacation rental is the two-car carport. There is an open living area, which includes a living room, a full-sized kitchen, and a sit-down dining room where you will enjoy your meals. 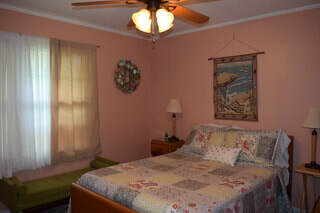 The Rose Cottage has two full bathrooms and two bedrooms. 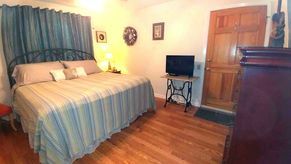 The entire family can make themselves comfortable in the two bedrooms offered at the Rose Cottage. One features a queen-size bed and a TV, while the other has a full-size bed. For additional sleep options, you will find two full-size futons in the living room, as well as extra linens. The past guests of the Rose Cottage have nothing but joyful things to say about their stay here. 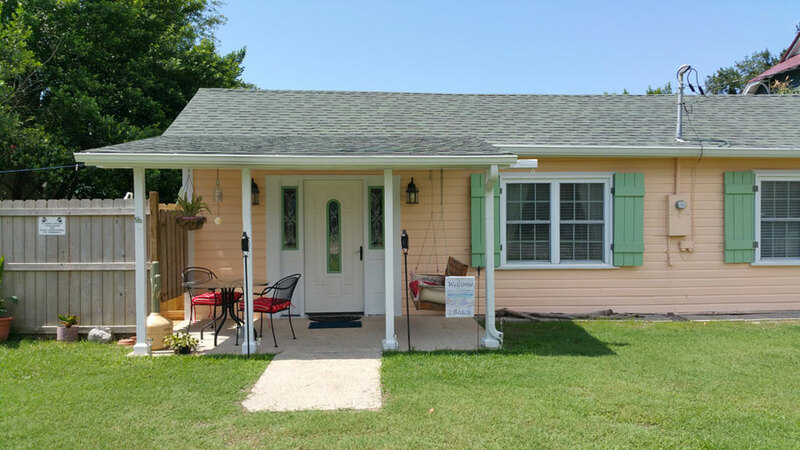 Relax, explore, eat, shop, and enjoy your stay at the unique Rose Cottage. You can find it listed on VRBO. This charming townhouse located on de Montluzin Avenue in Old Town is the perfect family friendly getaway. Nikki Moon, owner of the Bay Town Inn across the street, renovated and opened the townhouse for Cruisin’ the Coast in October, 2018. “I wanted something that was family friendly… people with children could come in and enjoy the beach, enjoy Old Town,” she explains. 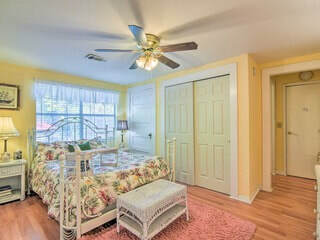 The townhouse is completely renovated and fully furnished. It features two bedrooms, one with a queen-size bed, and one with two twin beds. 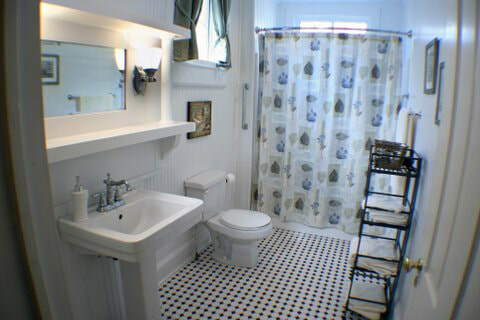 There is also a full bathroom with a tub on the second floor, and a full bathroom featuring a shower on the first floor. 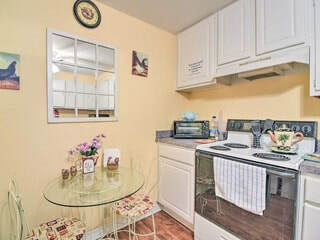 There is a fully furnished kitchen, washer and dryer, two televisions, Wi-Fi, and two parking spaces for your stay. One of the biggest advantages of staying in this townhouse is that you can walk everywhere. It is located half a block from the beach and one block from bustling Main Street, which features shops and restaurants. The townhouse is listed on VRBO, where you can check out more details on this charming vacation rental. 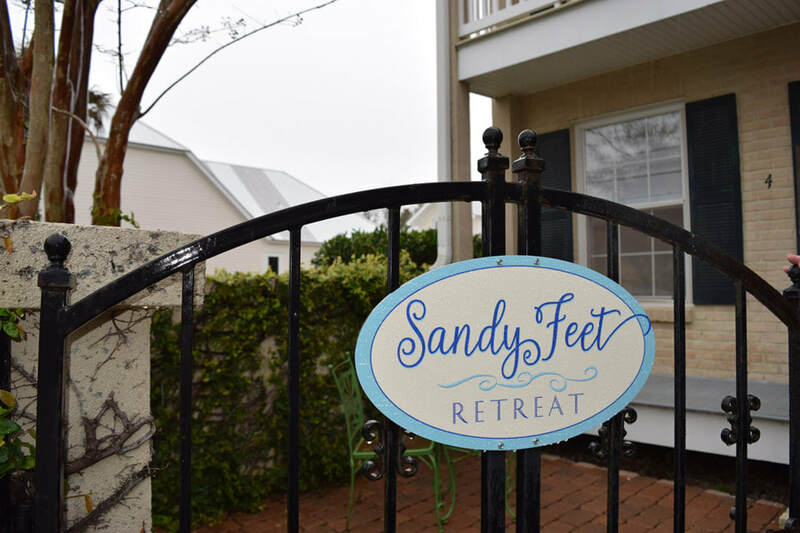 Book your stay at the Sandy Feet Retreat today! 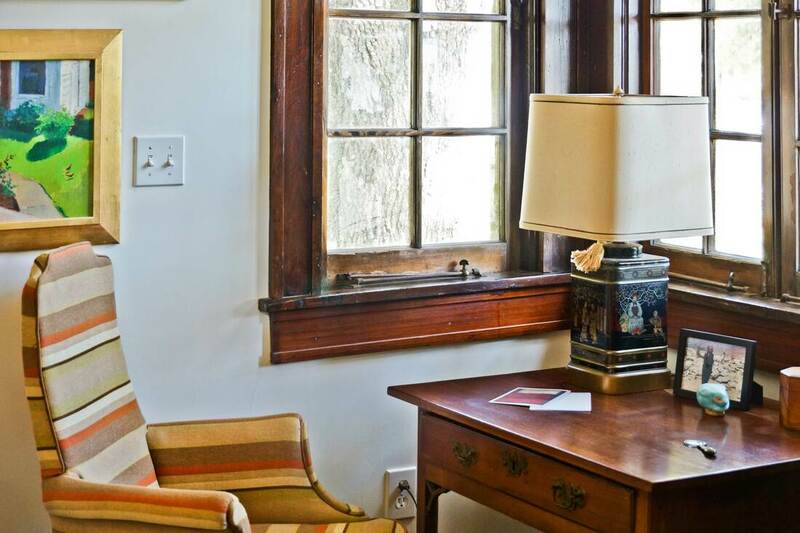 “Gracious living of a bygone era on the Mississippi Coast.” This is the essence of the Trust Bed & Breakfast, which is unlike any of the others. It is family-oriented, historic, elegant, and a place where you can truly enjoy the company that you are with. Hilton and Joan Eymard bought the bed & breakfast in 1970. The New Orleans natives stumbled upon the property while they were visiting their eldest son who was boarding at St. Stanislaus. The home had been closed for 15 years before they discovered it. It was run down and needed a lot of work. Nevertheless, they saw the potential, and asked if it was for sale. “We made an offer, and the following day we got it,” Joan recalls. They originally saw the home as a great place for their sons to stay in with Joan’s mother while they were attending school nearby. The couple renovated one room at a time and slowly but surely restored it to its original glory. Once the boys graduated, “The house stayed vacant for a while, and finally we said, ‘We could open a bed and breakfast here, and we did!’” Joan explains. The Trust Bed & Breakfast opened its doors in 2000. During Hurricane Katrina, Hilton and Joan found refuge in the bed & breakfast, which was ruined during the storm. They once again had to renovate the home. 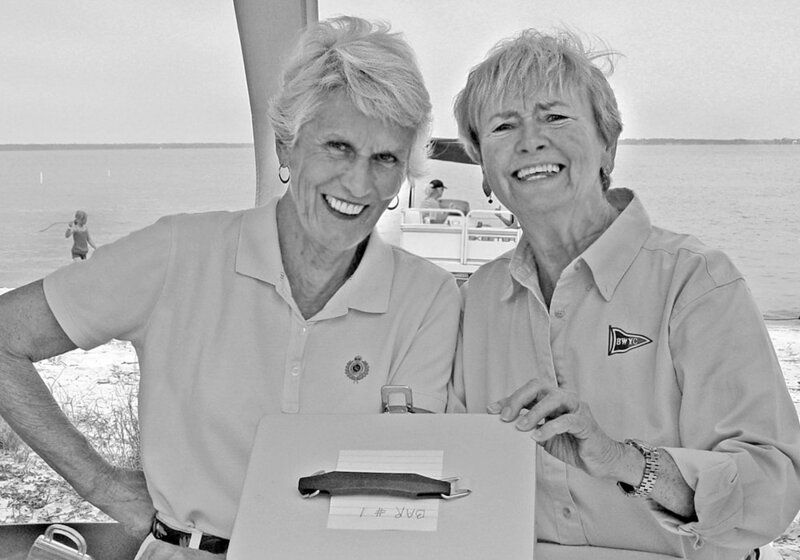 “We were able to get it back in full force about two years after the storm,” Joan explains. 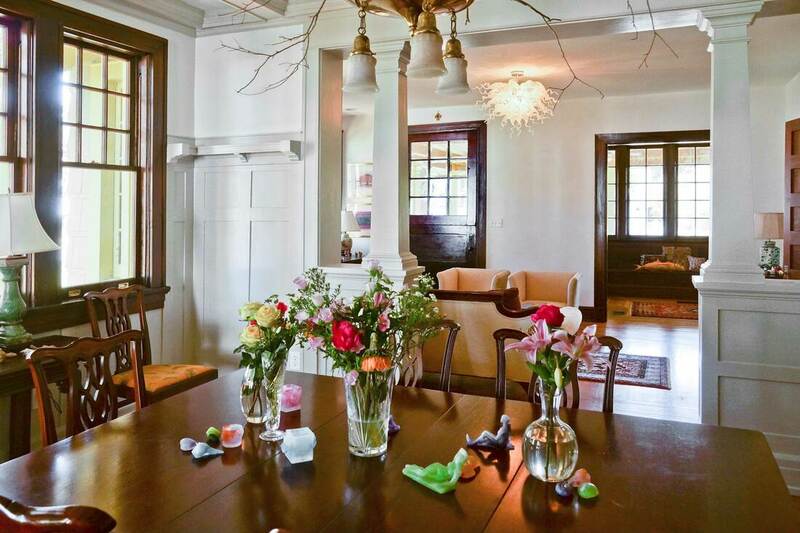 Located on Bookter Street, this historic home, built in 1850, is 10,000 square feet and has seven bedrooms, each with a private bath. Children are welcome here, as it has been a family home for years. It is also located close to the shops, restaurants, and beaches. “What we have tried to do here is keep the house in character of the years that it’s been here,” Joan explains. In the home, you will find lovely period antiques that the Eymards have taken special time to collect. Hilton and Joan are also extremely accommodating, and they go above and beyond to make sure that their guests are comfortable and have everything that they could need. “It’s more of a family experience than going in a hotel room and being alone,” Hilton Jr. explains. The Trust Bed & Breakfast is a place where you will truly immerse yourself in your peers and share experiences amongst one another. Call 228-467-5715 for more information. This local musician's talents are woven into the fabric of our American musical heritage. I asked Tommy Moran for whom he had played fiddle. He told me, “mostly a bunch of unknowns.” He told me that he never wanted to get too far from home. That’s where I found him at his Lakeshore home, his recliner kicked back, in his stocking feet, watching basketball. ​Born on the family’s forty acres in Lakeshore in 1934, Thomas Joseph was the second of nine children. The Morans ran cattle and cut timber. There was music in the home. ​Both his grandfathers played fiddle. Tommy said his father loved music but did not play. Tommy took to the guitar at around ten, mastered it and moved on to teach himself the fiddle. He started playing around the community with his brothers Ola Gene and Doug. ​At twenty years old, he joined a band led by Werly Fairburn. Fairburn, the “singing barber,” is a lost legend of rockabilly, one of the few that successfully transitioned from country to the “new” music. This was in 1953, before Werly turned away from country. ​“Werly was a good songwriter and a good singer. He was serious about it,” said Tommy. Tommy Moran (with fiddle) with the Werly Fairburn group. Fairburn is kneeling in front with guitar. ​Tommy moved to New Orleans, and along with his brother, Ola Gene, backed Fairburn. They recorded Werly’s music and played live fifteen minutes every day on WDSU. The group earned extra money playing dances and barrooms. Soon, Fairburn and Moran landed a gig on the Louisiana Hayride. There, they shared the bill with Johnny Horton and Elvis Presley. 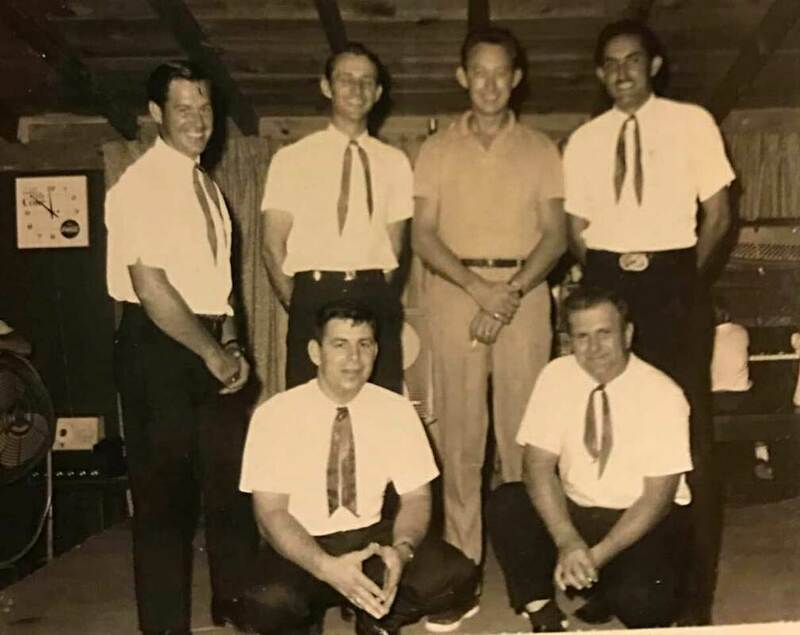 From there, they went to the Grand Ole Opry, playing alongside the royalty of country music, most notably, the great Webb Pierce. 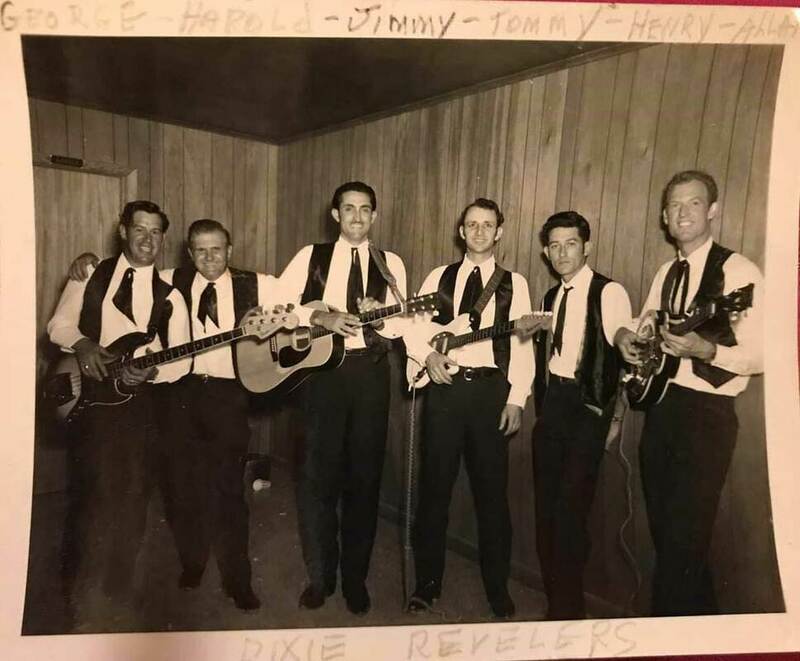 The Dixie Revelers with Tommy Moran, second from left. 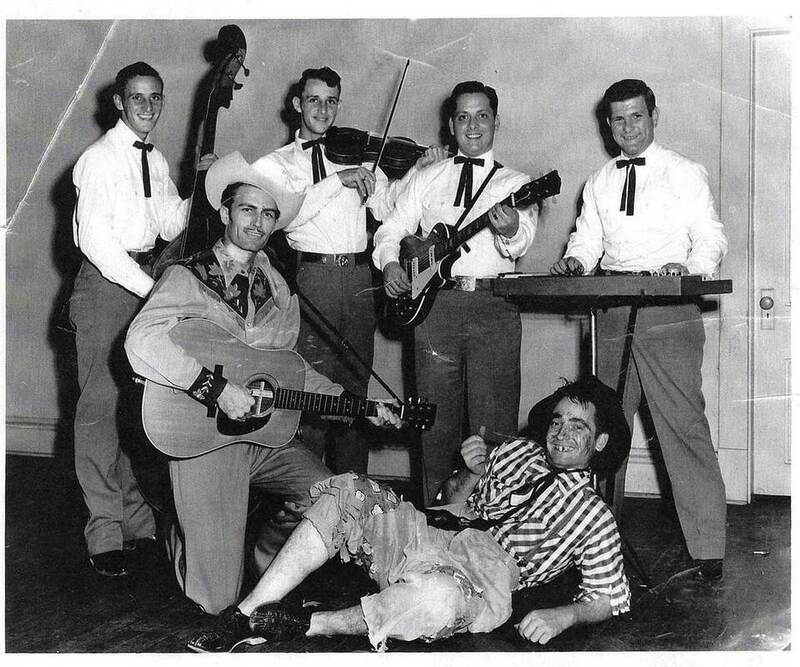 The Dixie Revelers, Tommy Moran, second from left, back row. By the late fifties the Bakersfield sound was catching on, and Fairburn wanted to move to move west and cash in. For the next ten years, Tommy also became a popular session musician. 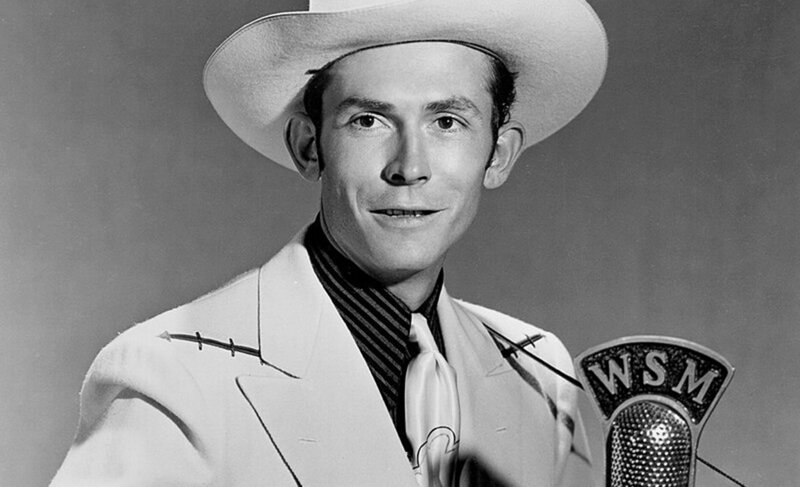 He recorded in Nashville and at the Studio in the Woods in Bogalusa. Along with the many unknowns, he recorded with Loretta Lynn and Don Price. He played with Dolly Parton and George “Possum” Jones. Both Tommy Morans during an appearance on the classic show, Louisiana Hayride, around 1955. 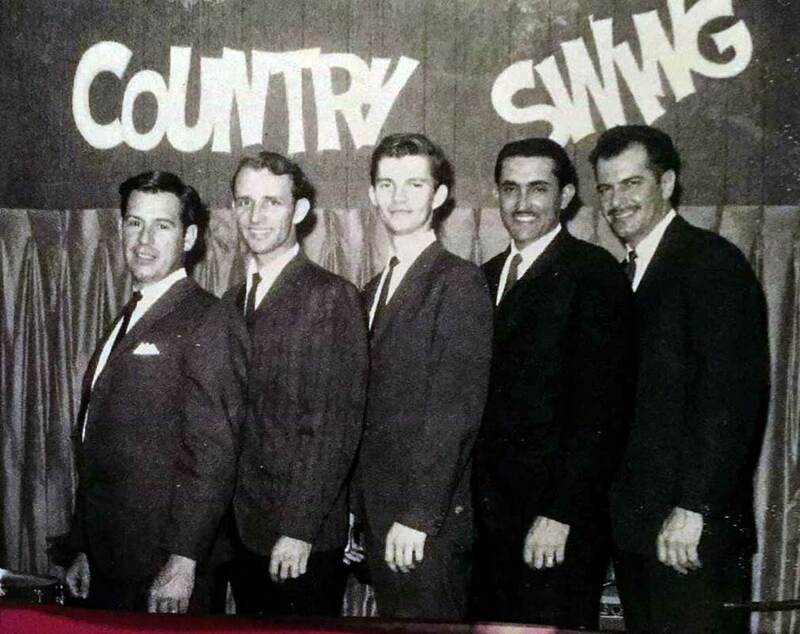 Big Tommy Moran sits in with the band, Catahoula, with son Tommy Moran, Danny Perniciaro, Sid Rutter, David Adams, Mike Keel and Pat Murphy (far right). But the recording artist has enjoyed performing as well. Early on, Tommy formed the Moran Family band with two brothers and two sisters (listen to one of their recordings at the end of this story). Along with his talented son, "Little" Tommy Moran, he toured with Moe Bandy. 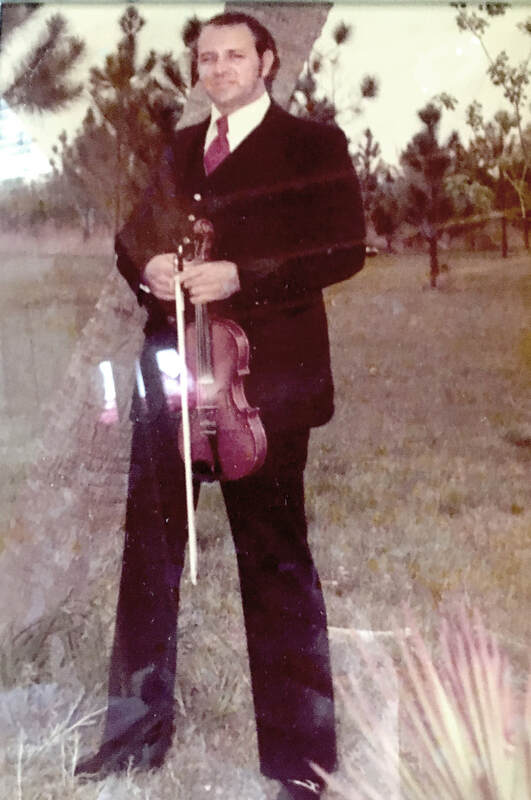 And he took home numerous top prizes from fiddling competitions through the years. But mostly, he cut timber. He worked oxen long after the mechanization of the timber business. Tommy said he cut less timber, but he could make more without the cost of skidders and tractors. He could feed an ox for a dollar a day. They never broke down, and I think he liked the quiet of the woods and the company of the animals. We talked about the players he liked, consummate session and side men like Don Rich, Roy Clark, Jerry Reed and Glen Campbell. A good player, he said, isn’t out front. He is there in a way that you hardly notice, but if he wasn’t there, the song would be missing something. Two of his sons, Tommy and Gene, are carrying on the family tradition, currently playing together in "Monsters at Large" (catch them at 100 Men Hall, June 21, 2019). 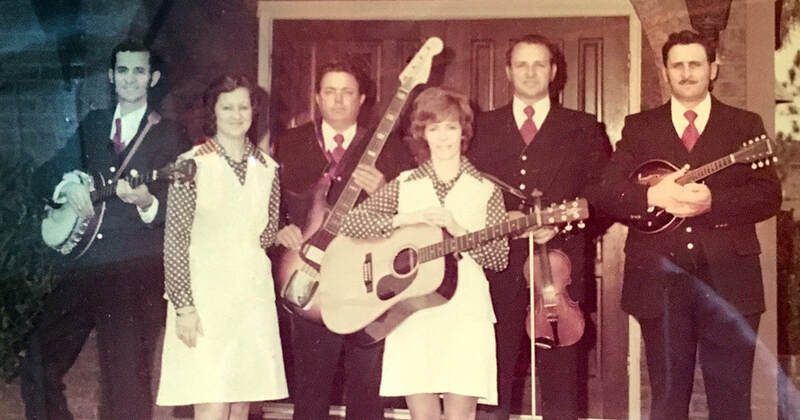 Years ago, I had an opportunity to play at church with Tommy Moran and his wife Annette. He came out day or two before. We ran through the number I picked, Doc Watson’s “I am a Pilgrim.” I asked him if he wanted to run through it again. In the recording below, Tommy Moran's brother, Doug Moran (now deceased) sings lead. Special thanks to Tommy Moran's daughter Michele Seal for photo/video assist for this story! Quality and professionalism are the hallmarks of every project at Hansen Custom Painting - and it shows, on buildings across the coast. Spring is the natural time for sprucing up around the house so this is an especially busy season for Hansen Custom Painting. Owner Chris Hansen and his crews are out and about, working on new homes and any others that need sprucing up inside and outside. Chris is a third-generation painting professional who believes in providing quality work for his residential and commercial customers, whether it’s putting drywall and painting one room, restoring a historic home, painting a new house or remodeling a home. “We handle it all,” Chris says. "Handling it all" is not an inflated claim. Hansen's wife is Jackye Crane, president of Crane Builders, a company started by her father, Jimmy Crane in the 1980s. Jackye grew up working alongside her father, who developed a reputation for meticulous craftsmanship. In 2010, Jackye graduated with honors from LSU with a degree in Construction Management. She officially took over the helm of Crane Builders in 2017. She and Hansen worked together on many projects through the years and married in 2016. The couple enjoy working together on projects, each of them bringing experience and a love of their professions to the table. 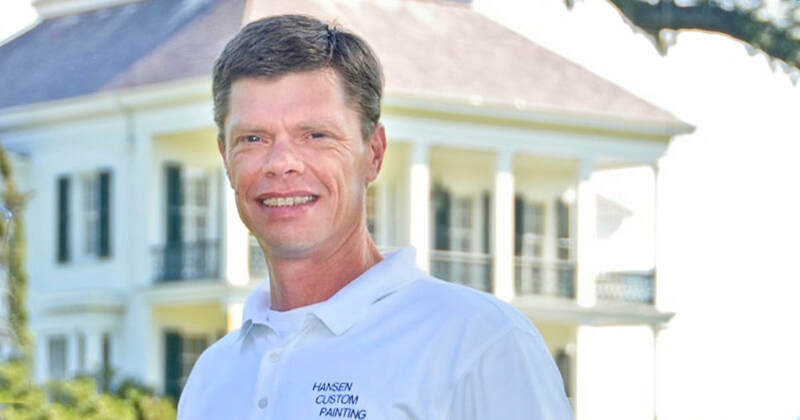 The work and family environment extends to the Hansen Custom Painting crew, many of whom have been with Chris for years. He describes the team members as dependable and dedicated to the shared goal of providing quality service to each customer. Safety also is something that’s important to Hansen Custom Painting and the crews carefully follow guidelines for coatings and equipment that are called for by OSHA. And Chris has a favorite quote when talking about making an investment in a home. A riff, a lyric or a chorus can transport us to a time long gone, to a place far removed, as we choose. Buried beneath layers of duty, I found a tasty scrap of time to listen to good music. Getting older so far hasn’t meant more idle hours for what I love the most – playing old songs at top volume. With age should come that privilege. Every now and again I just say “no” to 96 choices of cable television shows and unlimited movies and emails stacked like cord wood. I have to hear my music, and by “my” I mean songs that have delighted, teased, moved, sustained and tormented me. The good stuff. ​I filled my glass, put my feet on the leather ottoman bought on the cheap 30 years ago at a Jackson department store, and mentally strapped down for serious time travel. The shuffle feature made the trip more kaleidoscopic than chronological. 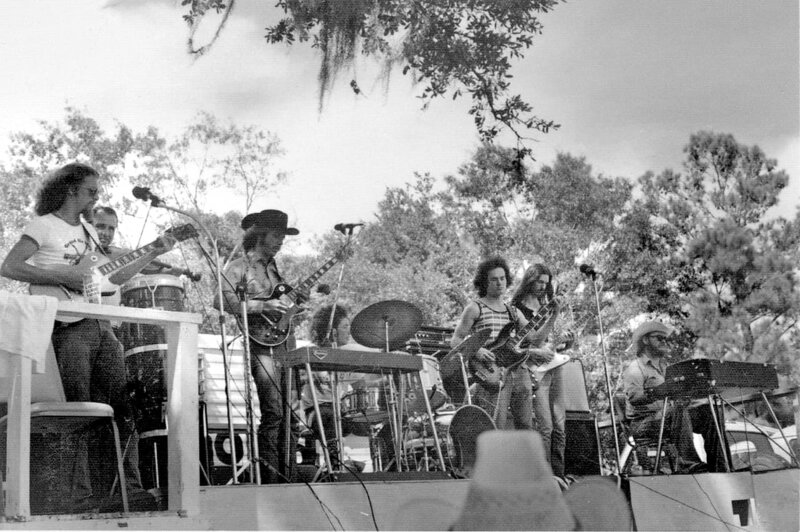 Bob Dylan, for instance, carried me ‘way back to Loachapoka, Ala., where oddball friends often gathered on old bedspreads in tall grass to solve the world’s problems. My back pages are in braille, a stubble of memory and meaning that feel good to touch. Aretha took me to a dorm room in Auburn where a steam radiator hissed and, without irony, we sang “Natural Woman” while wearing electric rollers in our hair and cold cream on our unlined faces. Collegiate independence came with a safety net – “I’ve overdrawn my checking account, Daddy, and I don’t know how it happened.” – a sweet spot in life. ​The inimitable John Prine put me on the pristine banks of the Middle Fork of the Salmon River on an early June raft trip. We weekend adventurers ended each night around a campfire listening to Prine’s soft picking and the recitation of Robert Service poetry. Before that trip, I didn’t know anything about either Prine or Service, two poets you discover you need while negotiating what Lewis and Clark called The River of No Return. Try bookending Prine’s “Souvenirs” and Service’s “Yellow” and your boat will float. ​Music is lightning. Every listen might just bring to your life something you didn’t know you couldn’t live without. Speaking of rivers, Emmylou and Mark Knopfler sang Hank’s “Lost on the River” and reminded me that I come by my passion for music honestly. My father played Hank again and again on the first piece of furniture he ever bought: a Crosley record player, one with a lid that had to be cleared of Mother’s knickknacks to use. Hank has been to my life what calcium is to women; you need more and more Hank the older you get. I’m definitely getting older and odd, but thank goodness the first part of that lament doesn’t apply to me any more. I no longer live too many miles from the ocean. Each time I go to the grocery or the bank I make a point to get at least a glimpse of the Gulf, the reason I’m here, the reason almost all of us are here. I try to remember what a great gift it is to live on the edge of the sea, whence we came. Life and politics and aging may make us blue, bring us down, and send us running to the stereo and our most dependable old tunes. But as long as I have what Jimmy Buffett called “Mother, Mother Ocean” a few steps away, there should be a smile buried somewhere in my wrinkles and a song in my flinty heart. ​Read more about award-winning author Rheta Grimsley Johnson on her website - you'll also be able to order her books! One of the country's most engaging gardeners is also the best public speakers that writer Rheta Grimsley Johnson has ever heard. Here's her take on a personal hero. - story by Rheta Grimsley Johnson, photos by Rheta Grimsley Johnson and courtesy Felder Rushing website. Somebody once said it is best not to meet writers you admire. I think that’s pretty much true of all of our heroes. Writers are bores, politicans horndogs, artists ditzy from paint fumes. There are exceptions. I sorta met my hero Felder Rushing the other day, and I wasn’t disappointed in the least. I heard him speak, anyway, at the Bay St. Louis Library. It was the second time I’ve enjoyed his talk, and he remains the single best public speaker I’ve ever heard. And I’ve heard Jesse Jackson and Rick Bragg. 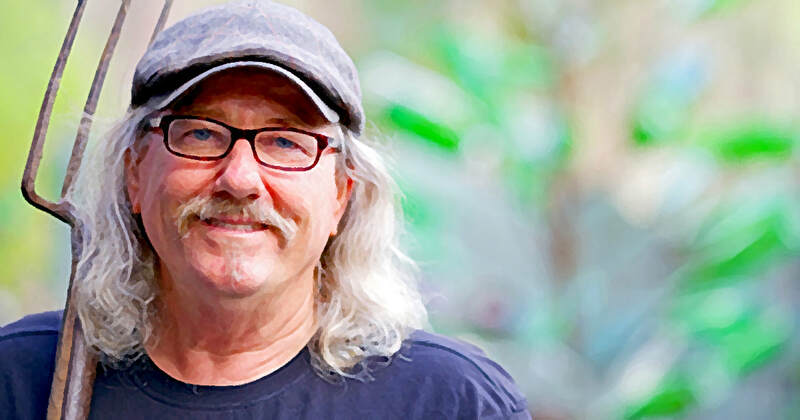 Felder bills himself “The Gestalt Gardener” on public radio, and single-handedly takes the intimidation factor out of gardening. He merrily laughs at the manure spread by garden clubs, garden masters and extension services. I once was assigned by the Atlanta newspaper to write about a venerable women’s club in Danville, Va. After the meeting, two members invited me to join them at a country club dinner. At some point the ladies noticed an acquaintance coming into the gilded dining room and immediately started whispering behind their hands to one another. They shared the dirt: She’s the kind of womanwho plants zinnias in the front yard! Let’s just say that zinnias in the front yard would be fine with Felder. He plants things that years of experience have taught him will do well in the South. No Oriental garden for Felder. No British country look – unless he’s at his second home in England. And he plants things that “when I’m tired of looking at it, I’ll eat it.” Like the day lily bulbs he sautes. He loves bottle trees and has the concrete chicken his grandfather gave his grandmother as yard art rather than some fancy and expensive long-legged lawn bird. In other words, Felder practices what he preaches. 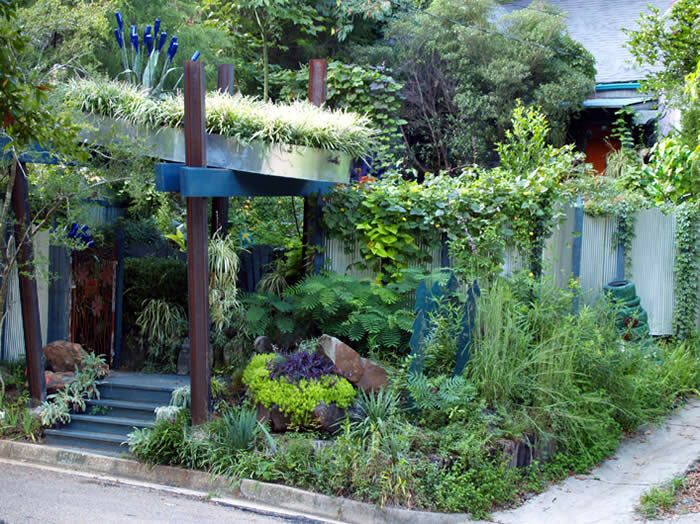 I’ve only seen his yard in the slides he shows at his talks, but I have it firmly planted in my imagination. It gives me license. ​Years ago, when he moved into his suburban Jackson, Miss., home it was all St. Augustine grass, a steep slope and “a lawn mower on a rope.” You should see it now. No contortionist pruning of shrubs for Felder, a look he describes as “gum drops and meatballs.” His approach is laid back and heavy on the whimsy. When he’s asked about whether he puts weeds in his mulch pile, he answers in the affirmative. Why not, he reasons. After all, there are weeds in his beds. Because he spends the hottest months in England – conveniently bookmarked by his favorite London flower shows – Felder rents out his main house to medical students and lives in a shed in the yard. 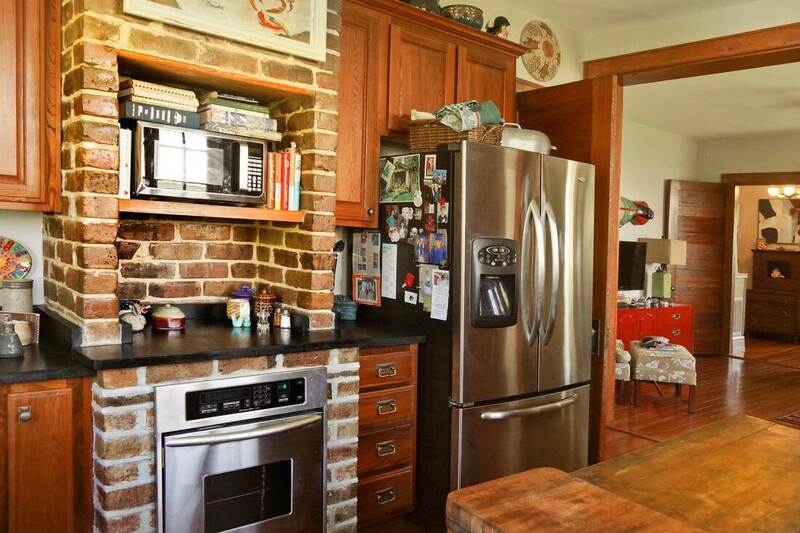 His kitchen is eight feet by eight feet. Azaleas, he says, are like the show’s “Fun Girls from Mount Pilot.” They blow into town and cause a stir, but just as quickly they are gone and things get back to normal. That quip alone is reason enough to adore Felder from afar. Read more about award-winning author Rheta Grimsley Johnson on her website - you'll also be able to order her books! 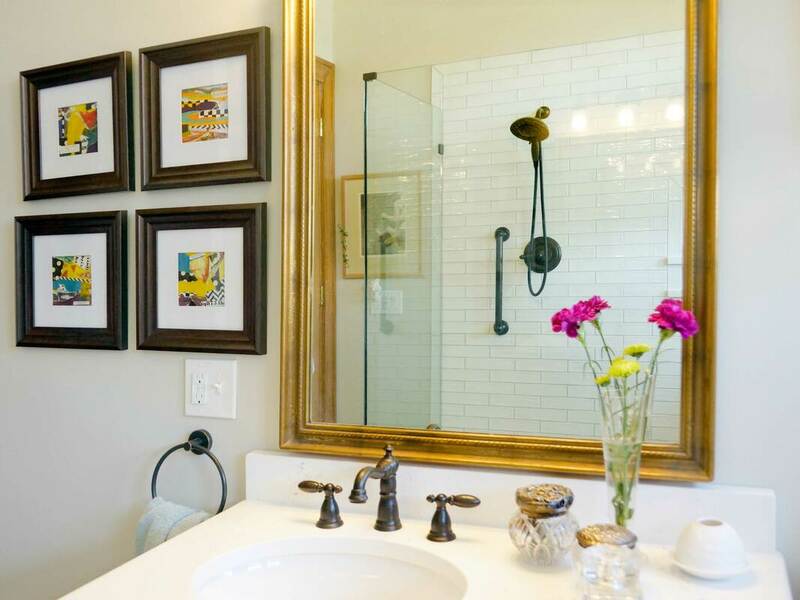 Old photos are portals to the past - and make for chic home decor, guaranteed to spark conversations. You don’t need to look far to see people’s fascination with other’s lives - especially through the lens of photographs. Almost anywhere you go today you see people scrolling through their phones peering into the lives of friends, families, influencers, strangers… mostly through pictures. And the occasional cute cat video, of course. To many people, vintage photographs are fascinating in the same way. Flipping through old photos is a window in to another time and place. Click here and scroll down for archived Vintage Vignette columns! 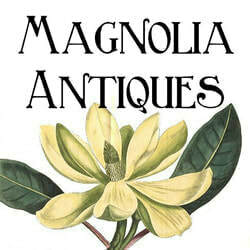 ​While most antique shops have old photos here and there, Magnolia Antiques on Main Street in Bay St. Louis has several shelves and cases dedicated to vintage photographs. ​Many of these are houses in books and binders that are works of art themselves. 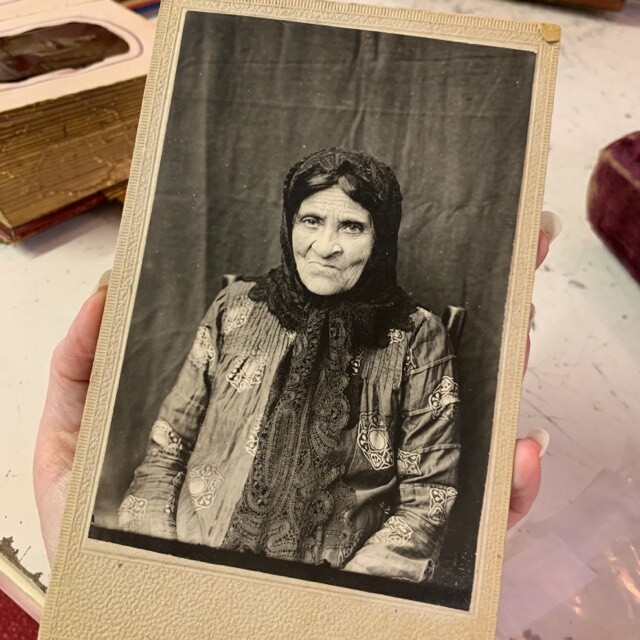 Shop proprietress Shay Coss has a special interest in these family photos from a time gone by. In fact, family members with old albums know where to take these treasures where they can be fully appreciated. Thumbing through the albums or stacks of photos, stories emerge. 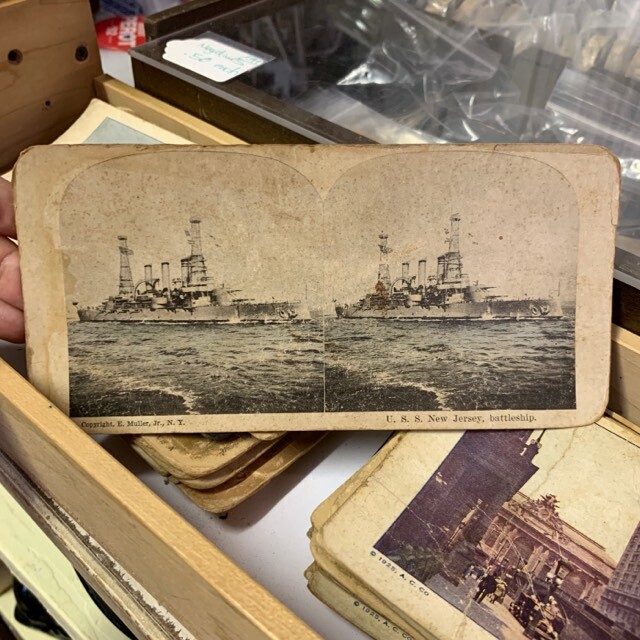 Often collections reveal a timeline of a person’s life, but also the document that time and place in history. 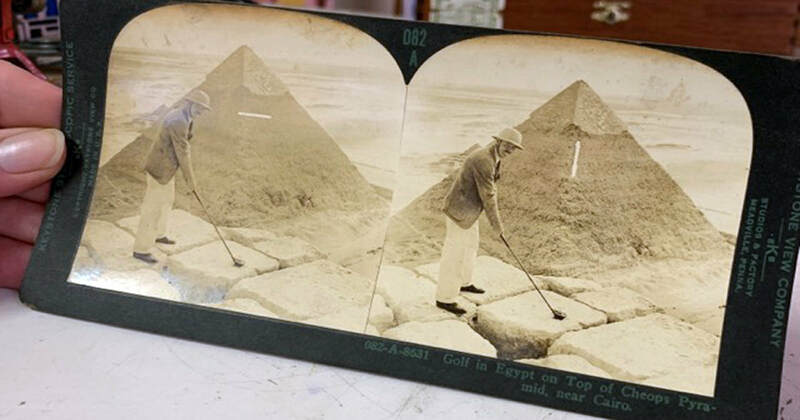 Even how the photo was taken is a snapshot of the time’s technology. Spending an afternoon at the shop with Coss as she excitedly showed off the different albums, it was impossible not to feel how special each photo was in its own way. In fact, photographs are something we largely take take for granted today. Most everyone has the ability to whip out their phones and snap a shot (or sixteen) of any occasion and share it with the world through social media. 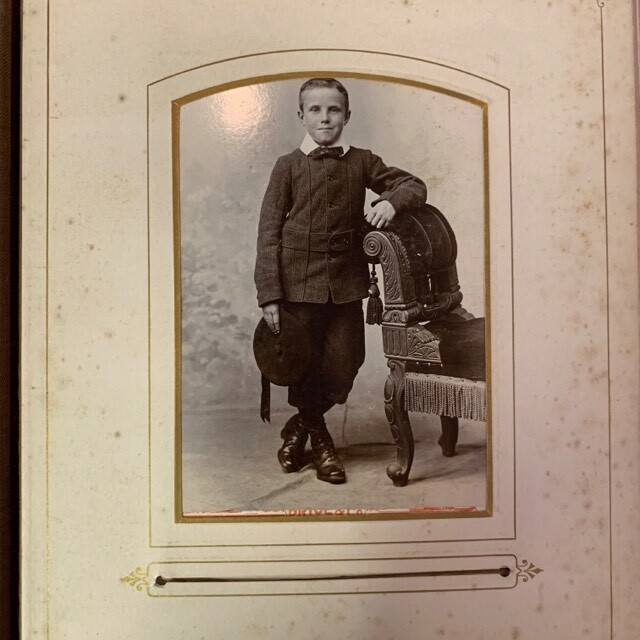 There was a time in the not to distant past that a family had to save and spend some serious pennies on hiring a photographer. Sometimes a single photo was all a family had. This is especially true of post-mortem photographs. 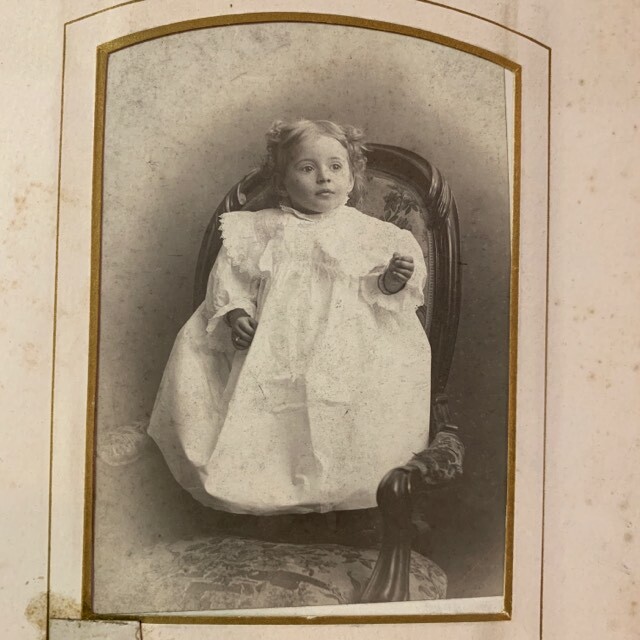 If a child or baby died at a young age, a family who could afford it would take the time and expense to have a photo made. 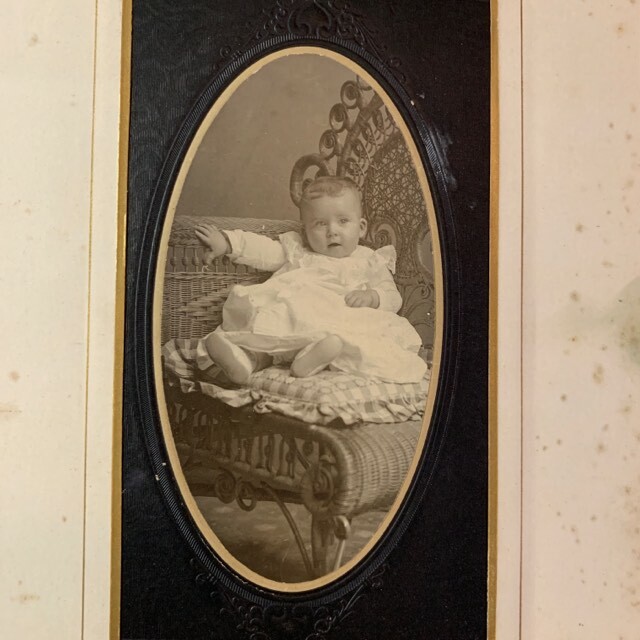 We all have fascinations with lives: lives lost, lives past, lives we wish we had... and photographs — especially vintage photographs — are a perfect portal. The Waveland Lighthouse under construction in December 2018. Photo by Lionel Haynes, Jr. It is finally completed! 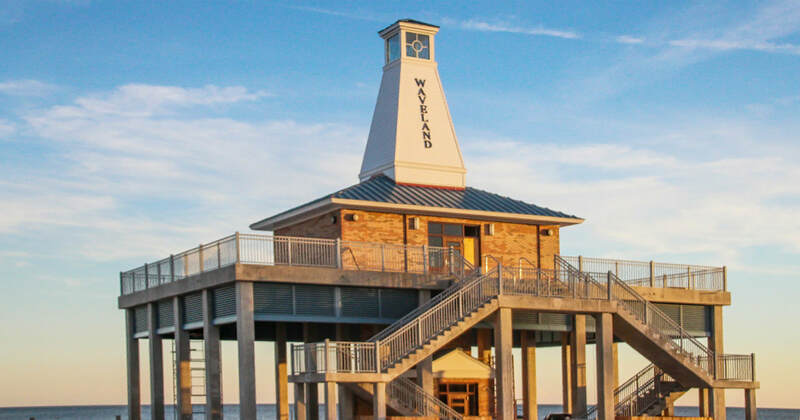 After years of searching for funding and 10 months of construction the Waveland Lighthouse, pavilion and bathroom bacility is now open to the public. Mississippi-based company Barnard and Sons was the contractor for the project. 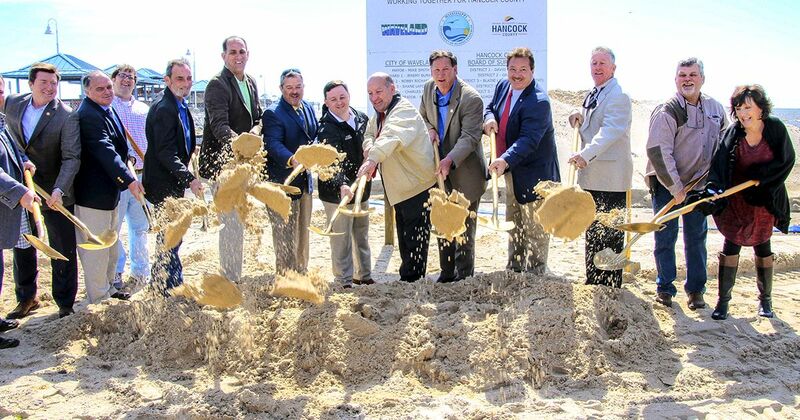 The ground-breaking of the lighthouse project in March, 2018. Photograph by Lionel Haynes, Jr.
Much of the new facility matches the vision outlined and discussed for nearly a decade. 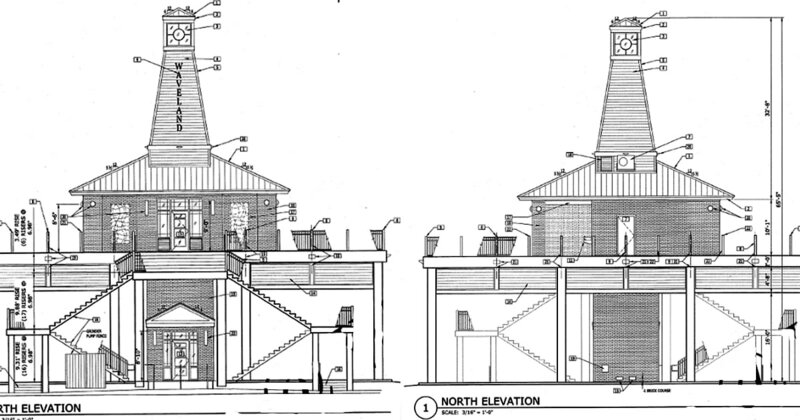 The facility has a convenient layout, such as user-friendly ground level space, an elevator and plenty of seating along the observation deck. The facility is low maintenance, has low operating costs and is ADA accessible. 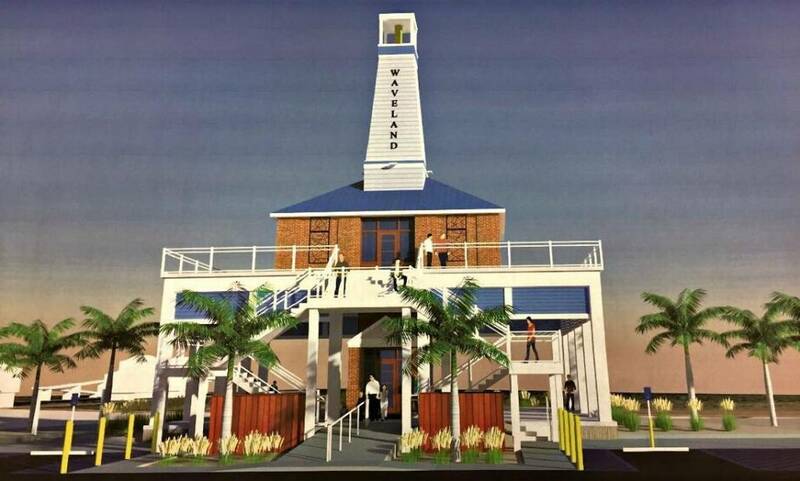 The Waveland Lighthouse, pavilion and bathroom facility will be cleaned daily. The facility will have 24 hour video surveillance. No established hours for the opening and closing of the restrooms have been decided, but the restrooms inside the Waveland Lighthouse will not be available 24 hours a day. I will let everyone know when a date and time is decided for the ribbon cutting of this much needed facility. 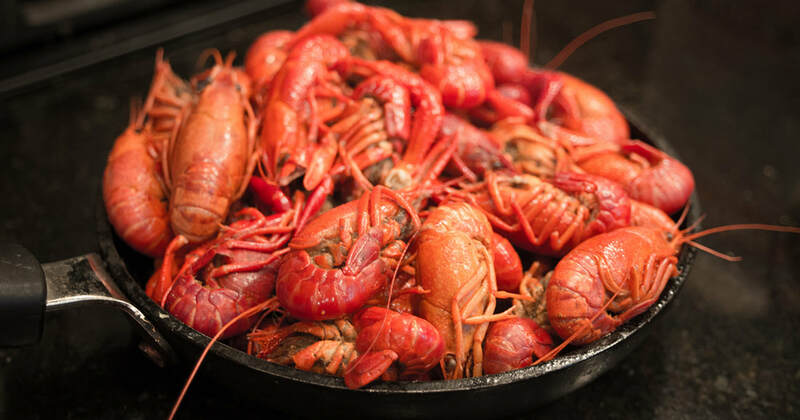 C&R’s Bar and Grill’s 12th Annual Crawfish Cook-Off will be held on Saturday, April 6, 2019, from 10am – 4pm on Coleman Avenue. The teams will be competing for cash prizes and for the glorious honor of being crowned Crawfish Cook-off Champion. Trophies will be given to 1st, 2nd, and 3rd place teams, as well as to the People’s Choice and Most Unique Edible Lagniappe item. Admission is just $25 for adults and $10 for kids (9–12), and under-8s are free. The C&R crawfish cook-off benefits Hancock County non-profit, Hope Haven. No outside beverages are allowed to be brought in and please leave your pets at home. The sponsors of this event are the Silver Slipper Casino and Budweiser. 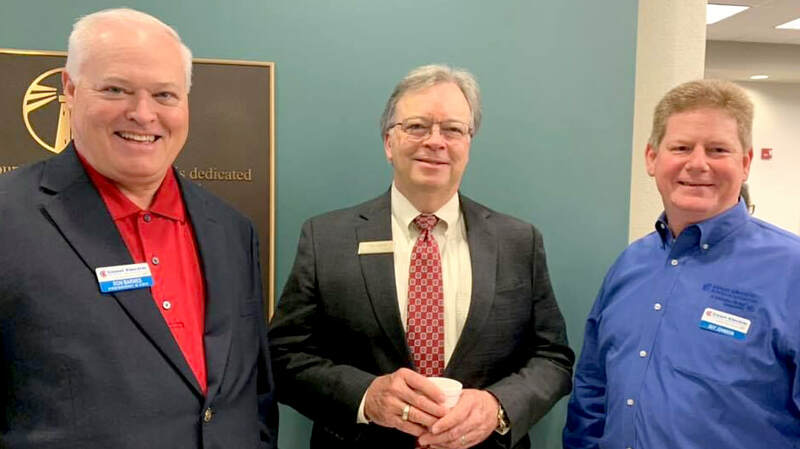 The Hancock Chamber finds new ways to improve the business lives of its members through continuing education and networking opportunities. 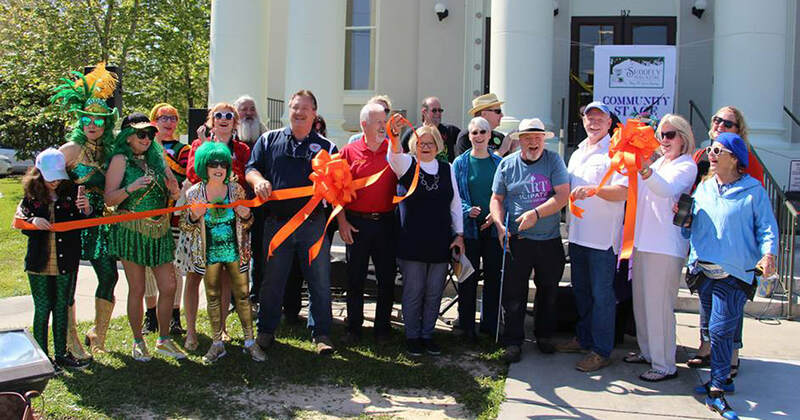 A not-so-traditional Chamber ribbon-cutting at the 17th annual Arts Alive Festival in March. As if the Hancock Chamber’s calendar isn’t already chock full with approximately 140 meetings and events, 25 new events designed to keep members in touch and engaged were added to the mix for 2019. It’s all part of the “Harness the Power” theme that was introduced at the Chamber’s annual membership meeting in January. 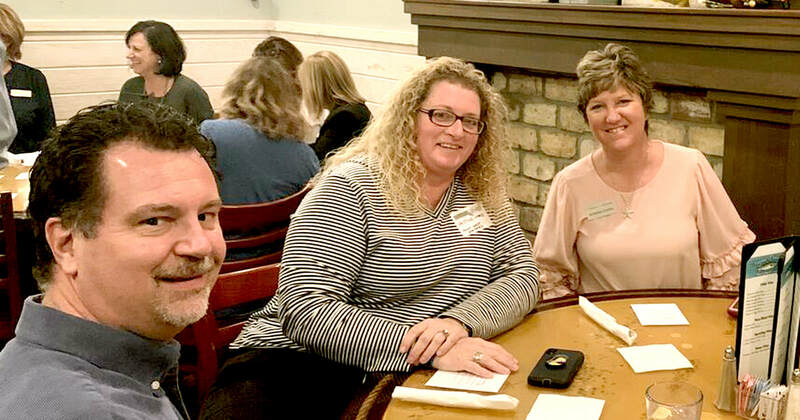 “Power” is the operative word in the two new monthly events created by the Chamber leadership to give members an opportunity to participate in customer development meetings at breakfast and lunch in addition to the 5pm - 7pm classic Business After Hours. The Power Hour Coffee Call, held on the first Friday of every month, gives members a way to hear updates from governmental officials or learn best practices tips to start their day. 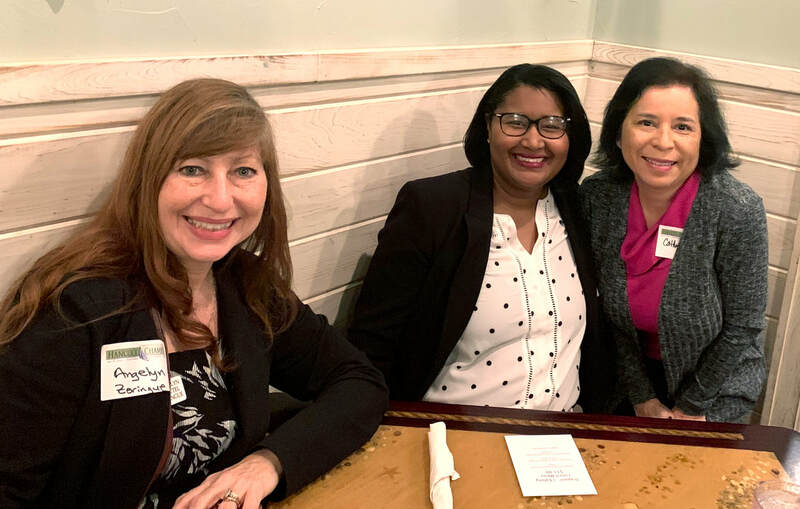 “We just did one on creating engagement on social media and will be doing another on email marketing basics in April,” said Tish Williams, the Chamber executive director. Also new this year is the Power Hour Lunch Break where members meet from noon to 1pm at a different restaurant every month. 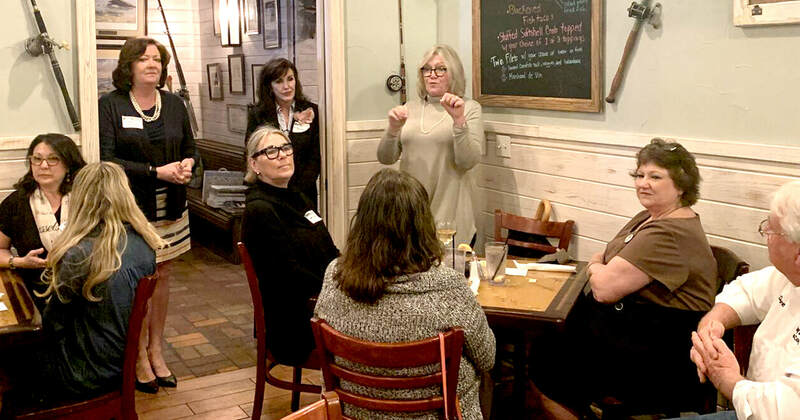 Held the second Tuesday of each month, “This meeting helps to generate revenue for the hosting restaurant and gives members an opportunity to connect with people to grow their business,” Williams said. April’s Power Hour Lunch Break will be at Cuz’s. The Chamber also has a major new event in the works that’s being spearheaded by the Relocation Committee chaired by Regan Kane of John McDonald Realty. The Hancock County Parade of Homes will showcase some 26 homes scattered throughout the county. It’s set for noon to 5pm on April 13 to tie into the Second Saturday Art Walk. Williams said this inaugural home tour will bring potential home buyers to the county and also create more traffic for merchants during Second Saturday. To sweeten the tour, participants will be eligible to enter into a drawing at each house to win a $2,500 new-home-owners package giveaway. 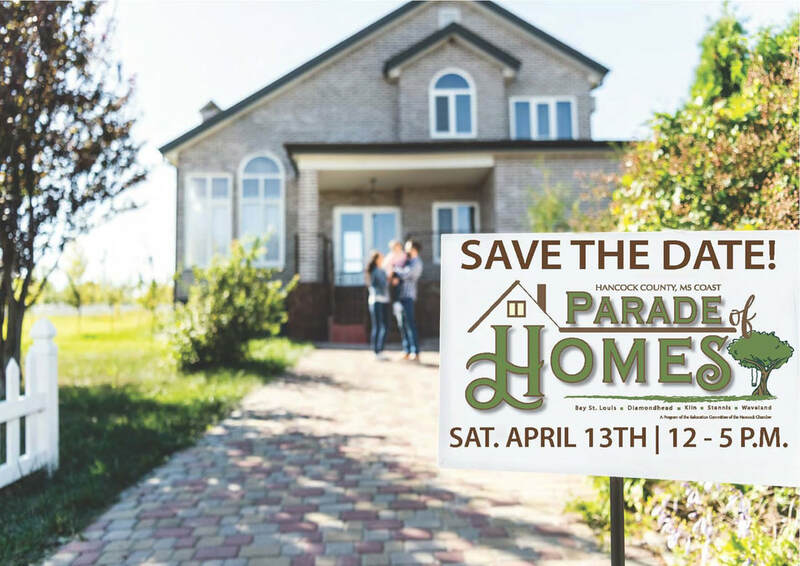 The Parade of Homes will be marketed throughout the region, from New Orleans to Hattiesburg. To find out more go to hancockmsmyhome.com after March 29. 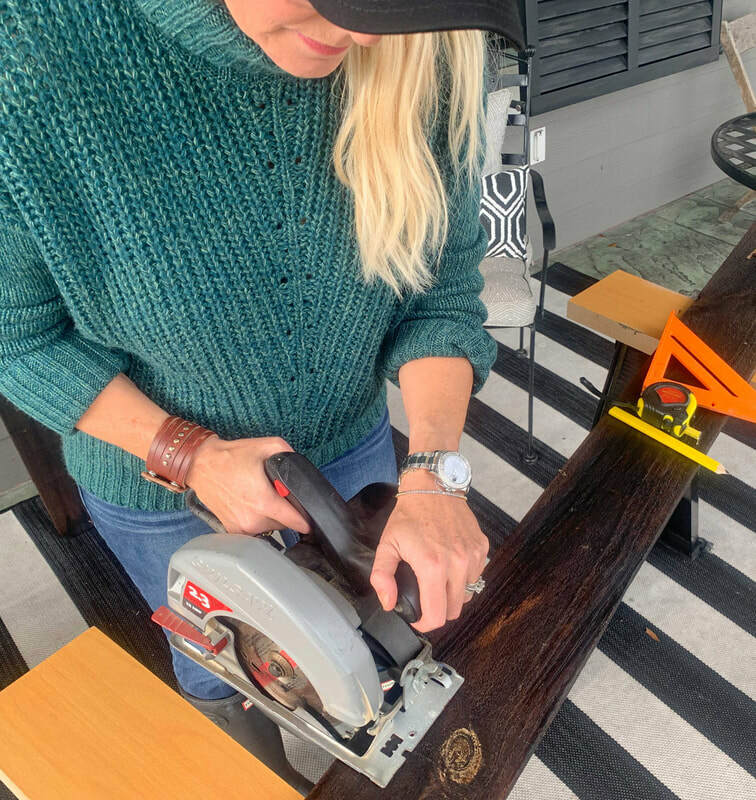 Some reclaimed wood, a few simple tools and a little sweat-equity equals a clever, one-of-a-kind project from our own DIY diva. Hello all of you “Do-it-yourselfers!” I’m so glad you stopped by to see what I’ve been up to. 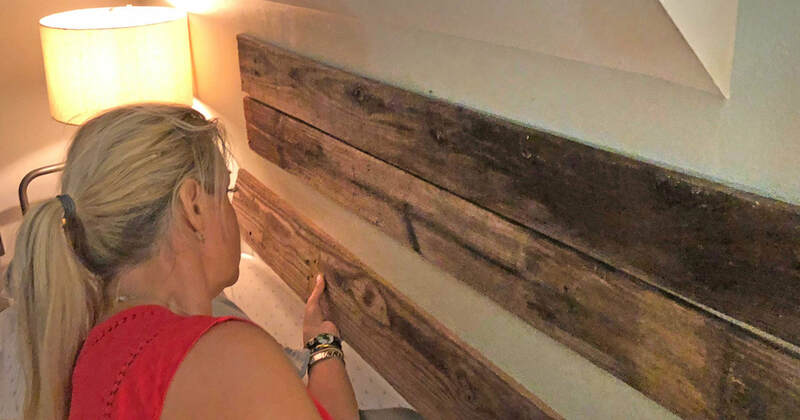 Let’s get started on building a headboard out of recycled wood. ​The type of wood you want to use is up to you. Any hardware store will have various sizes, colors, textures, etc. But you know me! 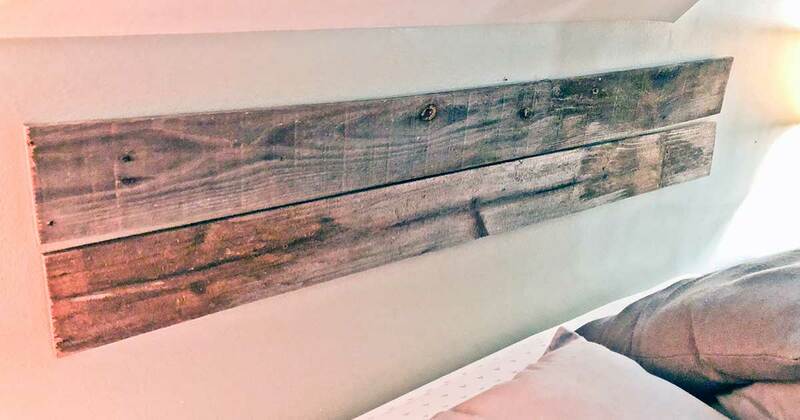 I chose to use old fence boards. I like the unique “weathered” appearance the boards provide. Use your creativity to create the style you like best! 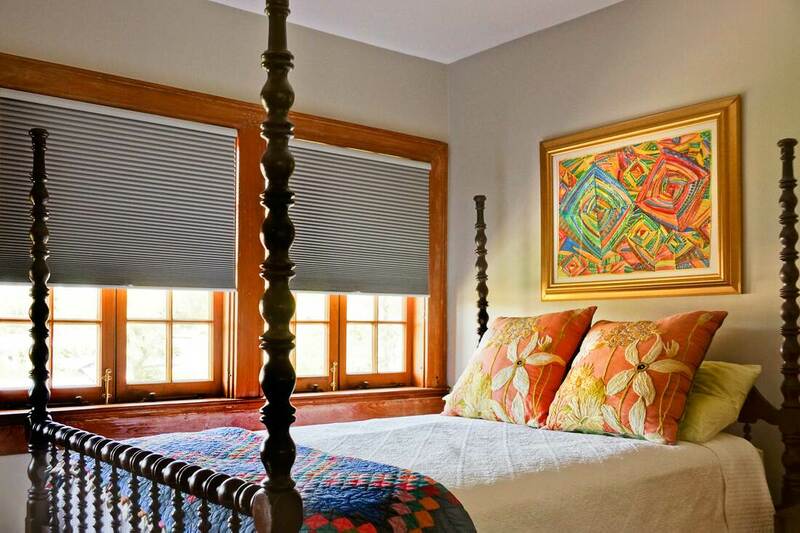 ​Measure the bed and wall space you will be covering. Consider whether or not you want your headboard to be wider than your bed or the same width. I left about an inch on each side beyond the width of my bed. Measure and cut your wood. Remember to measure twice and cut once! I usually like to stagger my pieces but this time I left the fence boards all the same length (about four feet long). Each board had its own imperfections which I love because we too, have our own imperfections. 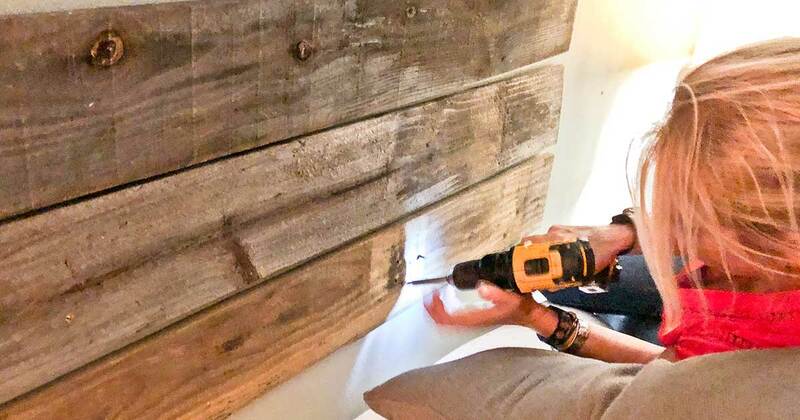 Using either a drill or a nail gun apply the fence boards to the wall. I used three fence boards for this project based on the amount of space I had available. There you have it! It really is as easy as 1, 2, 3! The most difficult part of this project for me was getting the measurements correct. Now you’ll have a unique focal point in your room. I hope you enjoyed this super-fast and easy project. We’ll see you next time when we bring you more Beautiful Things! Reputed to enhance mood, help manage weight, improve sleep, and even repel bugs, essential oils are experiencing a renaissance. As a patchouli gal from way back, I am happy to have discovered a resurgence in the use of essential oils right here in our Gulf Coast neighborhood. Maybe it has something to do with the gnats. Some contend that essential oils make good insect repellent. Just the other day I ran into someone buying a Vanilla-Musk cologne at The Dollar Store as a gnat repellent. It’s apparently so popular that an entire local Little League team smells like vanilla cupcakes when they get on the field — or so I’m told. Reminds me of my high school favorite, Tabu by Dana. ​Today’s essential oils marketplace includes both essential oils —compounds extracted from plants — and oil blends with their own unique aromas (think Musk). Essential oil aficionados credit oils with the ability to support all the systems of the human body, emotionally, physically and spiritually. Oils are recommended for mood management, exercise and weight management, sleep, self care, and household cleaning—and insect repellant. The oils are said to uplift and energize, and who couldn’t use more of that? Young Living Essential Oils distributor Jamie Skladzien. Much like a living plant, an essential oil captures a plant’s scent and flavor — or its essence. As you might imagine, peppermint is associated with boosting energy and helping with digestion. 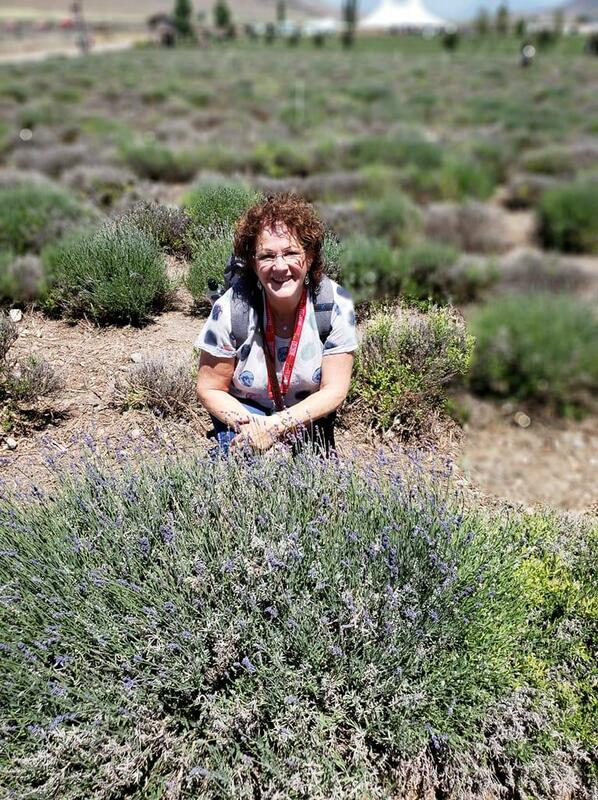 Lavender — local Young Living (YL) Essential Oils distributor Jamie Skladzien’s best seller — is used for stress release. Sandalwood is said to calm nerves, Chamomile to increase mood and relaxation, and Tea Tree oil to reduce infection. 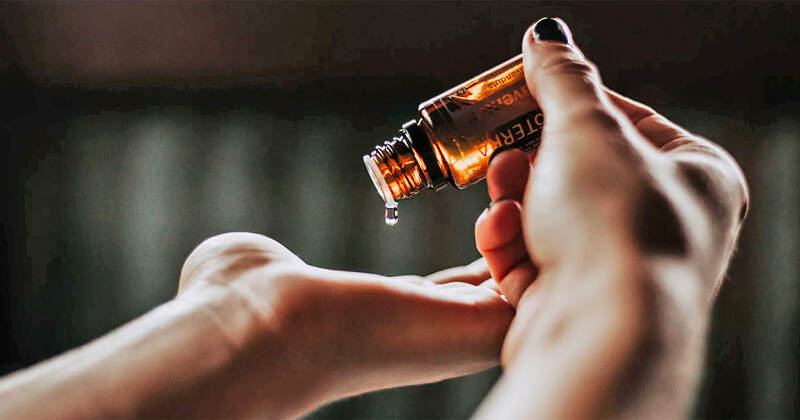 While some studies have shown that use of essential oils might have health benefits, most medical professionals are still skeptical (this Mayo Clinic article is typically cautious). Yet, testimonials abound about the benefits of aromatherapy with essential oils. Starfish Café owner, Di Filhart was diagnosed with early-moderate Alzheimer’s in 2014. She was on medication, and the disease was progressing. With the support of Skladzien, who owns Mane Salon, right across the street from the Starfish Café), Filhart began a protocol using essential oils to fight the dreadful disease. Twenty-one months later, Filhart credits the oils with recovery of her cognitive function. Jamie Skladzien with one of her favorite customers, Di Filhart. Carole Sullivan, a long-time client, has found that a combination of Peppermint and YL PanAway rid her of shoulder discomfort and help her sleep at night. 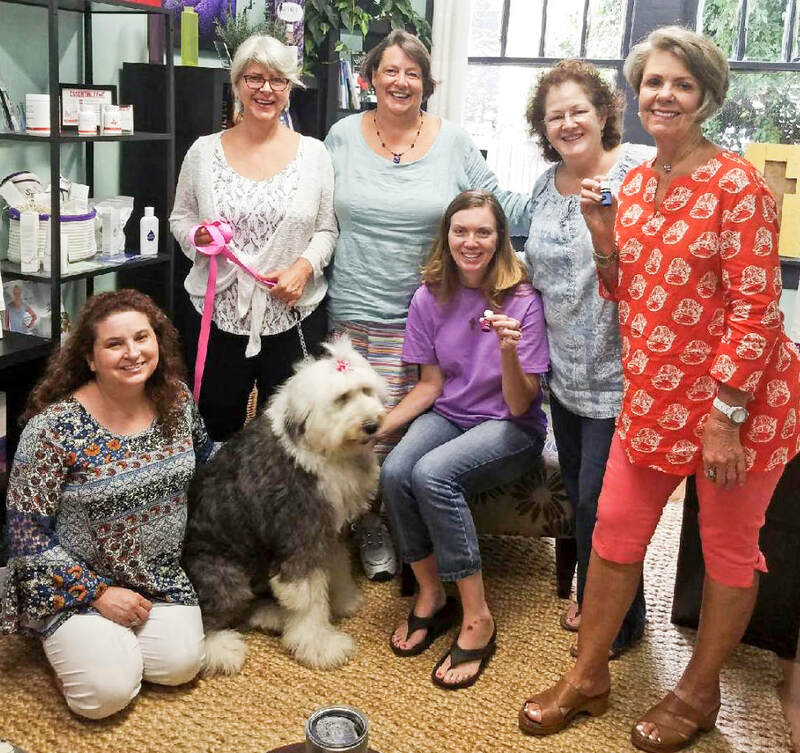 Holly Bishop Moran, Pass Christian, finds that essential oils have enhanced her prayer life and spiritual well-being. On the other hand, a 2015 Washington Post article entitled “When it Comes to Essential Oils, do your Research,” presents a still-relevant argument that, while essential oils can offer health benefits, they can also be harmful if used incorrectly. YL distributor Jamie Skladzien with some of her valued clients. As with any reputable distributor, Skladzien would tell you the same. The use of essential oils is not without risk. It is probably just common sense to test your skin before applying, to dilute oils, and to follow a doctor or expert’s recommendations for usage. Personally, rather than risk guilt by association with the musky, sweet, spicy hint of counter-culture revolution, free love, and Jefferson Airplane, my heavy use of Patchouli went the way of Birkenstocks in 2001 when I began my career as a university writing instructor at Louisiana State University. Still, I am a fan of many of several essential oil blends and deeply enamored with their metaphorical names, like Gratitude, Acceptance, Release, Peace & Calming, Grace, Dream Catcher, and Envision--you get the idea. To me, the names alone are strong medicine. I’ve found that working with the intention of a particular oil—whether I’m diffusing it or mixing it with a carrier oil and slathering it on my wrists—helps me move in a particular direction. I like to practice writing “under the influence” of different oils and blends. One of my best experiences is with YL’s Surrender, a mesh of Lavender, Black Spruce, and Roman Chamomile. The literature suggests that the blend helps cast off the inhibitions that might limit our potential. In the end, surrender is an essential aspect of creativity, right? There comes a moment when we have to cast off the inner critic and surrender to the process. Still, whether it is the alchemy of the oil blend or the metaphor of surrender that makes the difference, I couldn’t say. Maybe a little of both. ​This article should not be considered as medical advice. An easy one-hour drive from the Mississippi coast, Mandeville offers a beautiful scenery, live music and good food - making for a perfect day-trip! ​Wherever there are two cities that bump up against each other, there’s a sort of identity crisis that results from shared geography, climate, cuisine and of course, history. So if you’ve had a bit of trouble differentiating between the neighboring St. Tammany cities of Covington and Mandeville, you’re not alone. “The two kind of blend together at I-12, and it’s hard for people to know where one starts and the other one ends,” noted Renée Kientz with the St. Tammany Parish Tourist & Convention Commission. Click on the map image for directions/map to Mandeville from BSL-Waveland. As a handy reference, remember that Covington is the parish seat with its old courthouse anchoring downtown. Mandeville, somewhat smaller in population, is the one that put the “shore” in the Northshore. “If you come across the causeway, Mandeville is where you land,” Renée says. Indeed, it’s no surprise that many Mandeville residents commute to work in New Orleans and retire there. 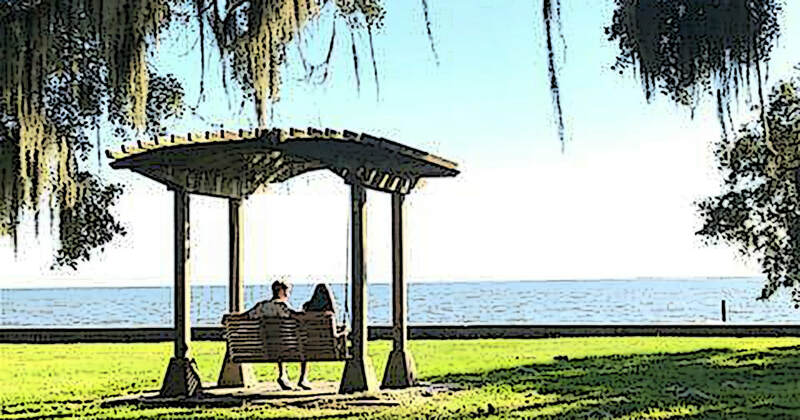 Mandeville’s sweeping lakefront is what drew – and still draws – New Orleanians, whether it’s for a nice meal, a day of shopping or sightseeing, or the place to have a new (or second) home. Visitors and residents enjoy spectacular sunsets over Lake Ponchartrain. 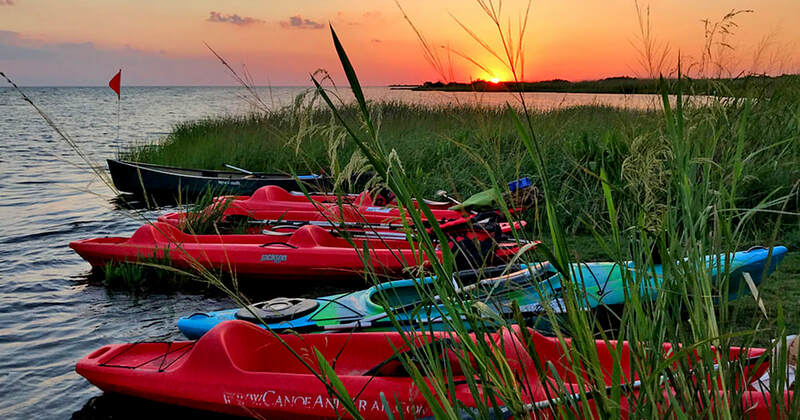 Being on the Northshore, Mandeville is the perfect jumping-off spot for a canoe or kayak adventure. “Lake Pontchartrain played a huge part in Mandeville’s history and it’s still important,” Renée says. 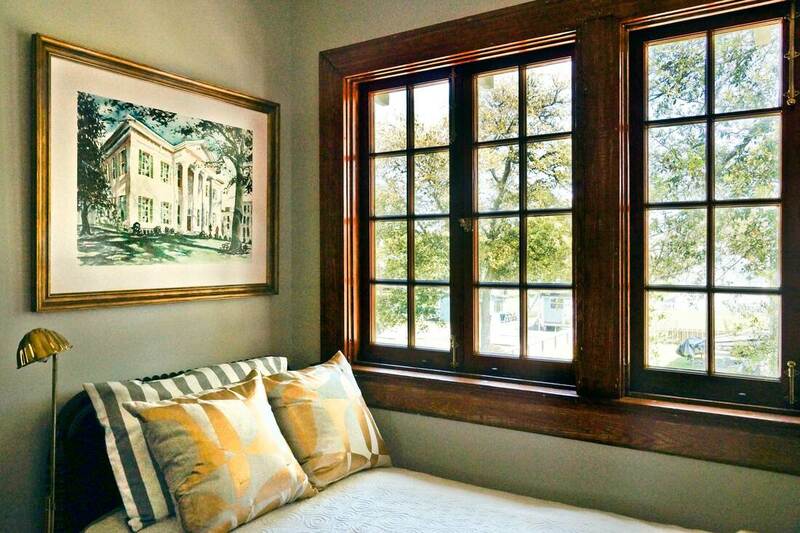 The city’s sweeping Lakeshore Drive, with its picture-perfect sunsets over the water, stately old homes and ancient oak trees, are part of Mandeville’s character. Or personality, as Renee describes the city’s inviting lakefront. 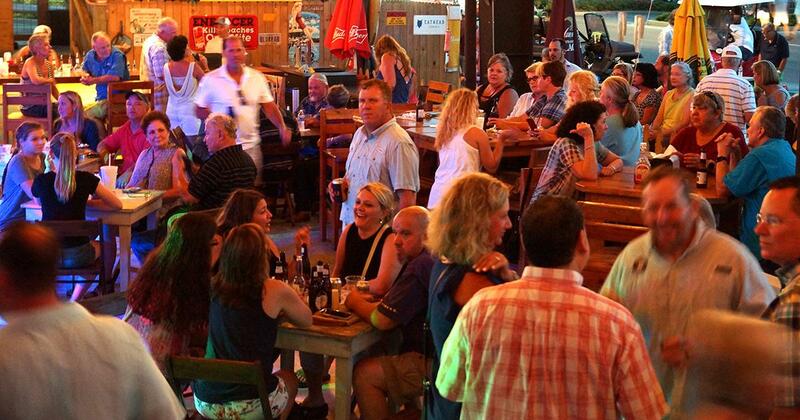 The tourism bureau notes that Old Mandeville is being discovered by more and more visitors who can find an abundance of restaurants, shops, nature outposts, festivals and live music. 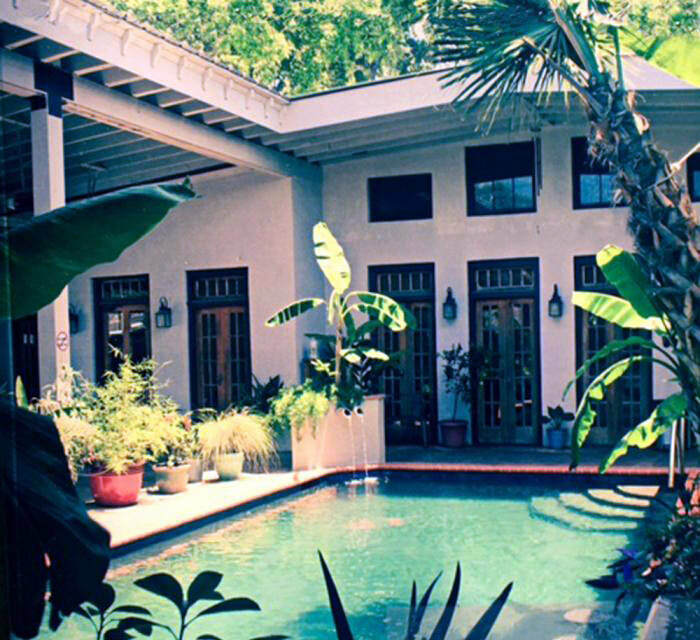 “It’s a great getaway and less than an hour from New Orleans. A lot of visitors spend a couple of days in New Orleans and a couple of days here,” Renée said. Likewise, more people are heading over from the Mississippi coast. ​Old Mandeville was developed in the 1830s by Bernard Xavier de Marigny, who was from a prominent New Orleans family. He came across the lake, bought thousands of acres and maintained a sugar mill and plantation where Fontainebleau State Park is today. “He developed that area and to the west of it as a subdivision and sold building lots to affluent New Orleanians as a getaway from the city. That’s how Mandeville developed,” explains Renée. 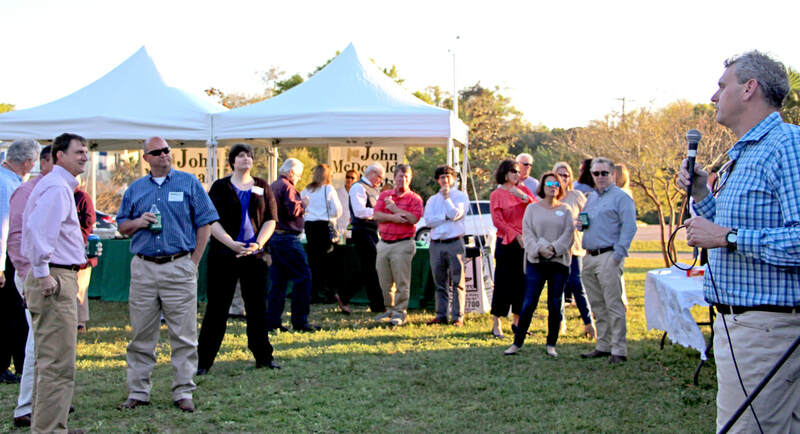 We can thank Marigny for decreeing the grassy land on the lake side would never be developed. “That green belt is like a big park for everybody,” she said. Look for the wooden gazebo to sit awhile and take all in all the scenery. 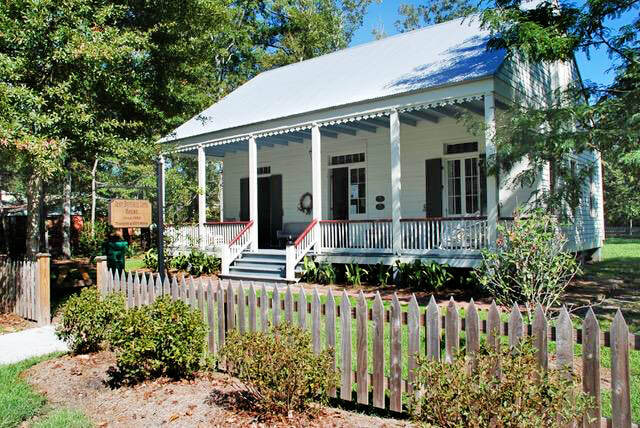 Jean Baptiste Lang House Museum, a creole cottage in Mandeville. ​Houses along the lake date back to the mid-19th century. 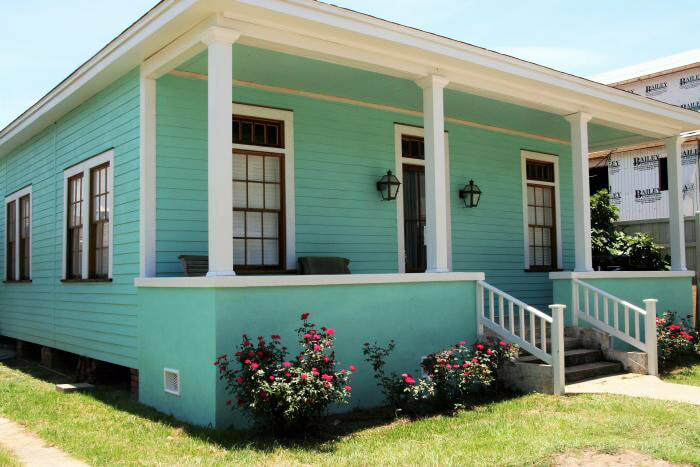 One significant structure near the lakefront is the Jean Baptiste Lang House, a Creole cottage that was moved inland from the lakefront after Hurricane Katrina and was restored as a small museum depicting life in the 1850s. The museum and gardens are free to explore. A great place to enjoy the sunset is at the end of the two-mile lakefront where you’ll find a beautiful stand of old cypress trees. Nearby is the free fishing pier that juts out into the lake, as well as picnic tables, a sand beach and playground. Sailboats from the nearby yacht club come and go on the lake. For those who want to enjoy more of the outdoors in Mandeville, there’s prime bird-watching along the boardwalks at Northlake Nature Center and trails along Bayou Castine. Look for a variety of great species including Great Blue Herons and Pileated Woodpeckers, egrets and owls. 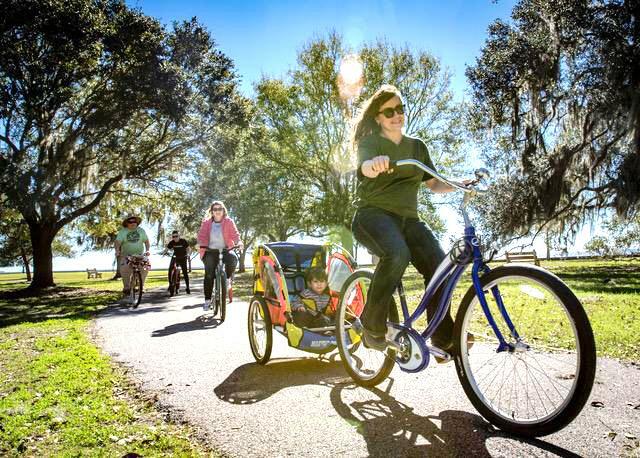 The Trailhead in Old Mandeville is a center of activity with lots of free concerts, a fun Saturday farmers/crafts market and bike rentals for the adjacent Tammany Trace bike path. Renée notes that loads of people rent bikes and ride around the lakefront or on the Trace. 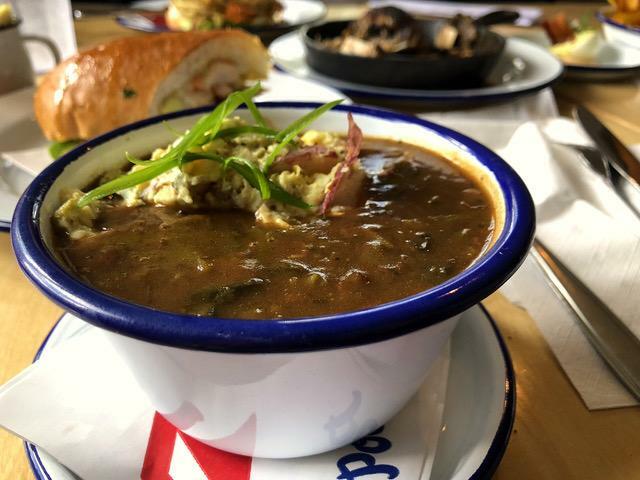 Rich, dark gumbo tempts the taste buds at Hambone in Mandeville. On the day of our visit, after some relaxing lakeshore time, we sought out a relatively new restaurant for lunch that has quickly become a favorite. Hambone has to be one of the all time best names for a restaurant. Set in a red roofed cottage at 544 Girod Street, Hambone is a find, thanks to the talents of Chef Luke Hidalgo and his wife Marci, who opened Hambone in 2018. 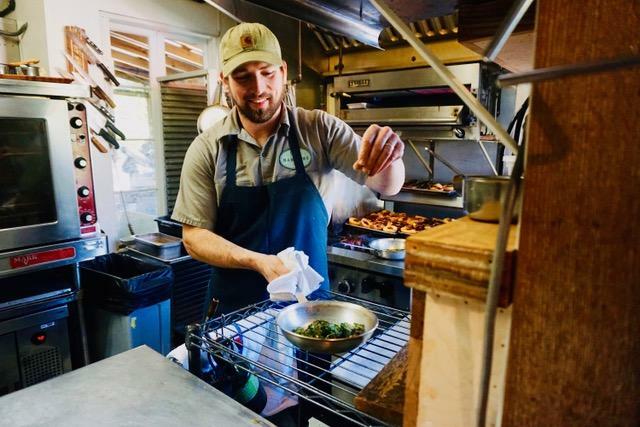 Chef Luke was the sous chef post at Commander’s Palace and executive chef at Palmetto’s on the Bayou, the popular Slidell restaurant, before the couple opened their own place. Hambone uses house-made ingredients and buys from a local bakery and local farms. The lunch menu is as tidy as the dining room, with a handful of small plates and sandwiches, sides and dessert custards. The Hambone Gumbo, listed under Small Plates along with fried boudin, deviled eggs, catfish dip, Oysters Marci and Caesar Salad, was exceptional. It was as dark as all gumbo makers try to achieve but rarely do, and topped with scoop of potato salad. The combination is enough for a satisfying lunch. The standing daily lunch special is fried chicken but at Hambone you’ll notice the dish is billed as Fried Chicken! That exclamation point is not to be taken lightly. Chef Luke’s version, a quarter fried in pieces and served with an honest to goodness biscuit and sweet pickles, deserves the punctuation. Judging from the gumbo and chicken, it’s safe to assume that everything else on the menu, from the fried pork chop sandwich to sautéed farm greens to blue crab and boudin omelet, also are standouts. Chef Luke Hidalgo of Hambone prepares one of his signature dishes. Photo by Lisa Monti. Fried Chicken with a well-deserved exclamation mark! Photo by Lisa Monti. Liz’s Where Y’at Diner is also a popular destination which has earned a huge following for its down-home food, great breakfasts (served all day) and welcoming atmosphere. Girod Street, not far from the lake, is the main street in Old Mandeville for shopping and is chock full of boutiques, galleries and restaurants. Other concentrations of shops can be found on the east and west Causeway entrances and along Highway 190. Outlet shopping is available at Premier Shopping Centers 1 and 2. The shops have it all: gifts, jewelry, clothing and shoes, kids clothes, and food items. Familiar New Orleans names such as Fleurty Girl, Acme Oyster House, Martin’s Wine Cellar and Mandina’s have outposts around Mandeville. Built in 1895, Dew Drop Dance and Social Hall has a fascinating musical history and still hosts regular jazz and blues concerts. Music fans have a couple of favorite destinations here. Mandeville is home to the Dew Drop, billed as the world’s oldest unaltered jazz hall. 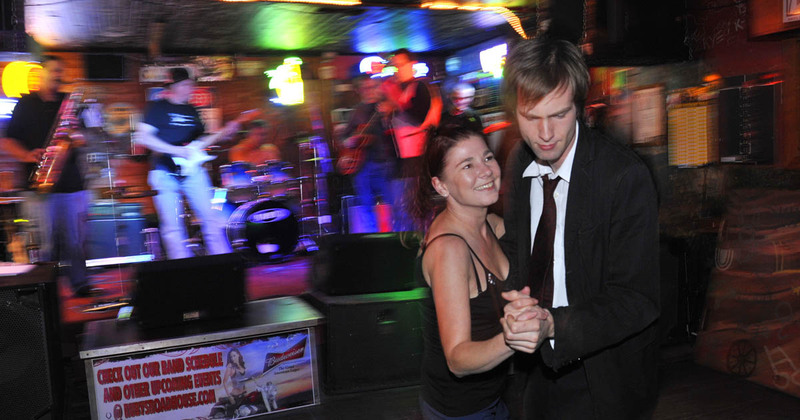 Live music is also available at Ruby's Roadhouse, which has the distinction of being called one of the best roadhouses in the country by Rolling Stone magazine. Getting to Mandeville takes under an hour and with a little planning, you can make the most of a day trip with all the town has to offer. Check out www.louisiananorthshore.com for more options. The Hummers Are Coming! The Hummers Are Coming! Coral honeysuckle is a favorite of hummingbirds in the author's yard. Hummingbirds never fail to capture attention. Just one of these tiny wonders can bring the festivities at a spring barbecue to a screeching halt by making an appearance. Our guests freeze, captivated by the hovering jewel until it zooms off to a nearby tree. ​They think it’s amazing that the yard is visited regularly by hummingbirds, and that magic must be employed to get them to perform on cue as they do. Guests who linger until dusk get the “late show,” when the birds are most actively feeding and soaring around the yard. Click here and scroll down to read archived Beach to Bayou columns! during the fall hummingbird migration. ​While 16 species of hummingbirds breed in the Northern Hemisphere, there is only one species that regularly inhabits our area, the Ruby-throated Hummingbird. The male is an iridescent green with a white underside and a red gorget (throat). As light is reflected off the gorget, it appears a fiery red; out of direct light, it appears dark. ​With wings that beat about 70 times per second, hummingbirds can indeed hover as well as fly backwards and upside down. They are interesting to watch and worthwhile to attract to your yard. There is no trick or special formula to attract hummingbirds. You just need to understand that all living things require three things to survive: food, shelter, and water. If you provide those things for hummingbirds, they will visit your yard, too. First, let’s talk food. Hummingbirds subsist on a combination of insects and the nectar from tubular-shaped flowers. While you probably won’t be able to set up an insect diner for the hummers, supplying nectar is as simple as putting out a hummingbird feeder. The feeder needn’t be fancy, or expensive; most wild bird stores and many garden centers have inexpensive feeders available. When selecting a feeder, be sure to choose one that is easy to clean, because you’ll be cleaning it often. My personal favorite is the Aspects Mini HummZinger (shown). It is extremely easy to clean and fill, and it comes with a lifetime warranty. 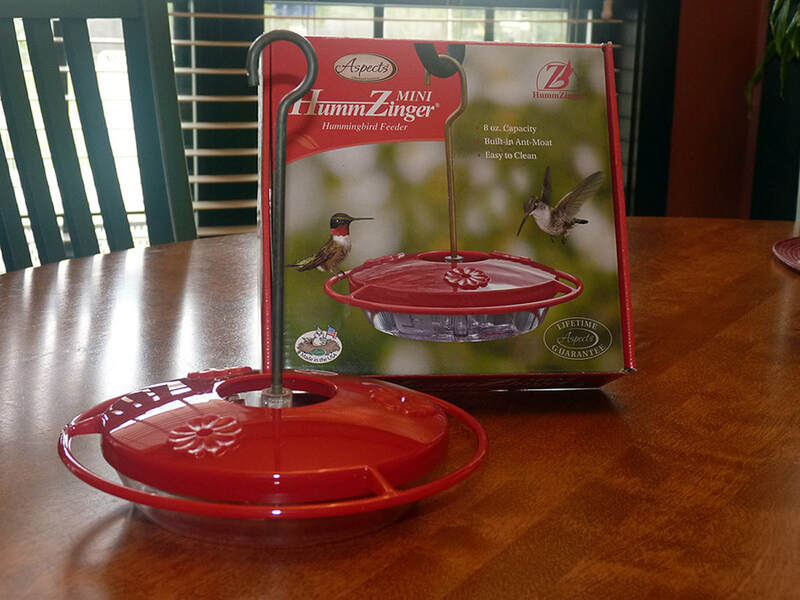 Purchase a feeder that is easy to clean, such as this Aspects brand Mini HummZinger. ​Fill the feeder with a nectar solution made from one part sugar to four parts water. Contrary to popular belief, you don’t need to boil the mixture; just stir until the sugar dissolves. Mix only as much nectar as you need at that moment. And please, don’t use commercially available nectar formulations from the home center. They cost a fortune and include red dye and other unnecessary chemicals that may negatively affect your little lodgers. Hang your feeder in a semi-sheltered location such as under the eaves of the house, if possible, to keep rain water from contaminating the nectar. Clean your feeders often – at least once a week in cool weather, and more often in warmer weather. If the nectar looks cloudy or shows any mold growth, it’s past time to clean. The usual reason for lack of success in attracting hummers is setting out the feeder too late in the spring. Reports are already coming in from neighboring communities that the first hummers are back! ​Males return first to stake out breeding territories. If they find your feeder and the area looks safe, one may take up residence. In a week or two the females will return, looking for love – and an attractive territory. Female Ruby-throated Hummingbird rests on a coral honeysuckle vine. ​Shelter is the second requirement for attracting hummingbirds. If you have numerous trees and shrubs on your property, the birds have plenty of places to construct a nest or hide from predators. Water is the third requirement. A simple birdbath can be constructed from almost anything – a plate, a trash can lid (clean it first, please), a shallow plastic bowl. Again, be sure to keep the birdbath clean and shallowly filled. In our area, your first guest should appear in early March. You may not see regular activity at your hummingbird feeder for quite some time while the birds establish their territories. ​Once you start seeing the birds, note how territorial they are: One male will not allow another to use “his” feeder. If you hang more than one feeder, try to locate them so that they are not in direct view of each other, so one male cannot monopolize two feeders. Do not be surprised if your “guests” disappear several times during the summer season. When their favorite flowers bloom, they will feed only from the flowers, rejecting your finest offering. Don’t worry; they’ll be back. Also, breeding activity may keep them from being active in the garden. But just wait: if you provide them with suitable nesting habitat, you can enjoy watching the young hummers cavort around your hard all summer long, until they begin their southbound migration in September. Their games are enchanting to watch. Juvenile Ruby-throated Hummingbird prepares to probe this coral honeysuckle for nectar. As autumn approaches, you will see less and less of your guests as they begin their long migration to the tropics. You have helped make this trip possible by supplying them with the energy they need for this arduous trip. Do not be sad at their leaving; if all goes well, the same birds may reappear next year. Fall is the time to double up on your feeders; you will probably need to refill them daily to keep up with demand. Then, as hummers migrate south from the rest of North America, get ready for Invasion of the Migrants! An entire continent’s worth of hummers will stream past, pausing before making the arduous trip across the Gulf of Mexico. ​The amazing video above was taken at a Waveland feeder in mid-September. Keep your eyes open for rare migrating Western hummingbirds that occasionally lose their way and end up along the Gulf Coast. Hummingbirds make an attractive and interesting addition to any summer garden. It is well worth your while to invite them to spend their summer vacation at your “resort,” where they fascinate and captivate. All it takes is a few pennies’ worth of sugar – and a little patience. 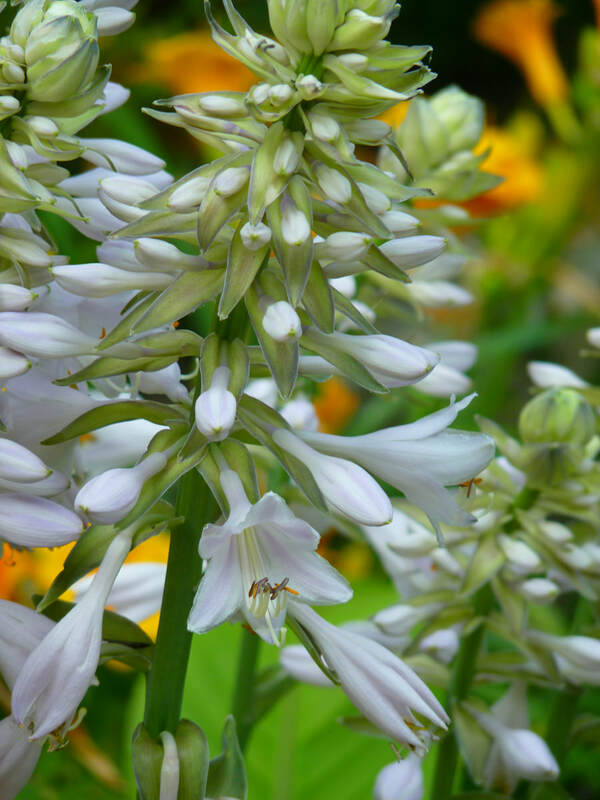 Hostas, not usually planted for their flowers, nonetheless attract hummers with their trumpet-shaped blooms. The right food plants can make your yard more attractive to hummers. If you are planning on updating your landscaping, you might want to keep these plants in mind. After a fulfilling career in education, Davis "retired" to a second career in social service, one that has both uplifted and inspired the lives of those around her. Spoken like an award-winning social worker. Upon further thought, she sums it up with, “making the world a better place.” Being a good neighbor means making the world a better place, and Pat Davis knows that she has been fortunate enough to do just that. Born to parents in their 40s, Davis had the benefit of being a much-loved and welcomed child. She uses the word “spoiled” to describe her upbringing, mentioning a father who was willing to help her pursue any and all interests, once driving young Patricia to weekly tennis lessons 50 miles away. ​“I lucked out big in the parents and friends department,” she says. Luck can only take a person so far. Davis’ long strand of academic achievement garnered her the ability to work on issues that have interested her at the local, state, and global levels. She began with a bachelor’s degree in English from the Woman’s College of the University of North Carolina, her home state. Later, she earned a master’s in English Literature at Eastern Michigan University, Ypsilanti; a MSW at the University of Michigan (Ann Arbor); a PhD at the Tulane University School of Social Work in New Orleans; and a master’s of Public Health at Tulane University’s School of Public Health and Tropical Medicine. Pat Davis and friend Liz Maio, volunteering at Bridgefest, 2009. With an Associate Professor of Clinical Pediatrics position at the Tulane School of Medicine came the opportunity to teach and take full advantage of the tuition reimbursement plan available to the children of Tulane faculty. In practice, Davis was the only PhD on the Pediatric Faculty among a host of MDs. Her position was funded by a grant to encourage medical schools to take a “biopsychosocial approach” in their training programs. In other words, Davis emphasized the importance of understanding human health and illness in their fullest contexts. She taught about the psychological and social issues in health care while the MDs focused on biological aspects. In the last phase of her pre-retirement career before moving to the Bay, Davis directed the Medical Social Services Division of the Louisiana State Office of Public Health and the Department of Health and Hospitals for almost a decade. 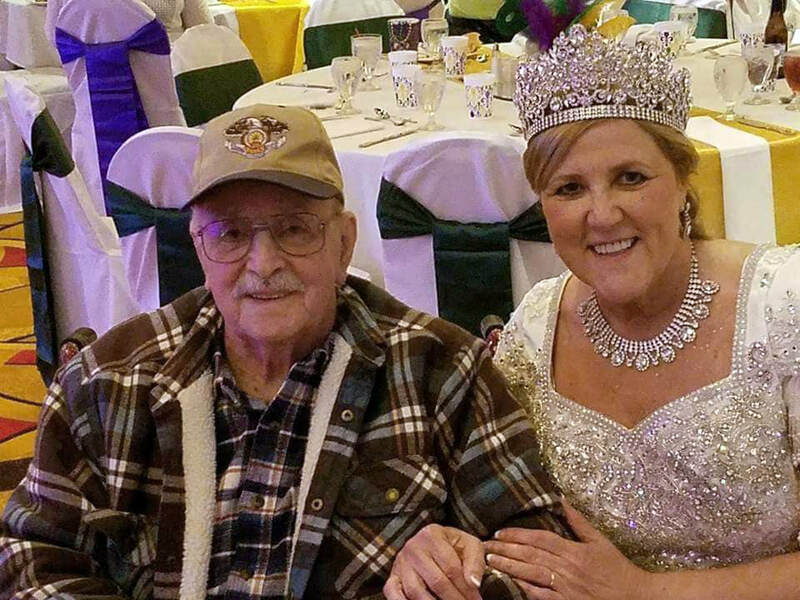 Upon retirement, she fully intended to relax and enjoy their home on Felicity Street in Bay St. Louis with her husband, Richard Waldsmith, a chemical engineer. The couple designed and built their home from the ground up. She laughs as she remembers the process. “We had a strict building inspector at the time who told us we couldn’t do our own electrical wiring. Now, my husband was smart and could read directions,” she explains, “so he told the building inspector that he would like to take the same test as those licensed to wire. A self-described “junker,” Davis pointed with pride to two doors opening onto the back yard. 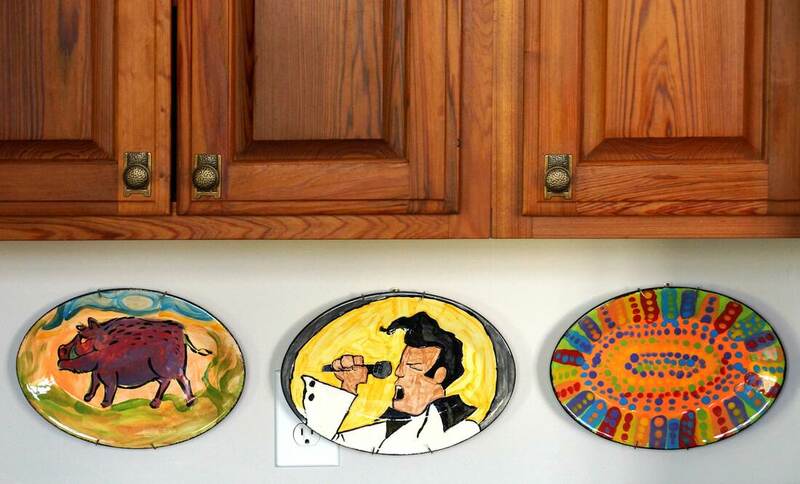 She purchased them from a Green Project salvage store in New Orleans, not having a use for them at the time. 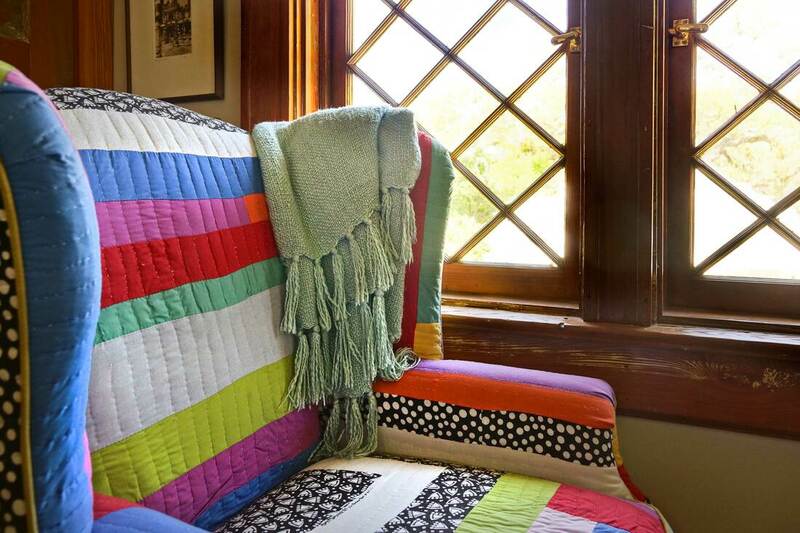 Several years later, they became a focal point in her home. Davis says that most of the house is built from recycled matericals, including the windows, which were found at Carrolton Salvage Yard (also in New Orleans). 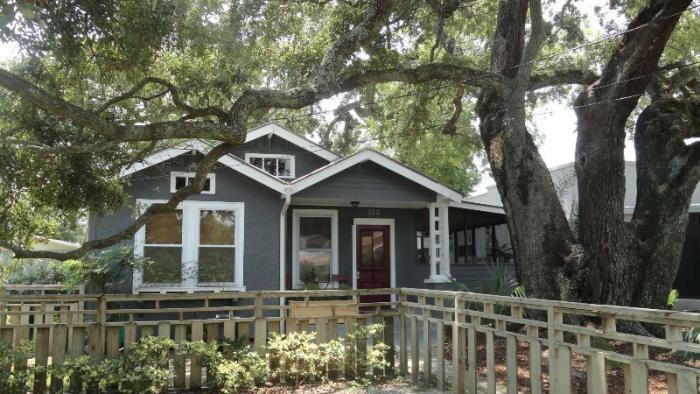 As we segue back to the Davis family’s move to Bay St. Louis, “Dr. 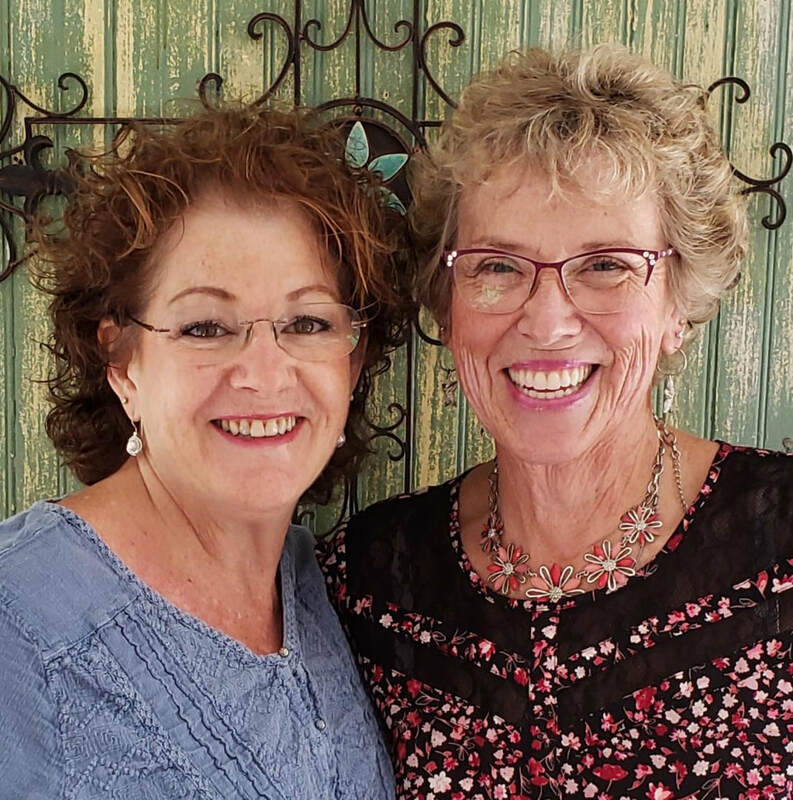 Pat,” as she is affectionately known, recalls that Betty Spencer, her dear friend and social worker, encouraged her to teach at the University of Southern Mississippi. Together the two women forged community alliances that very much helped to make this corner of the world—at the very least—a better place. While Davis had more experience in domestic violence and homelessness issues, Spencer’s main expertise was in mental health. Davis also had extensive experience working in New Orleans organizations dealing with violence against women. In the early 1990s, Mayor Mark Morial appointed her to the city’s first task force on domestice violence. She had also represented the Louisiana Health Department on Unity for the Homeless. Davis credits Spencer with involving her in a group that founded the Open Doors Continuum of Care for the Homeless coalition and for her service as a board member for eight years. “Betty disrupted my intention to sit on my rocking chair and rest on my laurels rather than take an active role in Mississippi advocacy activities,” says Davis. Open Doors is still a thriving organization dedicated to raising awareness by building bridges within the community and acting as a unified force dedicated to preventing, reducing, and ending homelessness. Davis had served on the Louisiana National Association of Social Workers (NASW) board and had not planned to be so involved in Mississippi. 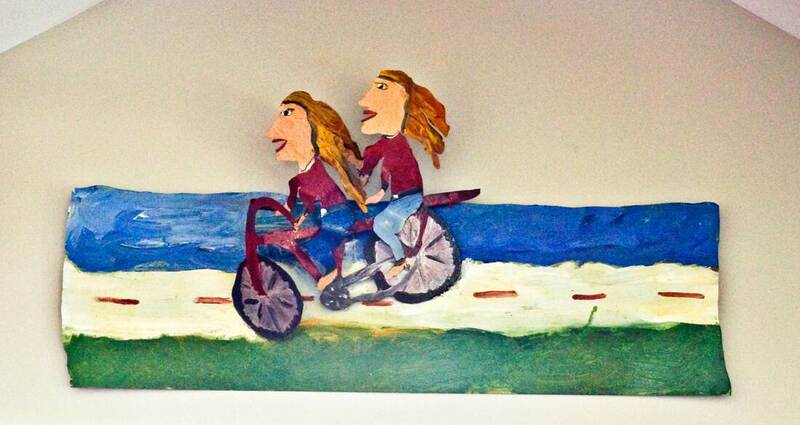 Yet, Spencer insisted that her friend also become an active member in the local NASW Program Unit. That led to Davis serving on the Mississippi State Social Work Board of Directors for two terms. 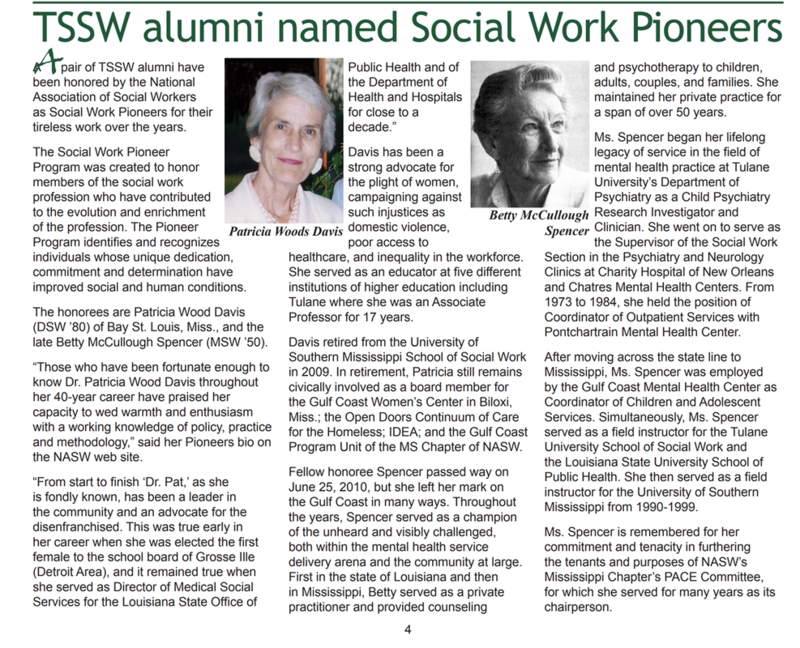 Davis adds that it was a great source of pleasure that she and Spencer were named NASW Pioneers in the same group of ten “inductees” in 2012. Unfortunately, Betty had died in 2010 and was not able to attend the banquet in the NASW Building in Washington, D.C. In 2015, Davis received the Woman’s College Legacy Award from the Woman’s College of the University of North Carolina, her undergraduate college. Dr. Pat has many other awards to her credit, including the Mayor of New Orleans’ Citizen of Merit Award for Contributions to Domestic Violence Prevention (1993) and the coveted National Association of Social Worker’s (NASW) Schenthal Leadership Award, Orleans Region (1995). Also, Davis is credited in Feminists who Changed America 1963-1975 (Barbara J. Love) for her work on behalf of the Equal Rights Amendment, her presentations on women’s issues at universities across the country, and her advocacy work on behalf of healthcare services for women. Davis's husband Rich passed away in September of last year. Now Davis seems to have finally retired and finds herself catching up on her reading. She calls herself an “audio booker” and explains with a touch of self deprecation that she tries to alternate between light reading—mostly detective stories with female protagonists—and biographies and autobiographies, Ruth Bader Ginsberg: A Life, the latest. In Dr. Pat’s experience, following her passion has been a good guide for living. She's made significant contributions toward her goal of "making the world a better place," while enriching her own life - and those around her - in the process. 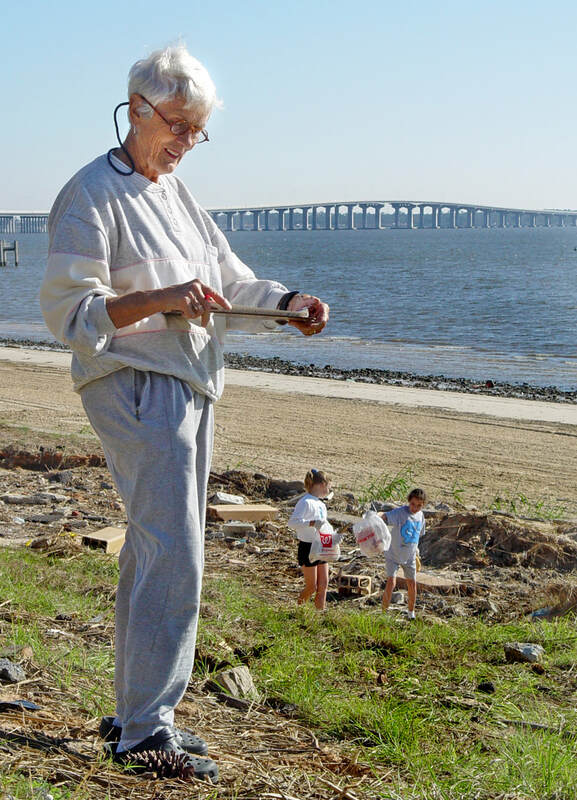 Davis supervising her youthful team, during an annual Coastal Cleanup event. A few times a year, the iconic Second Saturday Artwalk event in Old Town Bay St. Louis adopts a theme. The “Souper Mudfest Second Saturday Artwalk" - one of the most popular events of the year in Bay St. Louis - will take place March 9, rain or shine. Enjoy gourmet soups from some of our fine area merchants and leave with a one-of-a-kind handcrafted bowl! ​Over the past twenty-three years, the monthly artwalk has become one of the most popular events in the region. Old Town stays lively all day, with many merchants and restaurants offering specials. Bowls for March 9th's Souper Mudfest Second Saturday Artwalk will be sold on the green space at Main and Second Street beginning at 3:30pm. A wristband will be given to all who purchase the official bowls. 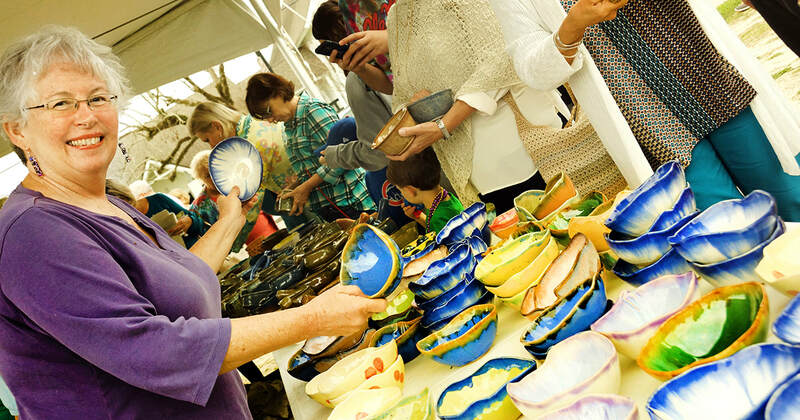 Bowls have been handcrafted by more than a dozen local potters and sell for $20 each. Bowl-buyers are provided with a list of local merchants where they’ll be able to sample gourmet soups throughout the evening - for free! Just show your wristband and hold out your bowl. As usual, two Hot Spot businesses will be featured: the Ulman Tea Room, 317 Ulman Avenue, and Dan B's Restaurant and Bar, 109 South Beach Boulevard. Read more about them below! 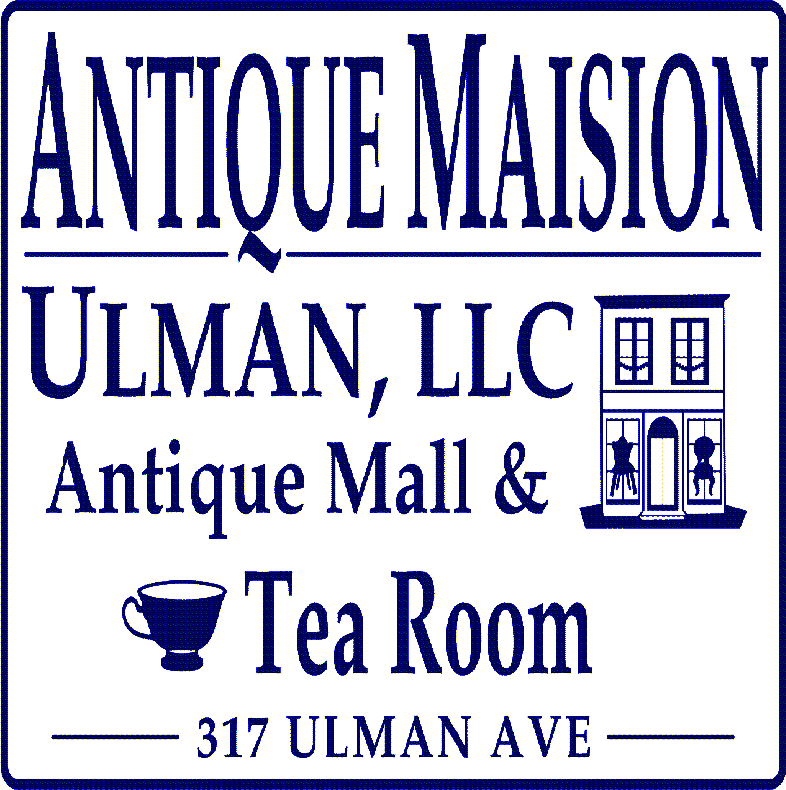 The Ulman Tea Room is truly one of a kind. This hidden gem is a tea room and antique store combined. There are so many beautiful antiques here, but what is most special are the teas, homemade desserts, and high tea service. ​At this special spot, you can experience a true high tea, similar to those in England. Transport yourself “across the pond,” and make reservations for The High Tea Windsor, which includes a pot of tea, finger sandwiches, mini quiches, mini potato salads, mini artichoke delights, chocolate covered strawberries and cherries, mini ambrosia salads, and mini scones with lemon curd. High tea reservations must be made 48 hours in advance. This scrumptious experience costs $20 per person. The beautiful main room accommodates 35 guests and the private party room accommodates 20. “We do have an outside eating area under the historical tree in the back deck that you can eat under in the springtime,” Missy Geisel explains. Sylvia and Missy strive to make sure that their guests have a lovely time in the tea room. There are even hats, pearls, and gloves available for use to complete the full high tea experience. Everything is homemade by Missy Geisel, Sylvia’s right hand woman. She does all of the cooking and cleaning for the tea room, and has made it her passion to create an experience for the guests through her tasty creations. She makes a new dessert each week, so that there is always something new for guests to devour. ​A little known fact is that you can come in for just tea, scones and dessert without a reservation. Tuesday through Saturday from 10am-3pm, the tea room offers a casual tea, where you can choose from one of their many delicious options, including the ginger peach tea, for which they are especially well known. “You can come in and have high tea and then shop, too… not very many places you get to eat and shop,” Missy says. 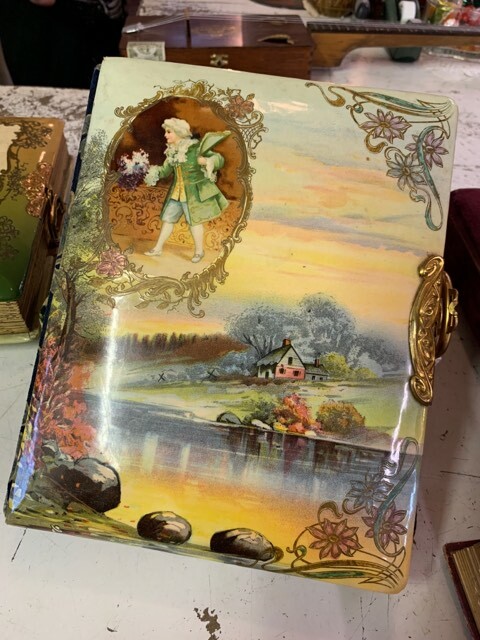 After you experience the Ulman Tea Room, you can take a look around the antique shop to discover one of the many treasures that they have to offer. 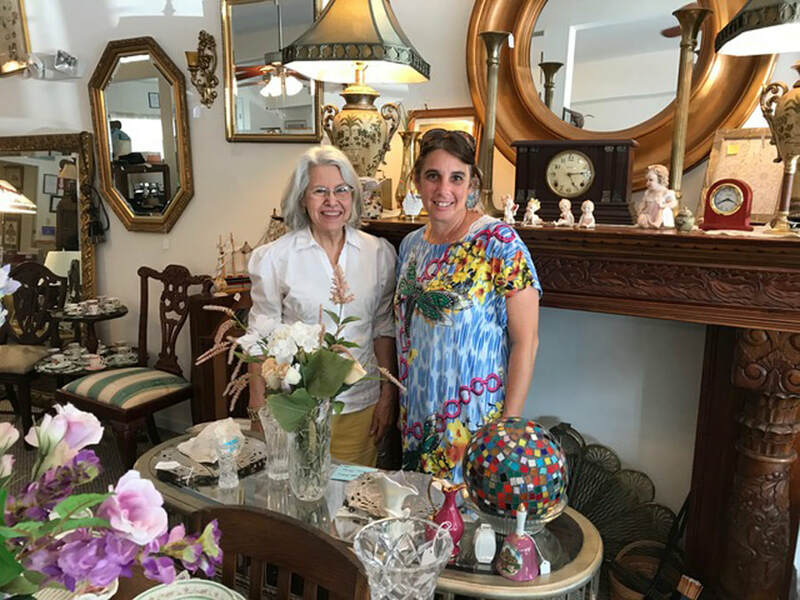 The antique room is open Monday through Saturday from 10am-5pm and features “nautical decor, vintage jewelry, antique furniture” and much more. 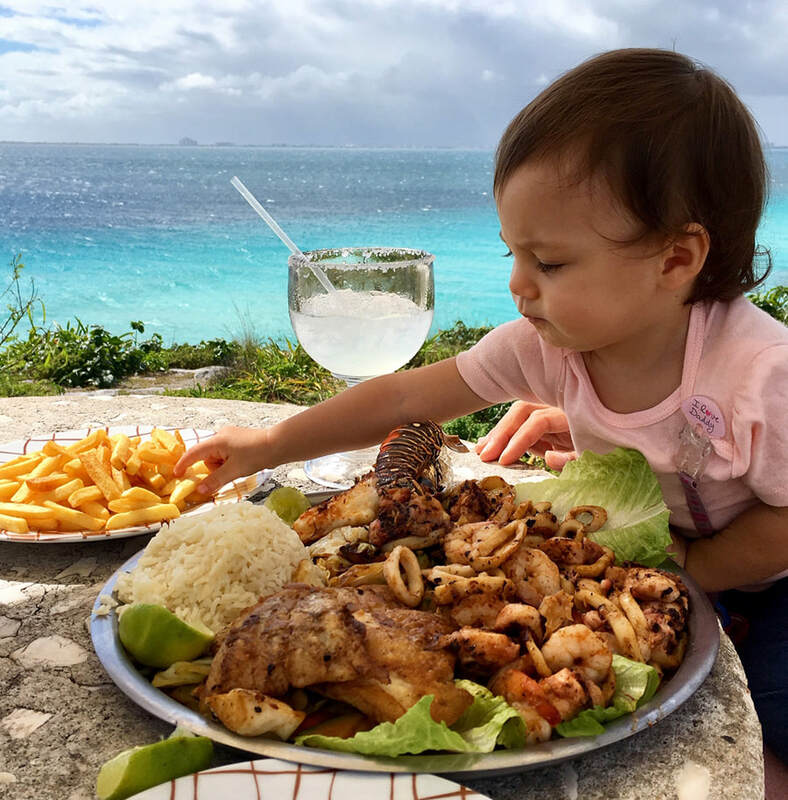 Dan B. Murphy’s Restaurant and Bar is the perfect casual spot for delicious food, tasty drinks, and live music with an even better view. Daniel Murphy was inspired to re-open Dan B’s after Hurricane Katrina destroyed the original, which opened in 1981. “We bought it from my grandparents in 2005,” he explained. In October 2017, he resurrected a classic, bringing back all of Old Town’s favorite dishes, including his grandmother’s roast beef po’boy, which she created thirty years ago. The atmosphere gives off a casual fishing camp vibe, “nothing fancy,” with expansive dining rooms on the second and third levels. The ground-level hosts the main bar and stage area. Every Friday and Saturday night, enjoy a live band to accompany your food and drinks. 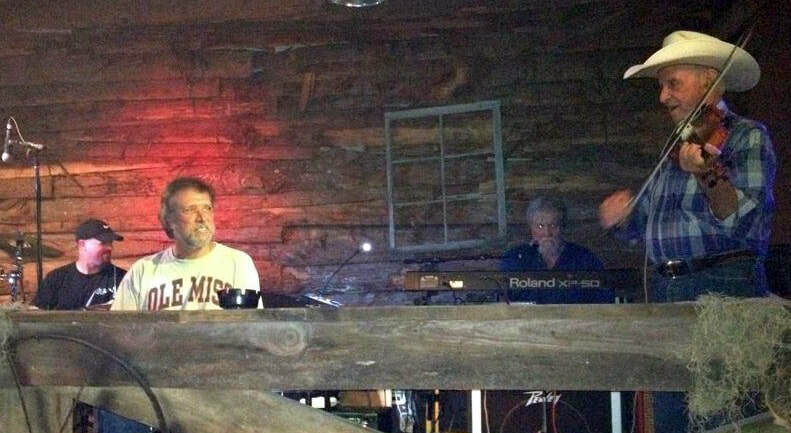 They strive to host local bands to play at the restaurant. For the Second Saturday Art Walk on the 9th, enjoy live music by the “All Nighters” sponsored by The People’s Bank, Hancock Whitney Bank, and The First. Dan B. Murphy’s is open Mondays and Wednesdays from 11am - 8pm, Tuesdays from 11am - 2pm for lunch, Saturday from 7am for breakfast until 9pm, and Sunday from 7 am, also for breakfast, until 8 pm. On the weekends, enjoy bottomless mimosas with your brunch from 7am - noon. There are daily lunch specials as well as boiled crawfish every weekend. 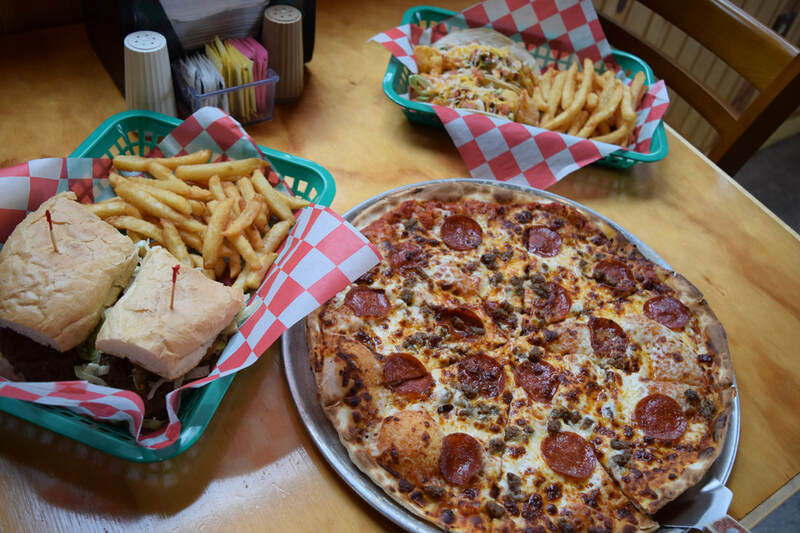 On Friday and Saturday, dine in and order one of their dinner specials of either pasta, steak, specialty quesadilla or pizza. Daniel B. Murphy's is a great place to experience casual dining and great atmosphere in the heart of Old Town Bay St. Louis. Enjoy them as a “hot spot” all month! As a professor, writer Scott Naugle taught more than literary criticism; he allowed his students to read for the sheer joy of the written word - even Faulkner. The assignment of my classroom had to be in error. As a first-time adjunct professor in 2013 at Tulane within the main uptown New Orleans complex, I expected to be assigned to a physical space at the rear of the campus, in a damp building with a pungent odor, no air conditioning, and a tattered Reelect Nixon campaign poster on the far wall covering unrepaired cracks. There would be a single flickering and crackling fluorescent tube lighting the room. Through a clerical oversight, I’m sure, my “Reading the Modern South” class was scheduled in Gibson Hall. Gibson Hall faces St. Charles Avenue overlooking Audubon Park. ​The oldest structure on campus, it was built in 1894 in the Richardsonian Romanesque style. Thousands of massive chiseled stones create an impressive façade exuding intellectual gravitas. The office of the university president and his staff occupy the lower floors of the building. The students arrived on time for the first class. Several carried clean, crisp notebooks while the remainder snapped open laptops. There was an almost equal number of men and women, nine in total, all either juniors or seniors, anxious survivors of the undergraduate milieu. We bantered a bit, I believed it important that they be relaxed with me, and then I handed around the course outline. Streetcars slid by outside the large windows, the clattering barely audible. I commit to work with you in developing a set of critical analysis skills as you read literature. These skills include close reading, methods to critically analyze the text, comfort with literary vocabulary and terms, identification of historical and cultural issues, and several tools to interpret texts. You are encouraged to speak your mind in class and to write beautifully and convincingly in support of your thoughts. 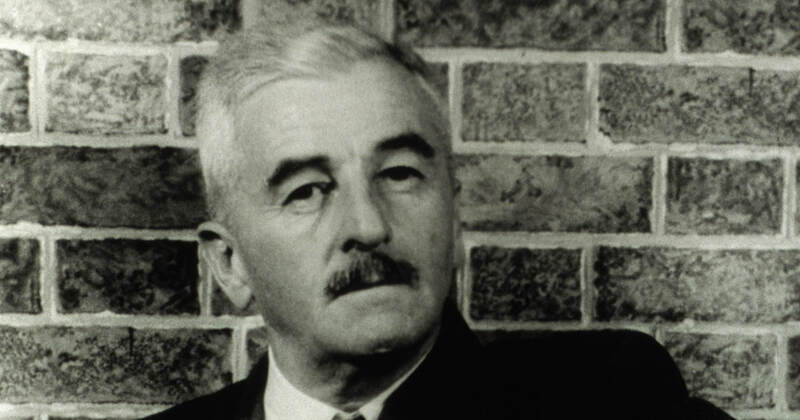 On that hot, humid night in early June as I discussed the course novels and supporting material we would read and write about, there was an audible group groan when I mentioned the inclusion of William Faulkner’s Light in August. Silence. And then I asked why. All shook their heads in agreement looking directly at me to gauge my response wondering, I assume, if they had crossed a line. I experienced a flashback at that moment to two years earlier when I was a graduate student in a class on literary theory. We read Emily Bronte’s Wuthering Heights, a beautiful and haunting novel if left unmolested by forced interpretations through various lenses of theoretical conjecture. Literary theory attempts to offer avenues to understand a work of fiction through culture, historical forces, or the functioning of the psyche, among other approaches. Specific types of criticism include New Criticism, Structuralism, Deconstruction, Feminist Theory, and Marxism, among a salad of many others. The professor, let’s call him Dr. Wheezy, coached us each week to view Bronte’s work through a specific type of theory. It was Feminist Theory one week and then Cultural Materialism the next. Rather than enrich the reading of the novel, it became a series of weekly calisthenics in reductivism, marginalizing a beautiful work of literature into a constricted cardboard box. As an example, a weekly assigned reading was Terry Eagleton’s Myths of Power: A Marxist Study of the Brontes. I vowed at that moment, should I ever be fortunate to teach, that I would work with students to read with delight, insight, and to marvel in the beauty of the written word. I sympathized with the groaning in class about Faulkner and offered a pact. If they would indulge in reading Light in August, we would end the course with a novel of their choosing. Faulkner, I explained, need not be complex. Underneath and in the spaces between the words is a rip-roaring story with much to say about race, religion, the human spirit, and the South. 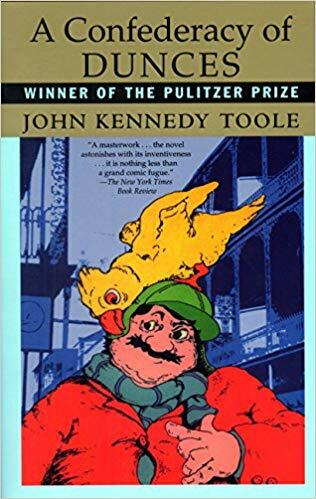 The class selected John Kennedy Toole’s A Confederacy of Dunces. In contemplating the syllabus for the course, my desire was to show different ideas and cultures within what is mistakenly perceived as a stagnant, singularly-minded South. 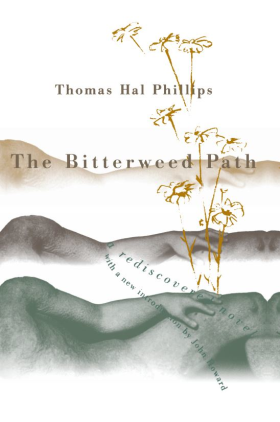 We studied Thomas Hal Phillips’ The Bitterweed Path, about gay love in the mid-twentieth century rural South. Phillips was a closeted Mississippian and Republican political operative. 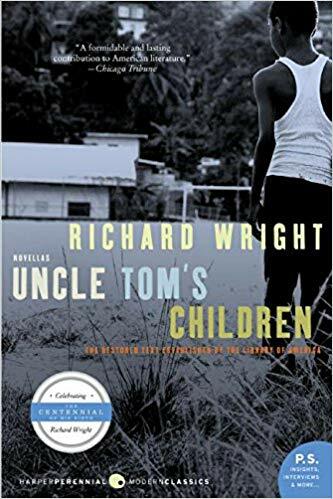 Uncle Tom’s Children by Richard Wright was included as a window into the hatred of the last century and the different, yet still as vigorous, forms it takes today. 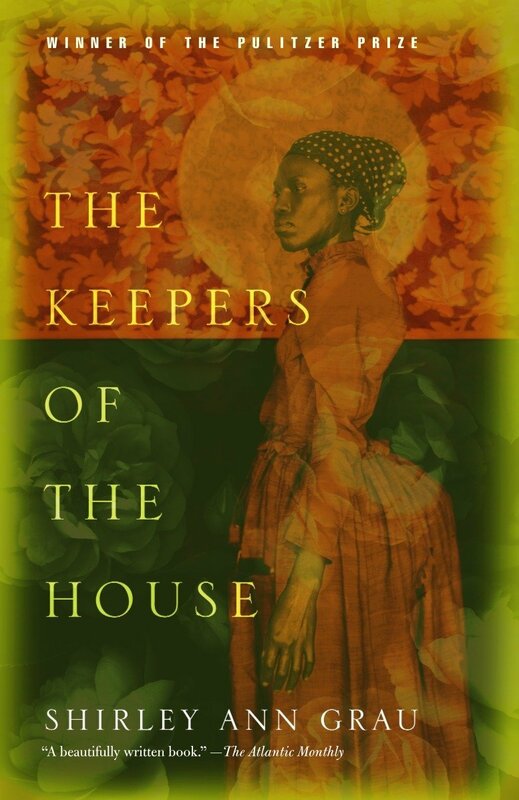 ​Shirley Ann Grau’s Pulitzer Prize-winning The Keepers of the House was a springboard for discussion about our changing values and the hypocrisy of racism. 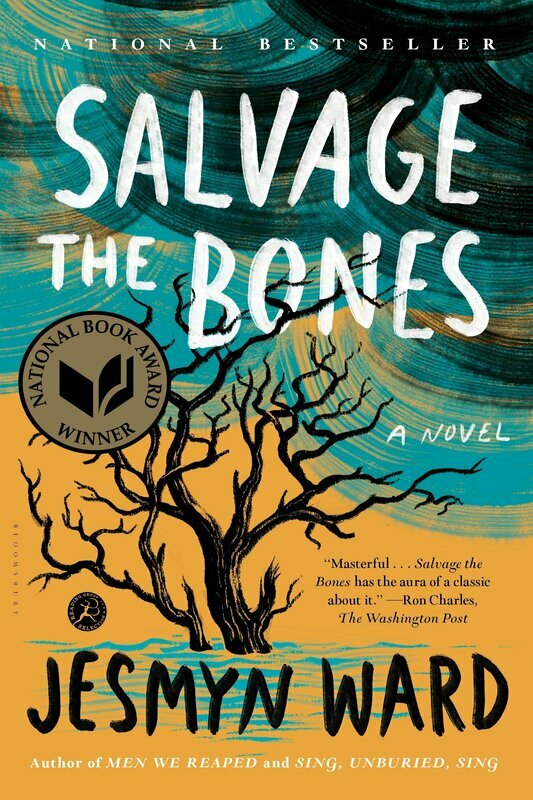 To bring the readings into the present day, we read the marvelous Jesmyn Ward’s National Book Award-winning Salvage the Bones. I don’t know how and even if it is possible to measure success, but several students voluntarily wrote their end of semester research papers on Light in August.